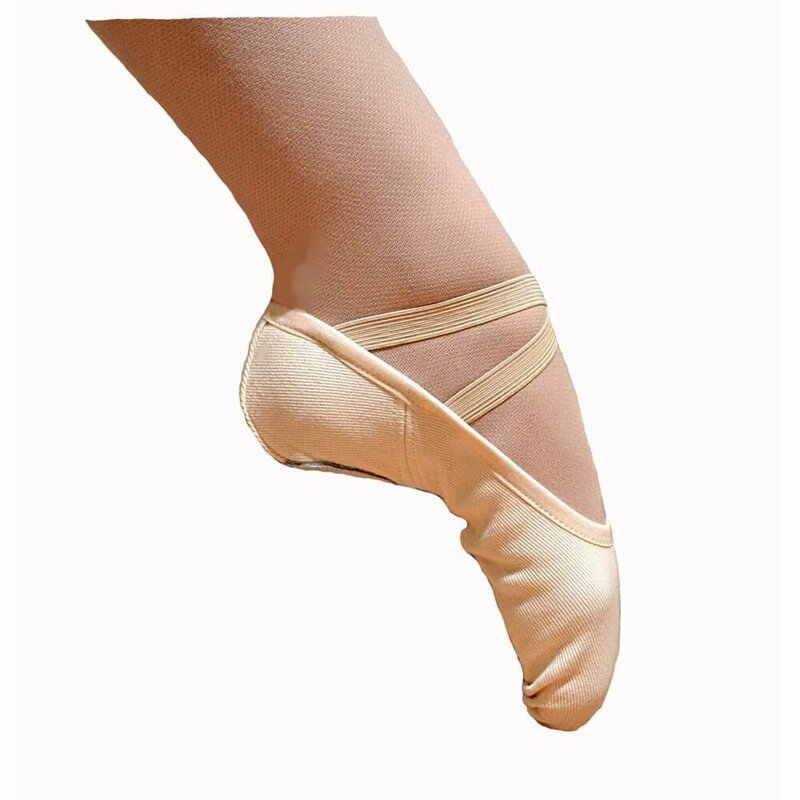 Latest Ballet Dance Shoes styles for sale online. 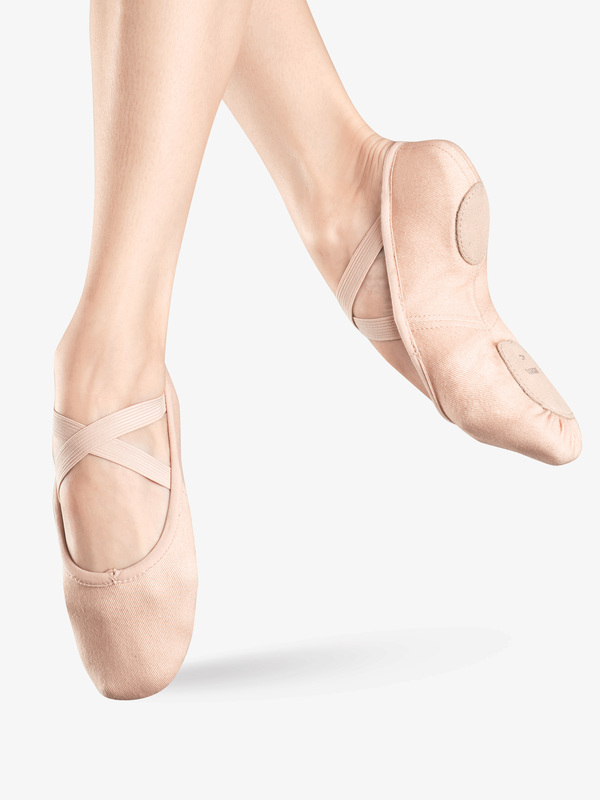 Bloch Adult Elastosplit X Leather Split-Sole Ballet Shoes ES0250L: Bloch's leather Elastosplit X-inch has elastic attachments that contour the natural lines of the foot. The symmetrical design provides support and security. 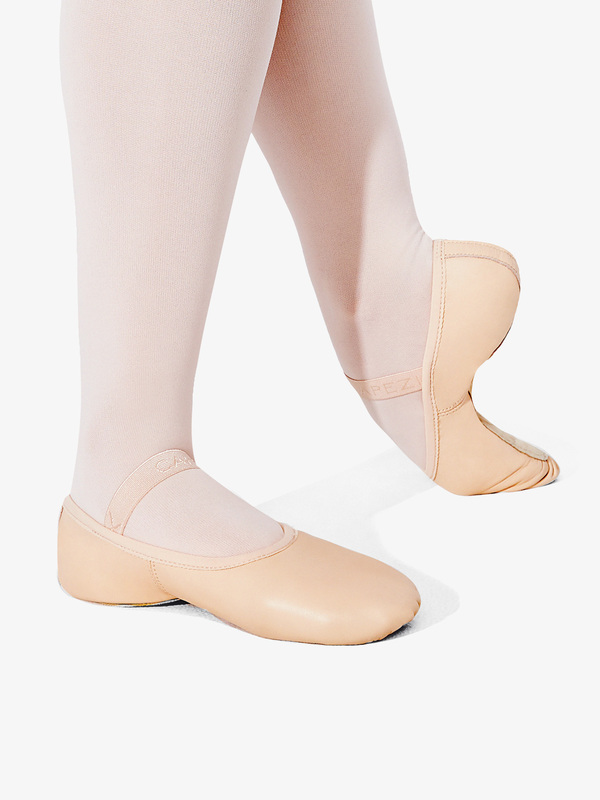 Neoprene inserts allow room for the metatarsals joints when going through demi-pointe. The shoe molds to the sole of the foot, hugging the arch and enhancing the line of the foot. 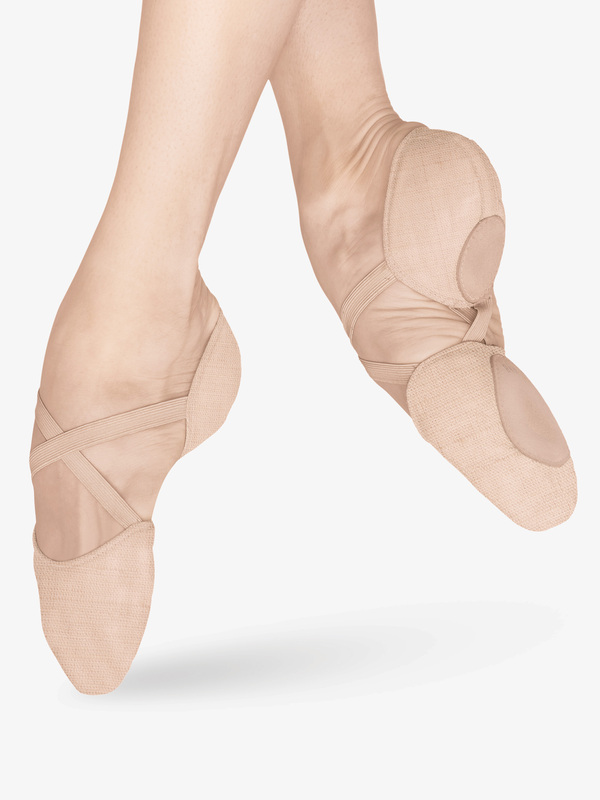 Criss-cross elastics attached at heel. 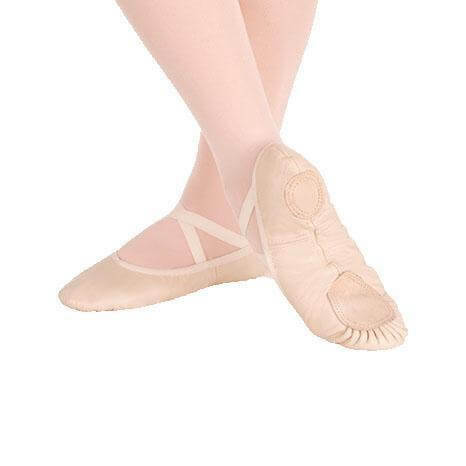 Bloch Adult Elastosplit X Canvas Split-Sole Ballet Shoes ES0251L: Bloch's Elastosplit X-inch features a canvas upper and elastic attachments that contour the natural lines of the foot. The symmetrical design provides support and security. 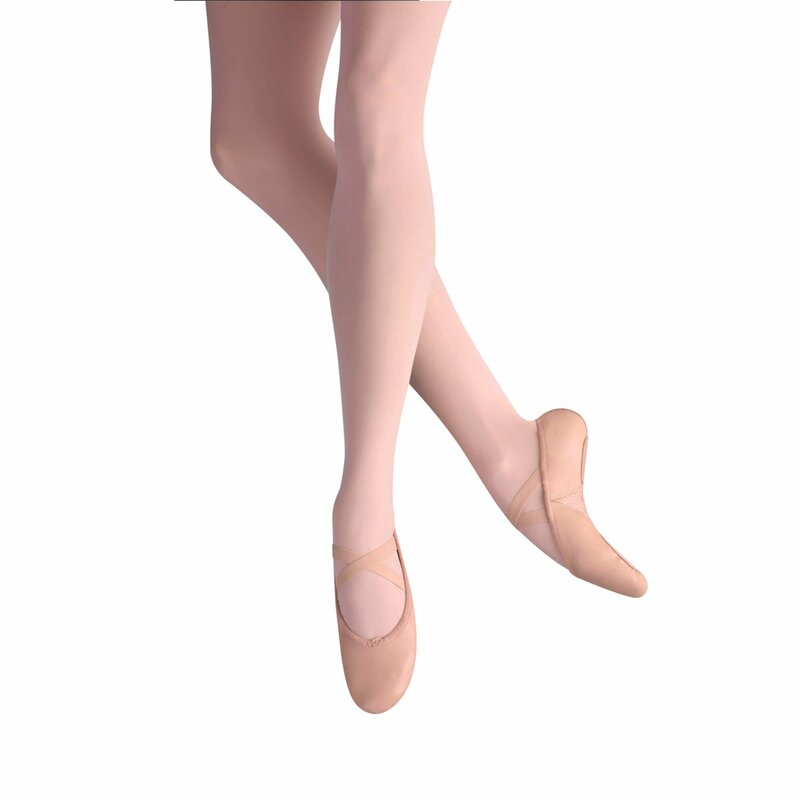 Neoprene inserts allow room for the metatarsal joints when going through demi-pointe. The shoe molds to the sole of the foot, hugging the arch, and enhancing line of the foot. 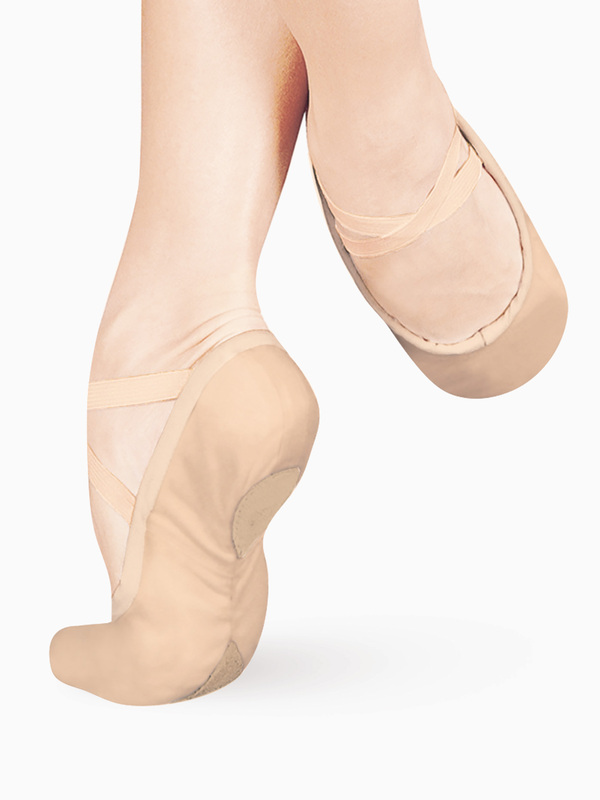 Criss-cross elastics attached at heel. 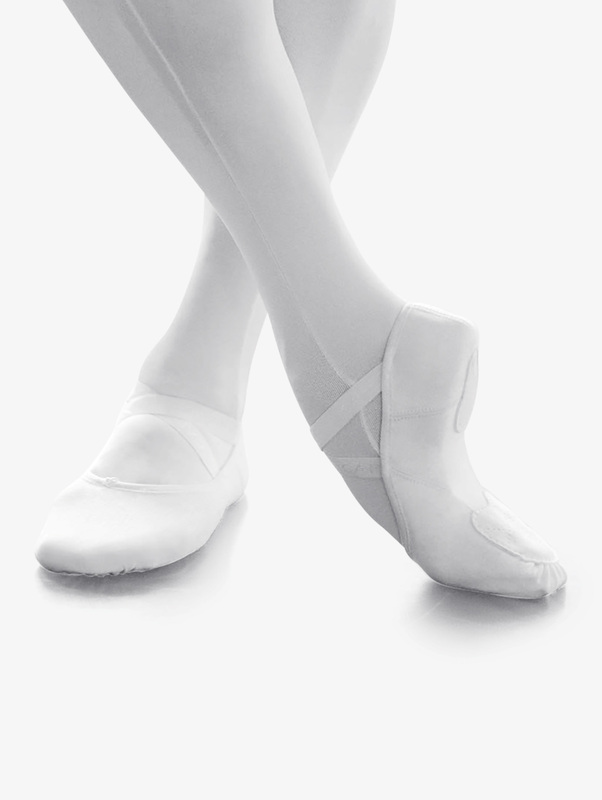 Bloch Adult Proflex Leather Split-Sole Ballet Shoes S0200L: The proflex offers dancers the ultimate in arch hugging technology. 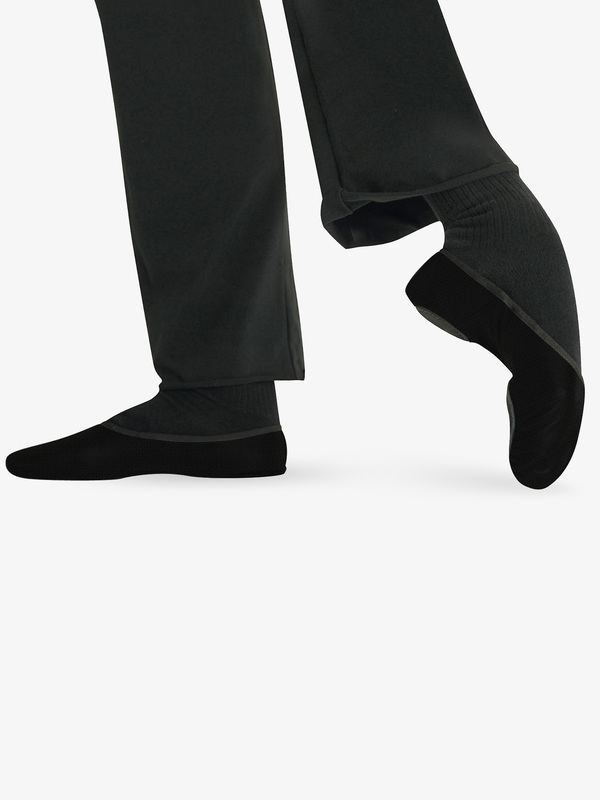 It's unique design gives optimum arch lift whilst staying in contact with the foot at every movement. Superior arch enhancement and support; moving better with the foot. Fused neoprene and stretch mesh eliminate excess material at the arch. Mid power mesh promotes optimum breathability. Lowered profile design creates a feather weight feel. Wide suede metatarsal and heel pads fit to bottom of foot while contouring foot-to-floor contact points. 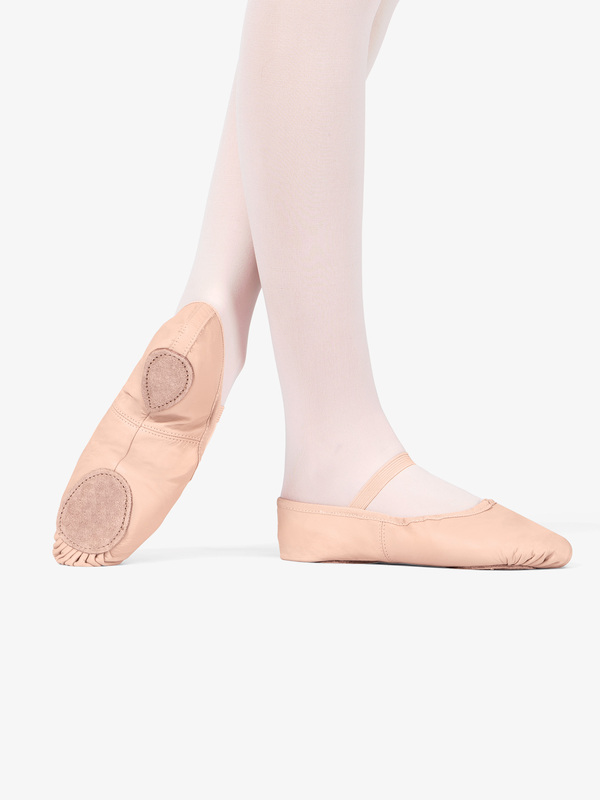 Bloch Child Prolite II Hybrid Leather Split-Sole Ballet Shoes S0203G: The original Bloch split-sole ballet shoe combines a leather upper with a soft and flexible canvas arch insert, which will not stretch out of shape. It features an elastic drawstring, cotton lining and suede leather sock lining. Comes with pre-sewn elastics. 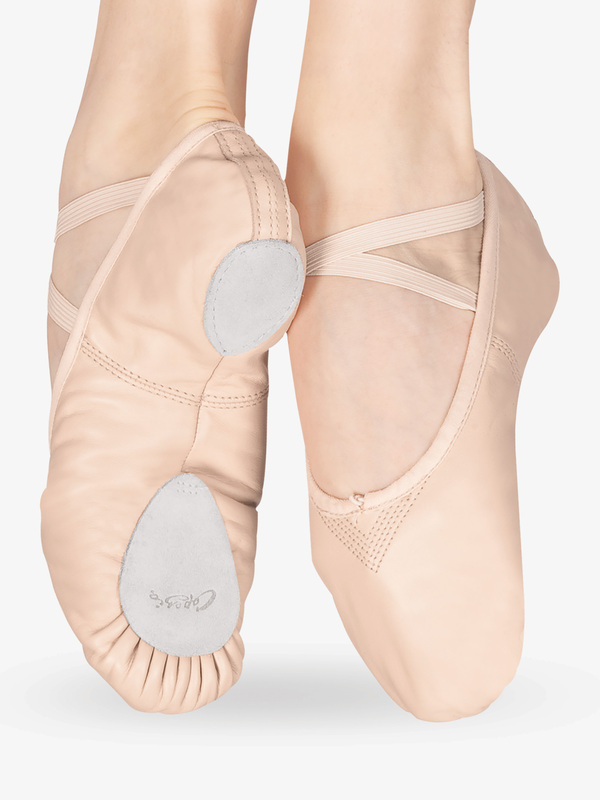 Bloch Adult Prolite II Hybrid Leather Split-Sole Ballet Shoes S0203L: The original Bloch split-sole ballet shoe combines a leather upper with a soft and flexible canvas arch insert, which will not stretch out of shape. It features an elastic drawstring, cotton lining and suede leather sock lining. Comes with pre-sewn elastics. 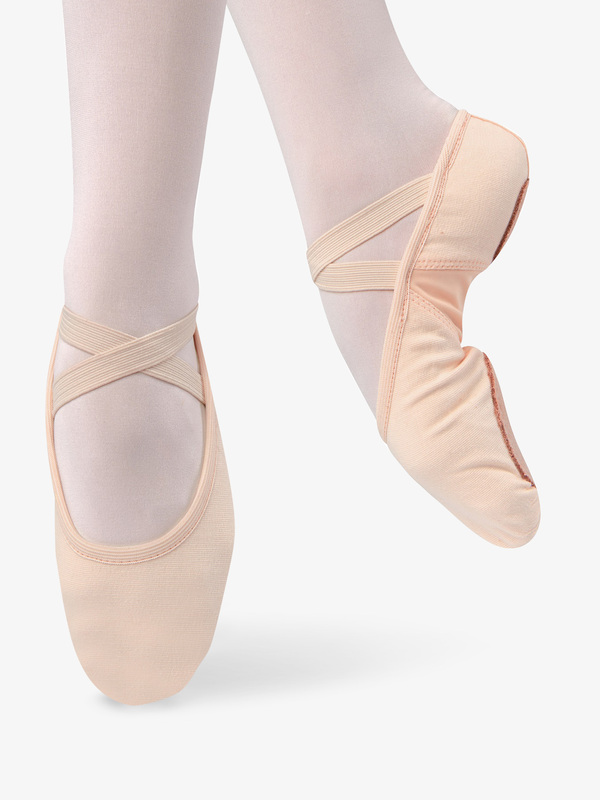 Capezio Adult Juliet Leather Split-Sole Ballet Shoes 2027: Capezio's leather Juliet-inch split-sole ballet shoe features a sculpted arch construction with no center seam, contoured suede sole patches, moisture-absorbent, antimicrobial brushed cotton sock lining, and drawstring. 3/8-inch pre-sewn elastics. 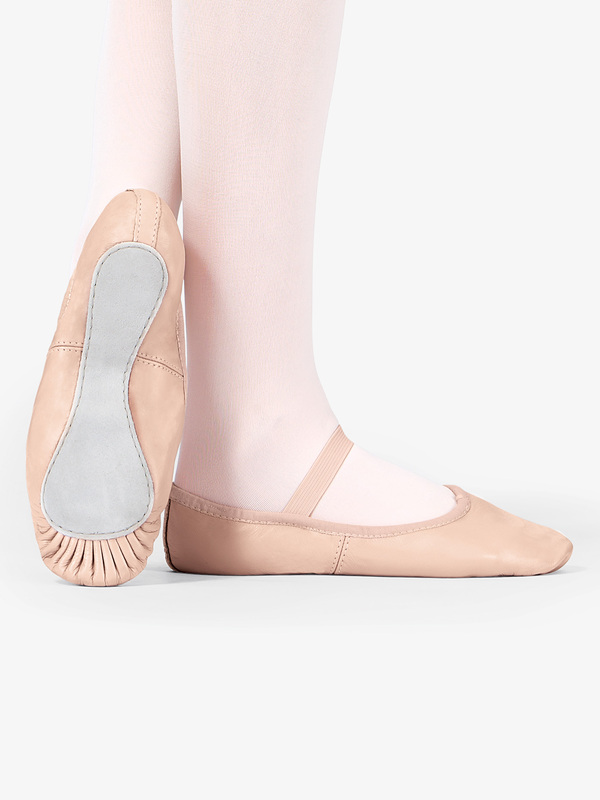 Capezio Girls Juliet Leather Split Sole Ballet Shoes 2027C: Capezio's Juliet-inch leather split sole ballet slipper has a sheep skin leather upper and a moisture-absorbent brushed cotton lining. 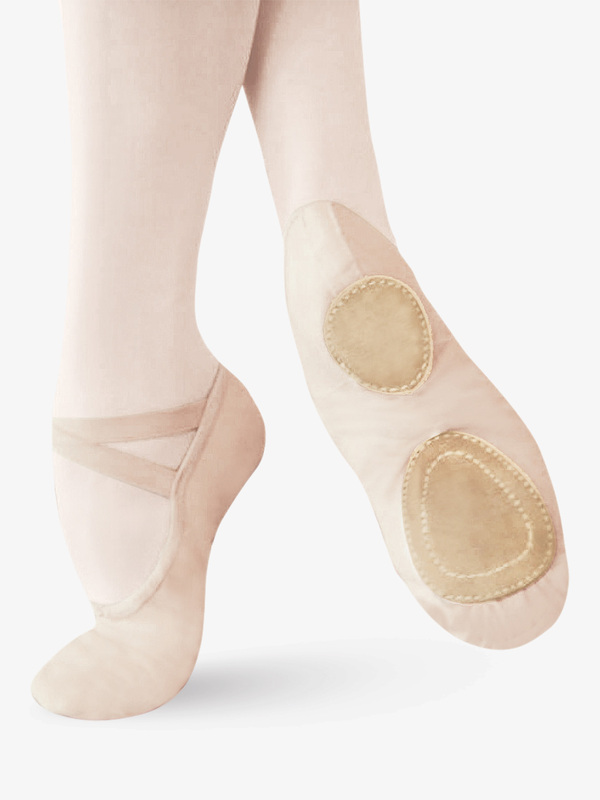 Other features include contoured suede sole patches, a tacked elastic drawstring, and a seamless, sculpted arch. Comes with pre-sewn crisscross elastics. 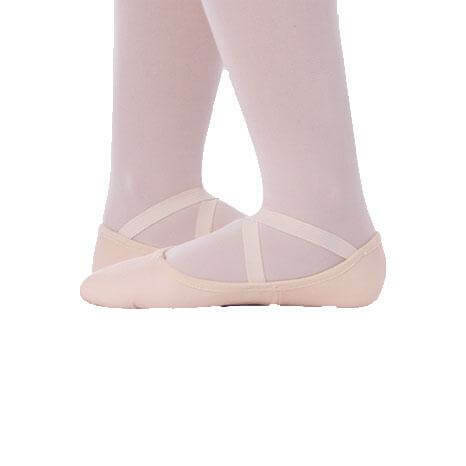 Capezio Adult Juliet Canvas Split-Sole Ballet Shoes 2028: Capezio's canvas Juliet-inch split-sole ballet shoe with drawstring, features a sculpted arch construction with no center seam, contoured suede sole patches, and a moisture-absorbent, antimicrobal brushed cotton sock lining.Pre-sewn criss-cross elastics. 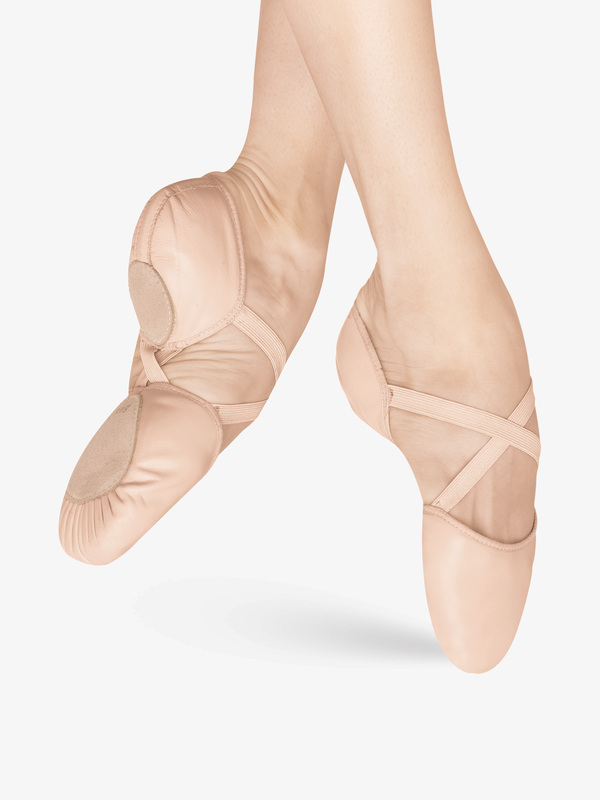 Capezio Adult Cobra Leather Split-Sole Ballet Shoes 2033: Capezio's Cobra-inch leather split-sole ballet shoe has a soft poly/cotton lining for comfort. The suede forefoot is sculpted and engineered to enhance performance. Other features include hidden forepart stitching, flat pleats, and padded suede heel patch for comfort. Pre-attached elastic at the heel. 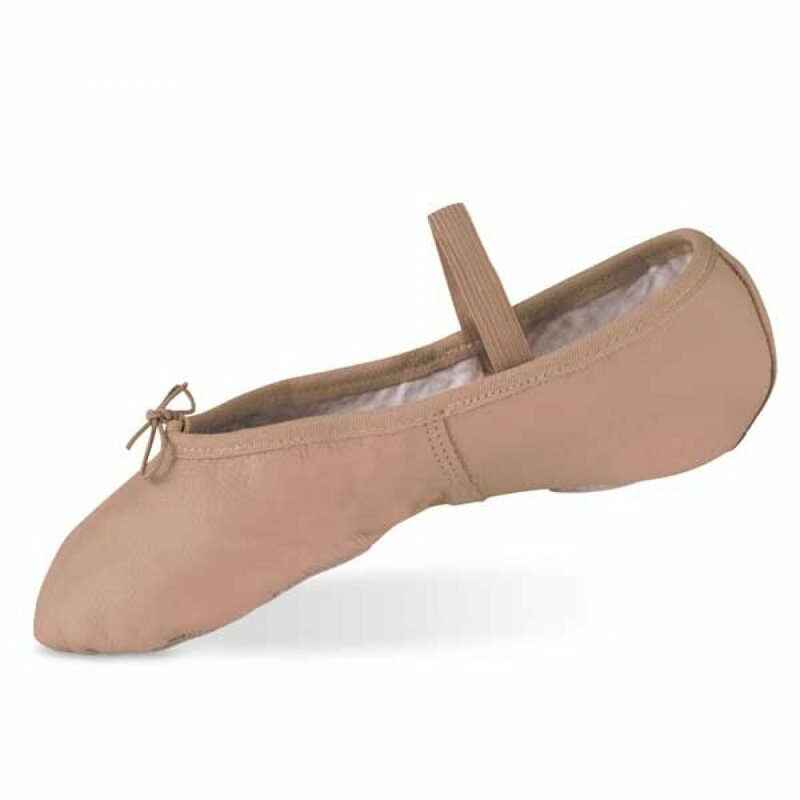 Capezio Child Cobra Leather Split-Sole Ballet Shoes 2033C: Capezio's Cobra-inch leather split-sole ballet shes has a soft poly/cotton lining for comfort. The suede forefoot is sculpted and engineered to enhance performance. Other features include hidden forepart stitching, flat pleats, and padded suede heel patch for comfort. Pre-attached elastic at the heel. 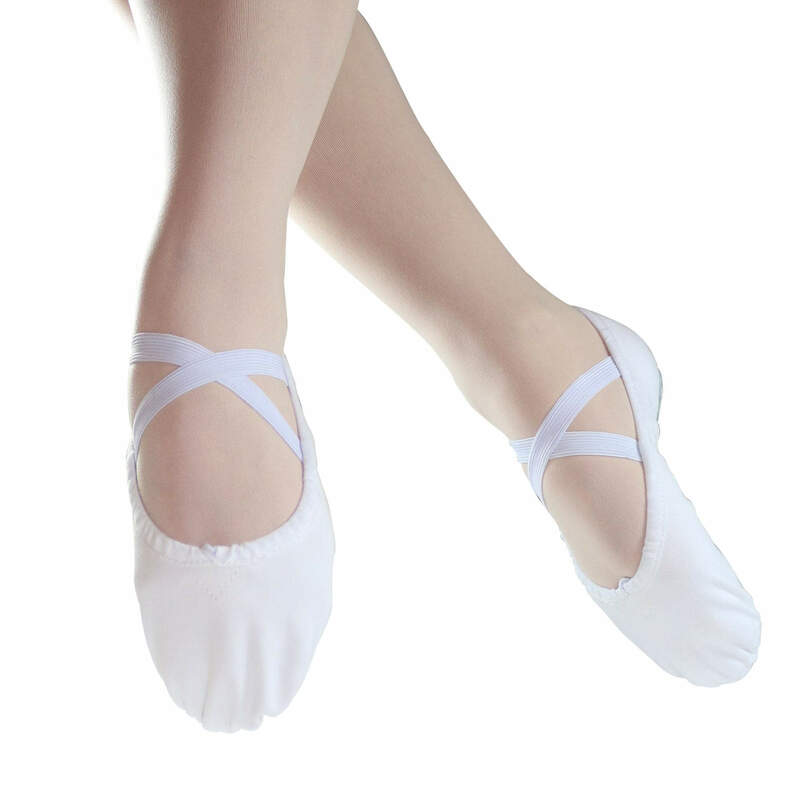 Danshuz Girls Canvas Split Sole Ballet Shoes D496: Stretch canvas ballet slipper features a nylon/spandex arch insert, elastic binding, pre-attached elastic straps, and split sole construction. 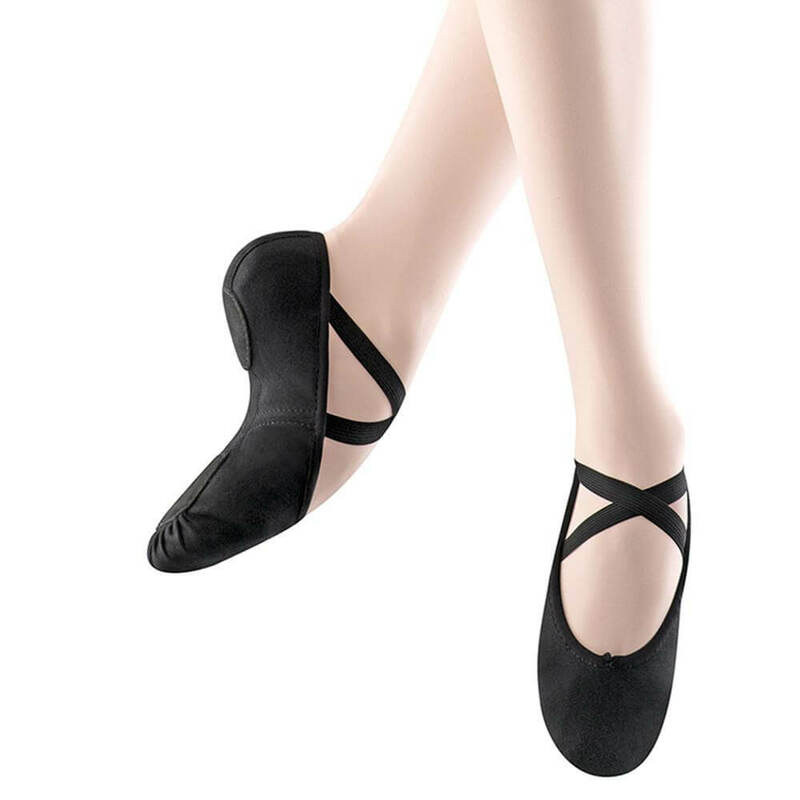 Danshuz Womens Canvas Split Sole Ballet Shoes D497: Stretch canvas ballet slipper features a nylon/spandex arch insert, elastic binding, pre-attached elastic straps, and split sole construction. 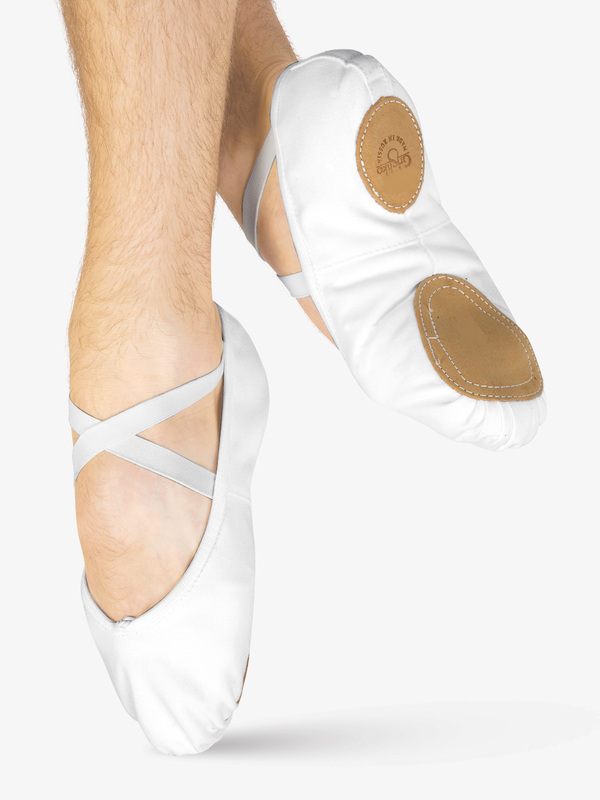 Grishko Mens Ultimate Canvas Split-Sole Ballet Slippers MCP: Grishko's Ultimate split-sole canvas slipper features a strikingly flat suede sole at the forefoot for ultimate balance, and a light cushion in the heel sole for shock absorption. These slippers mold beautifully to the foot, in soft and durable canvas with just the right amount of stretch. 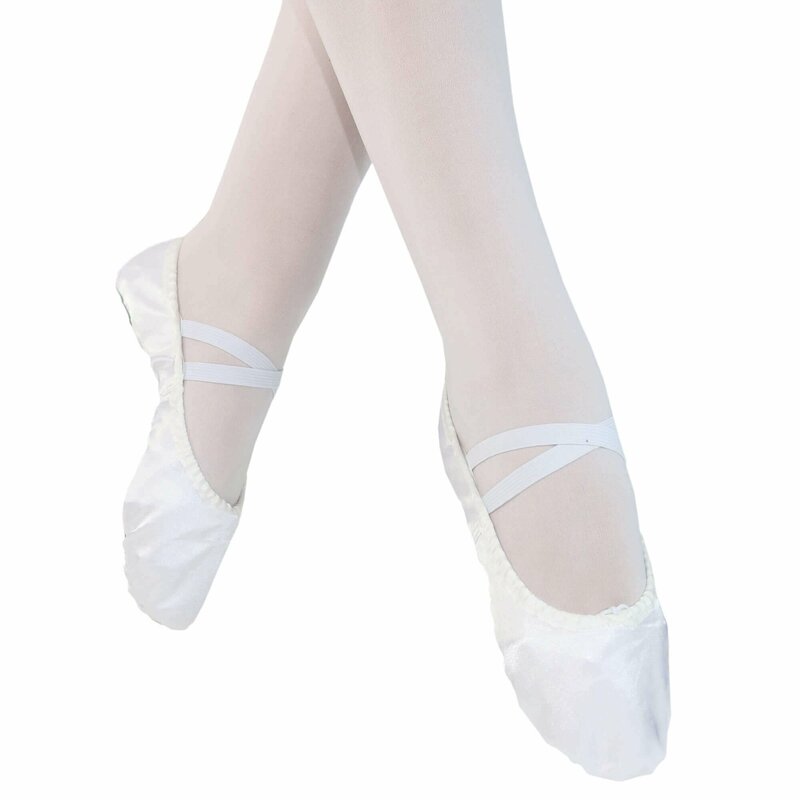 Medium-height V-shaped vamp; elastic drawstring; elastics pre-sewn at sides of heel. 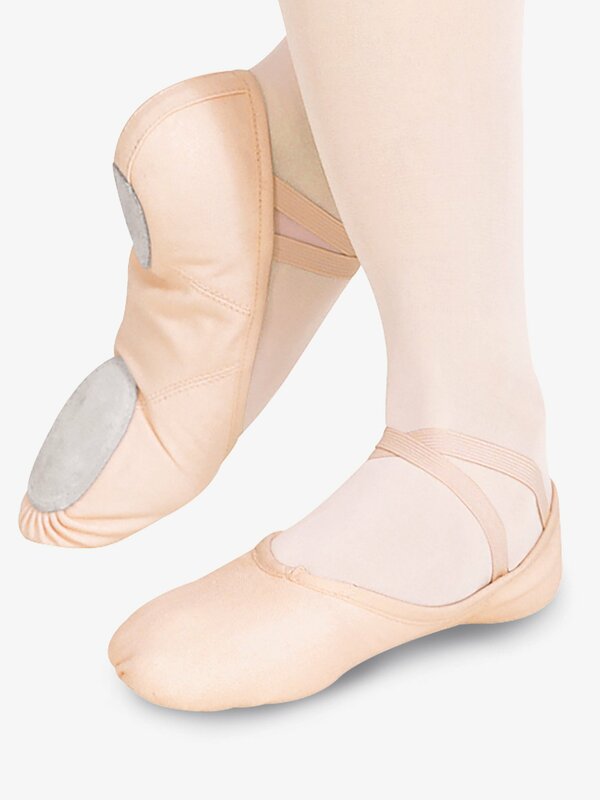 Grishko Adult Performance Series Split-Sole Canvas Ballet Shoes SCP6: Grishko's Performance split-sole canvas shoe features an innovative piece of elastic sewn into a special unlined central panel, for an outstanding degree of conformity to the arch. The Performance slipper has a strikingly flat suede sole at the forefoot for ultimate balance, and a light cushion in the heel sole for shock absorption. These slippers mold beautifully to the foot, in soft and durable canvas with just the right amount of stretch. 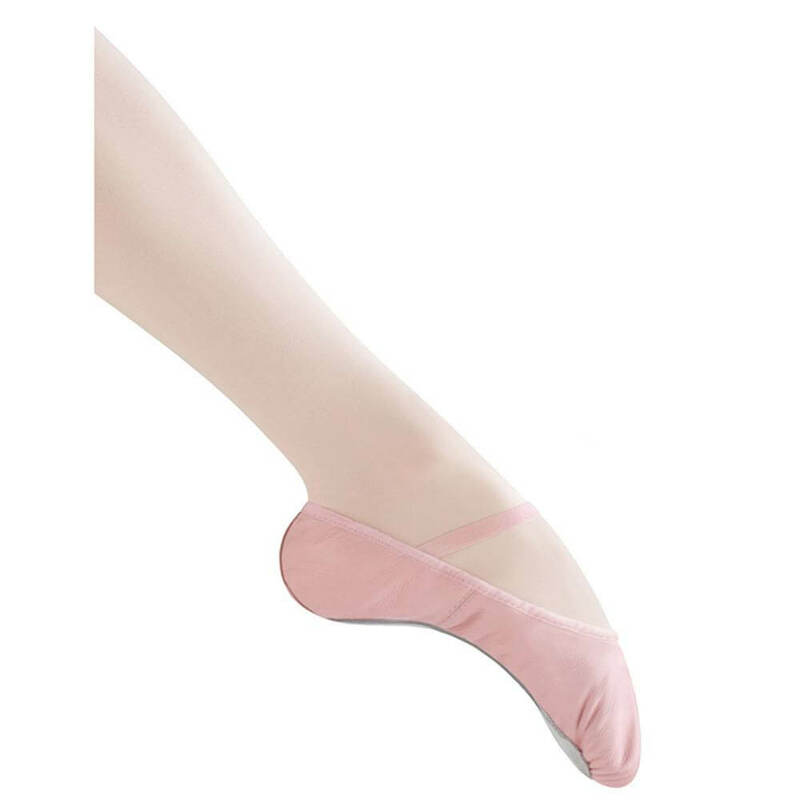 Medium-height U-shaped vamp; elastic drawstring; elastics pre-sewn at sides of heel. 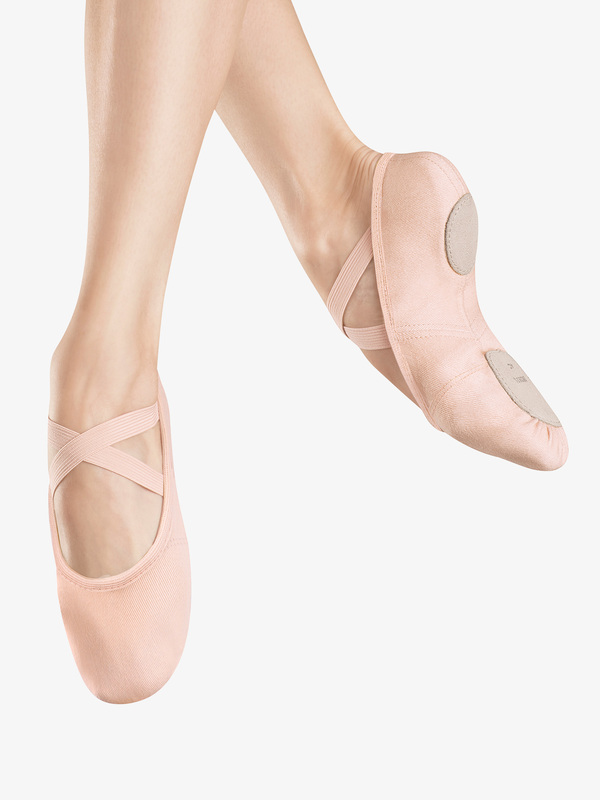 Grishko Womens Ultimate Canvas Split-Sole Ballet Shoes WCP: Grishko's Ultimate split-sole canvas shoe features a strikingly flat suede sole at the forefoot for ultimate balance, and a light cushion in the heel sole for shock absorption. These slippers mold beautifully to the foot, in soft and durable canvas with just the right amount of stretch. 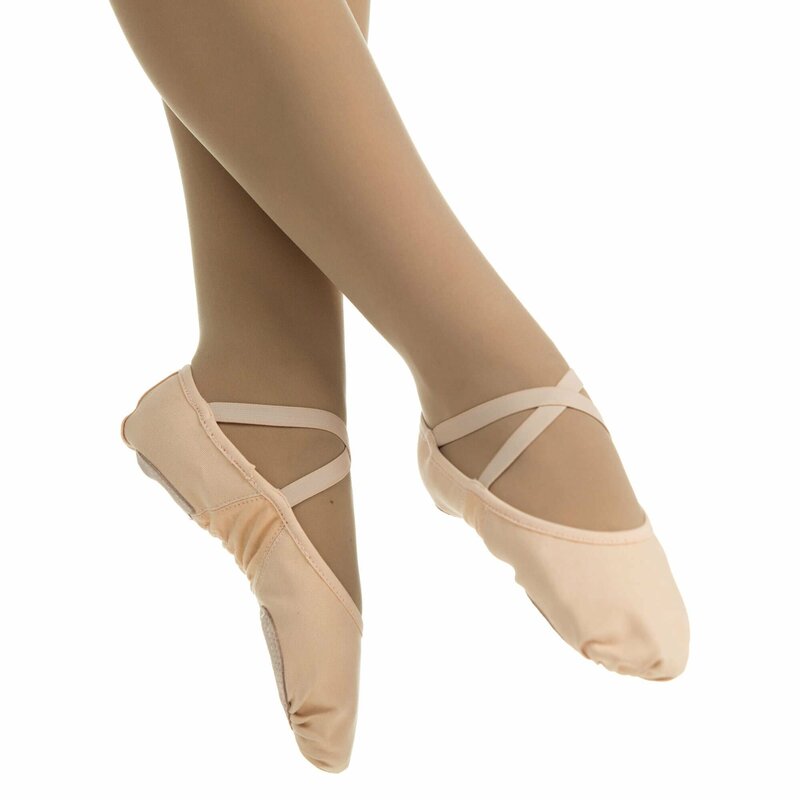 Medium-height V-shaped vamp; elastic drawstring; elastics pre-sewn at sides of heel. 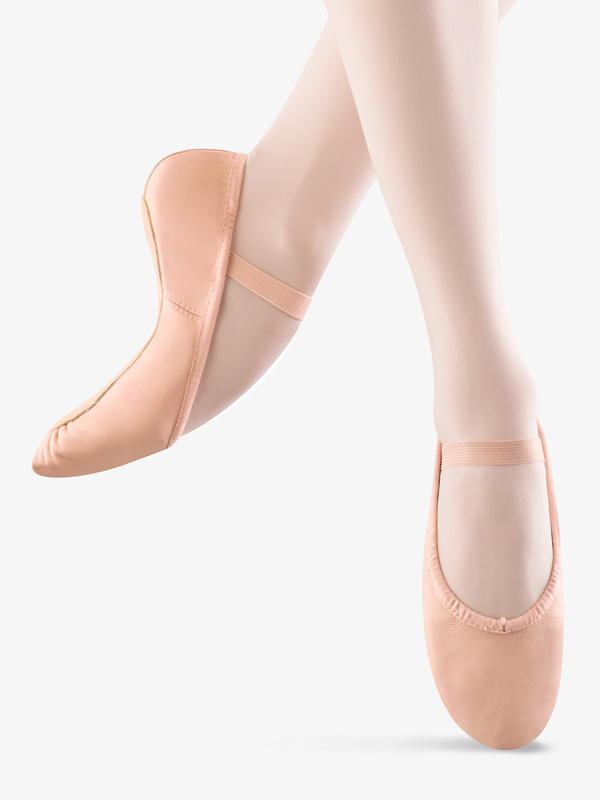 Leo's Adult Company Ballet Shoes LS2305L: A new, simple, streamlined canvas split-sole ballet shoe from Leo's Dancewear. 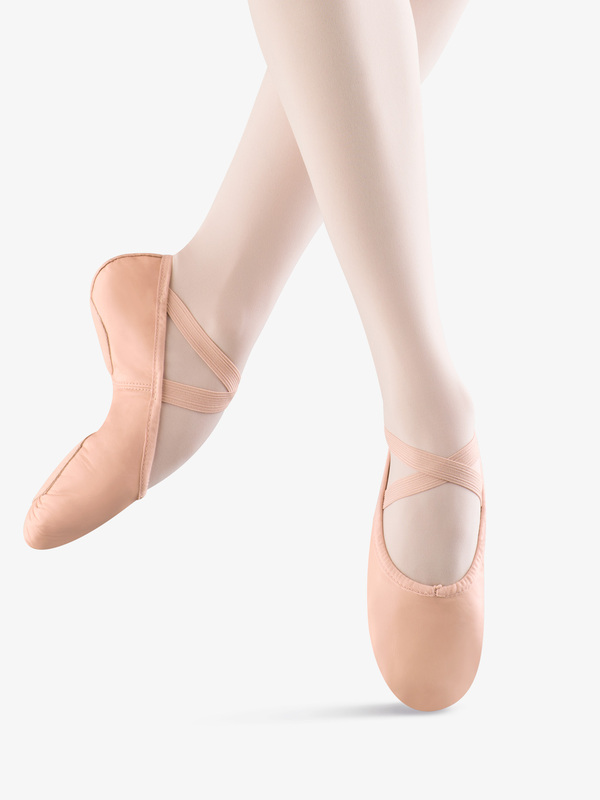 The Company-inch has flat even toe pleating which creates a comfortable foundation for turns and stability. Stitched down suede outsoles under the metatarsal and heel gives strength and solidity to the bottom of the foot on releve' and standing flat. Double stitching throughout creates a smooth surface to allow the foot to feel and connect to the floor. 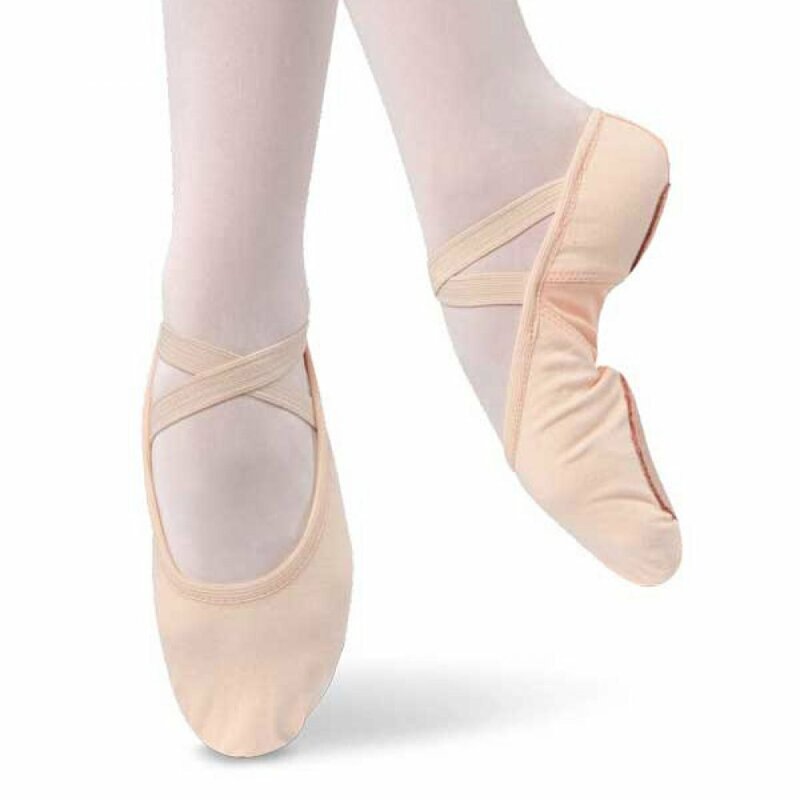 Pre-sewn, criss-cross elastic permits confidence and grace to the dancer while the cotton binding and elastic drawstring acknowledges an independence to each dancer's style of fit. 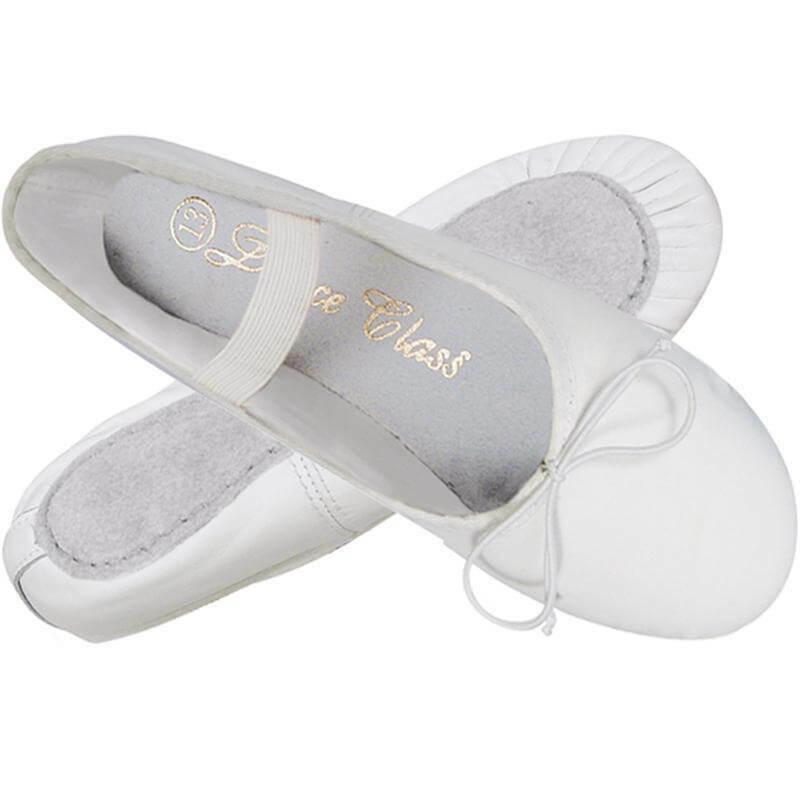 Sansha Child Star Split Canvas Split-Sole Ballet Shoes 15C: Sansha's Star Split-inch canvas ballet shoe provides flexibility with a split-sole design. Other features include a drawstring and suede sole patches. Pre-sewn single elastic attached. 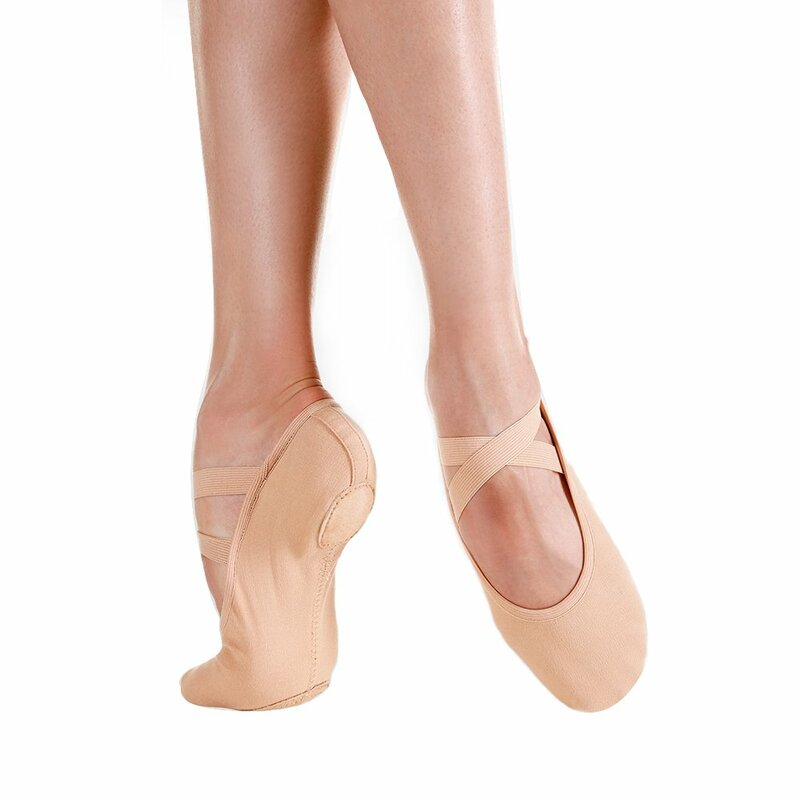 Sansha Adult Silhouette Canvas Split-Sole Ballet Shoes 3AC: Split sole Silhouette canvas ballet shoe features a canvas upper, suede split sole, double strength sole stitching, triangle construction for an enhanced arch, foam protection pad at the heel, and attached elastics. 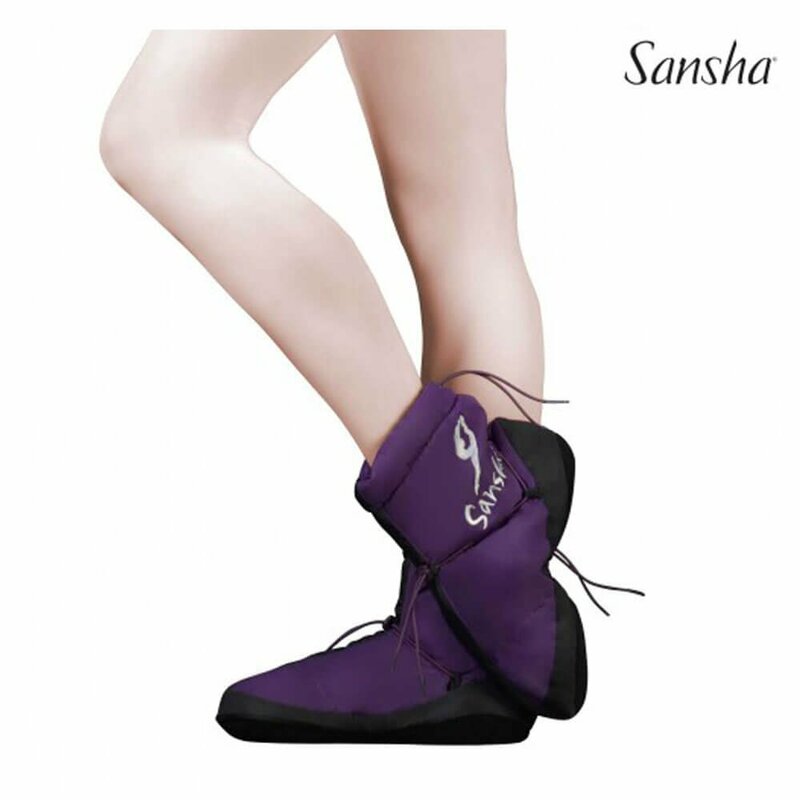 Sansha Adult Silhouette Leather Split-Sole Ballet Shoes 3AL: Split-sole Silhouette leather ballet shoe features a leather upper, suede split sole, double strength sole stitching, triangle construction for an enhanced arch, foam protection pad at the heel, and attached elastics. 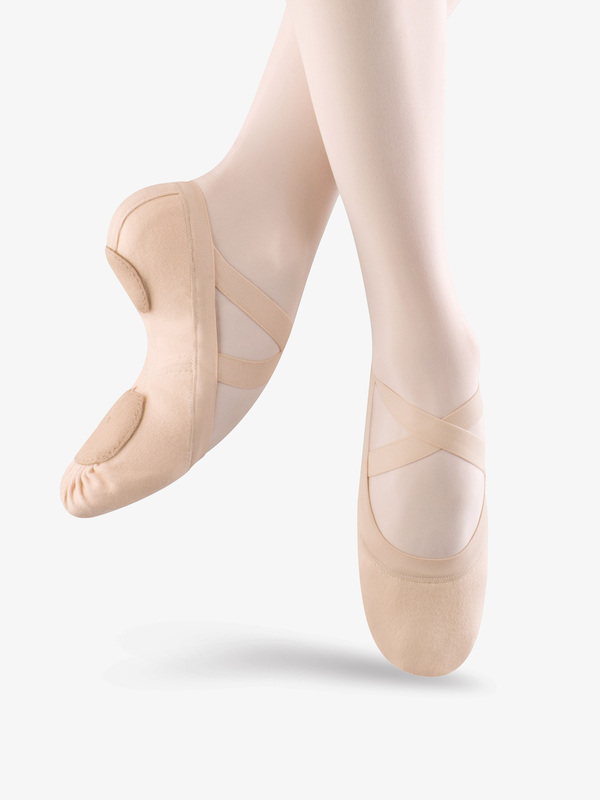 Bloch Child Dansoft Leather Full Sole Ballet Shoes S0205G: Bloch's Dansoft-inch is an ideal student ballet shoe with the elastic already attached and a full suede sole. It has a strong but flexible leather upper and a cotton lining. Attached single elastic. 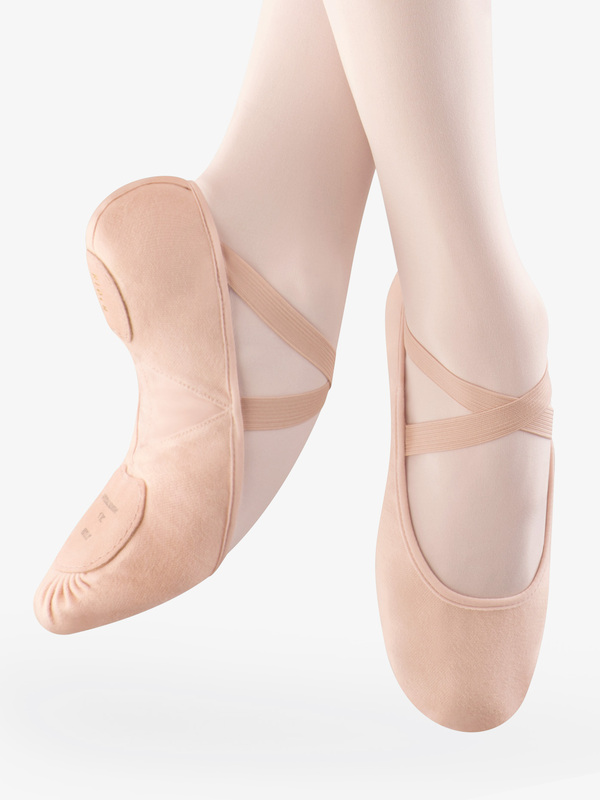 Bloch Adult Dansoft Leather Full Sole Ballet Shoes S0205L: Bloch's Dansoft-inch is an ideal student ballet shoe with the elastic already attached and a full suede sole. It has a strong but flexible leather upper and a cotton lining. Attached single elastic. 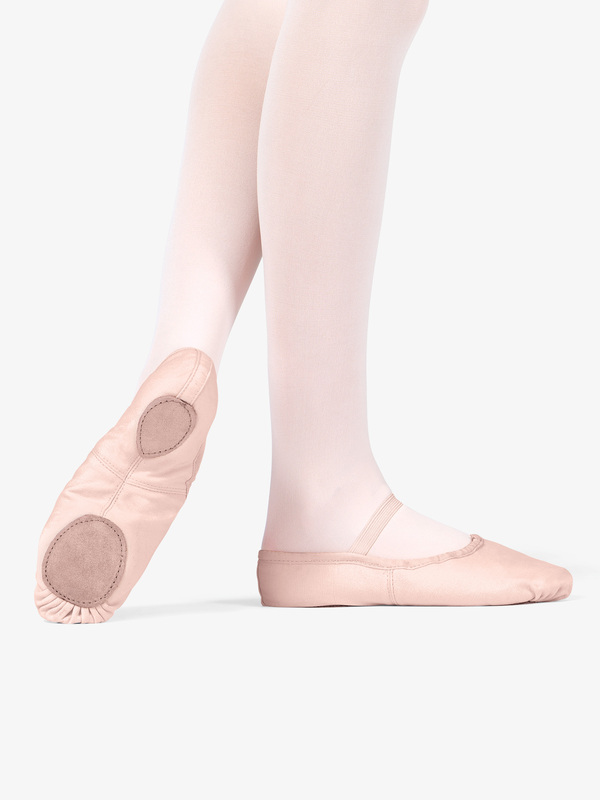 Bloch Toddler Dansoft Leather Full Sole Ballet Shoes S0205T: Bloch's Dansoft-inch is an ideal student ballet shoe with the elastic already attached and a full suede sole. It has a strong but flexible leather upper and a cotton lining. 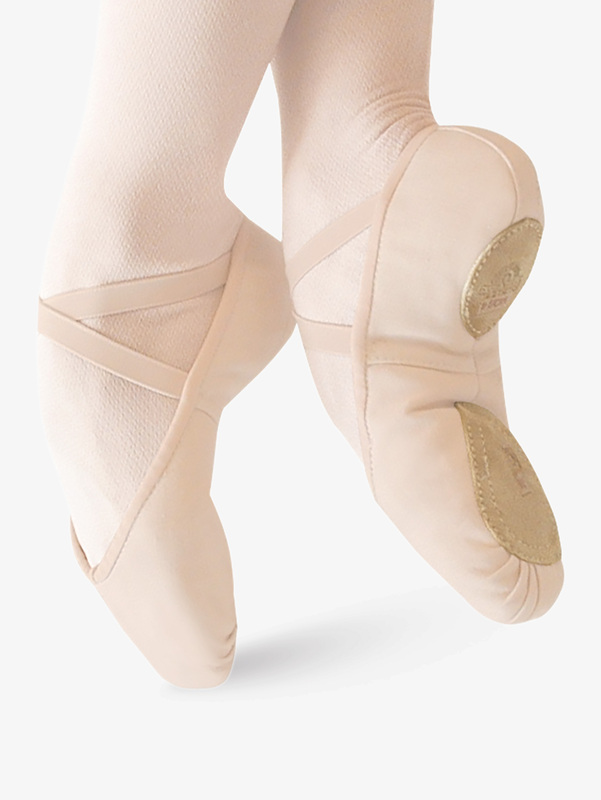 Bloch Adult Prolite II Leather Split-Sole Ballet Shoes S0208L: This Bloch Prolite II-inch is a luxurious all leather upper ballet shoe with a split-sole that hugs the arch to perfection. There are no ridges under the metatarsal. Comes with pre-sewn elastics. 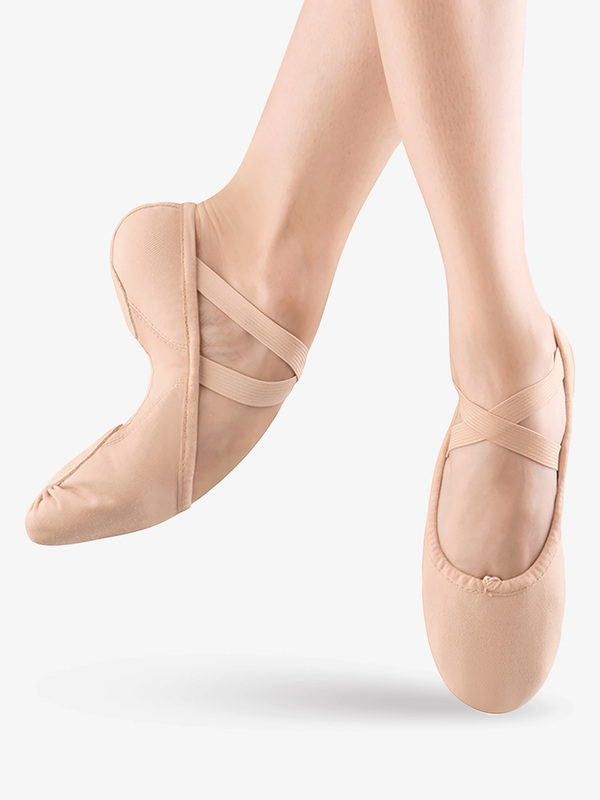 Bloch Adult Proflex Canvas Split-Sole Ballet Shoes S0210L: The proflex offers dancers the ultimate in arch hugging technology. 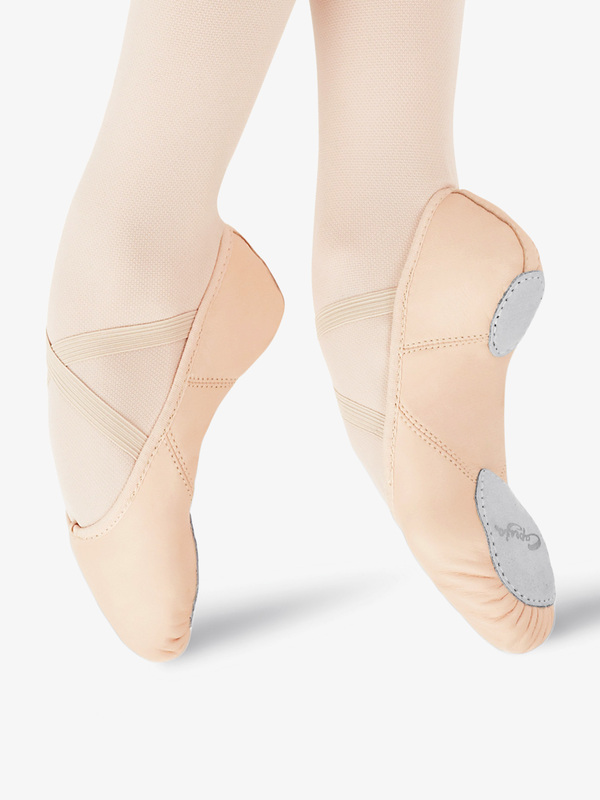 It's unique design gives optimum arch lift whilst staying in contact with the foot at every movement. 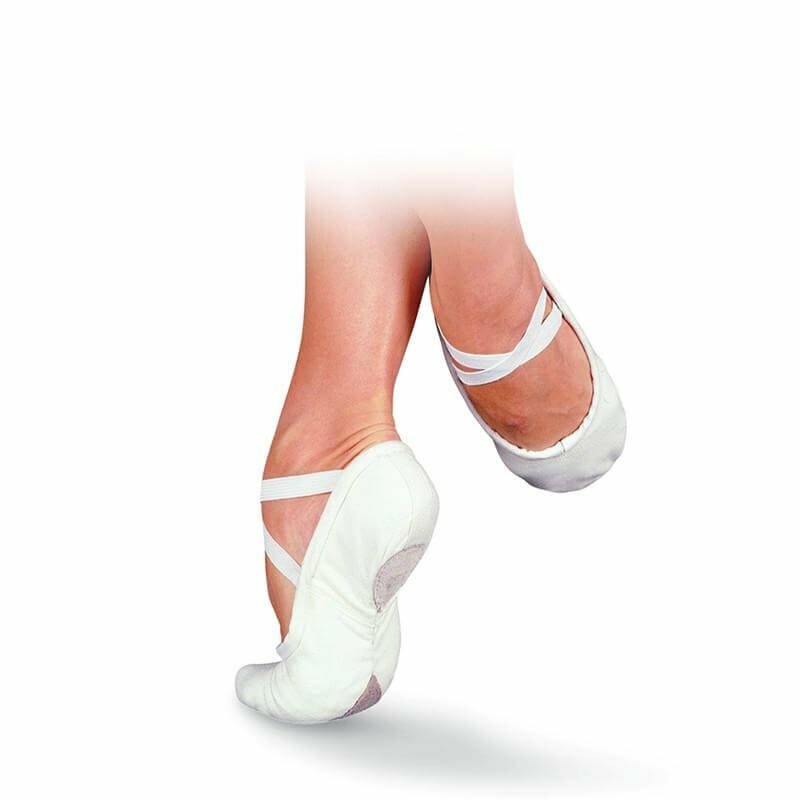 Superior arch enhancement and support, moving better with the foot. Fused neoprene and stretch mesh eliminate excess material at the arch. Mid power mesh promotes optimum breathability. Lowered profile design creates a feather weight feel. Wide suede metatarsal and heel pads fit to bottom of foot while contouring foot-to-floor contact points. Bloch Womens Infinity Stretch Stretch Canvas Ballet Shoes S0220L: Combining your favorite Bloch features from the popular Synchrony-inch and Zenith-inch shoes, the Infinity Stretch-inch is a stretch canvas ballet slipper with a streamlined design that accentuates the foot while being incredibly comfortable. 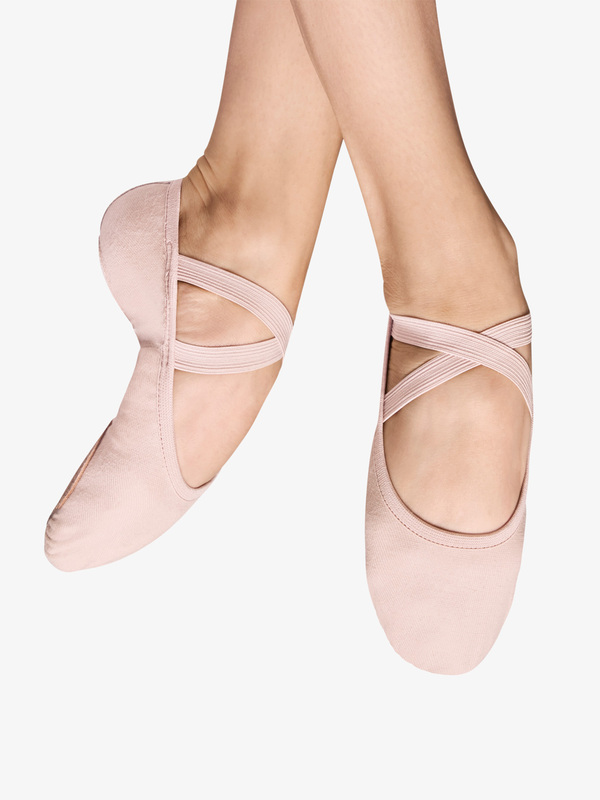 Ballet shoes feature innovative fibers that quickly recover during movement, a soft, plush elastic on the top line, attached elastic straps, and a wider outsole that supports natural spreading of the toes. 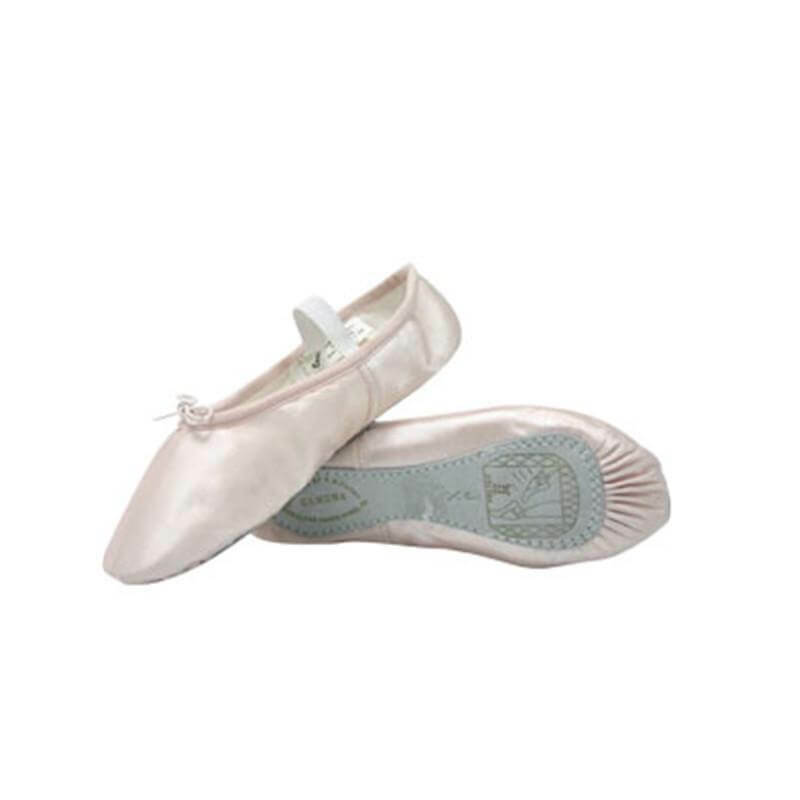 Bloch Child Bunny Hop Leather Full Sole Ballet Shoes S0225G: Unbeatable price for a shoe that offers Bloch quality. 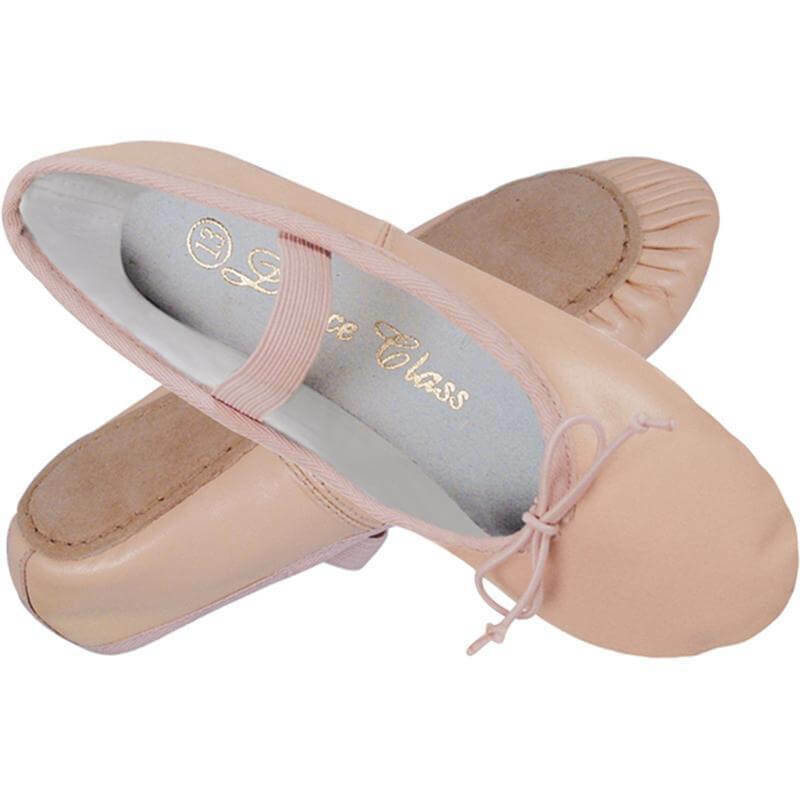 For the beginner, this student ballet shoe features full leather outsole and insole designed to add resistance to the working foot for strengthening. 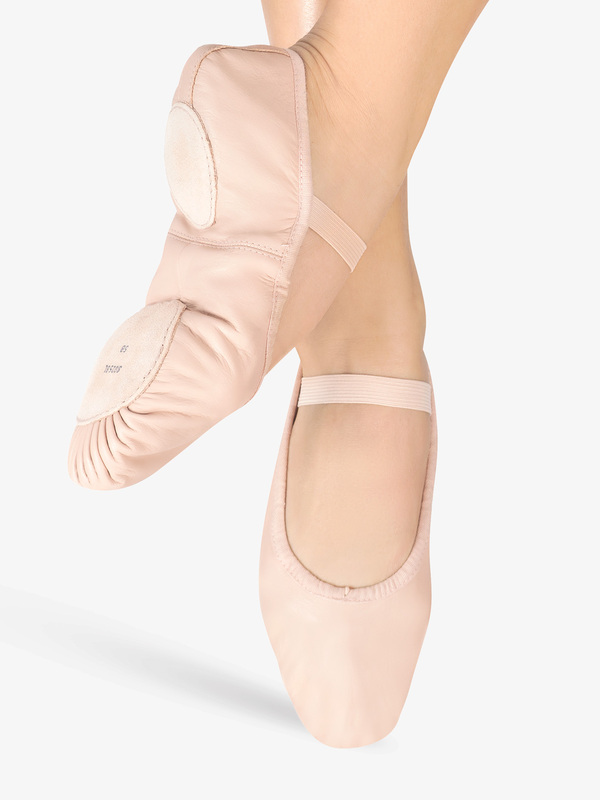 The light pink leather is complemented with a soft swan down lining for complete comfort. The lining is printed in shades of pink and purple with the Bloch Bunny Hop design and features the BunnyHop logo and space for her name. 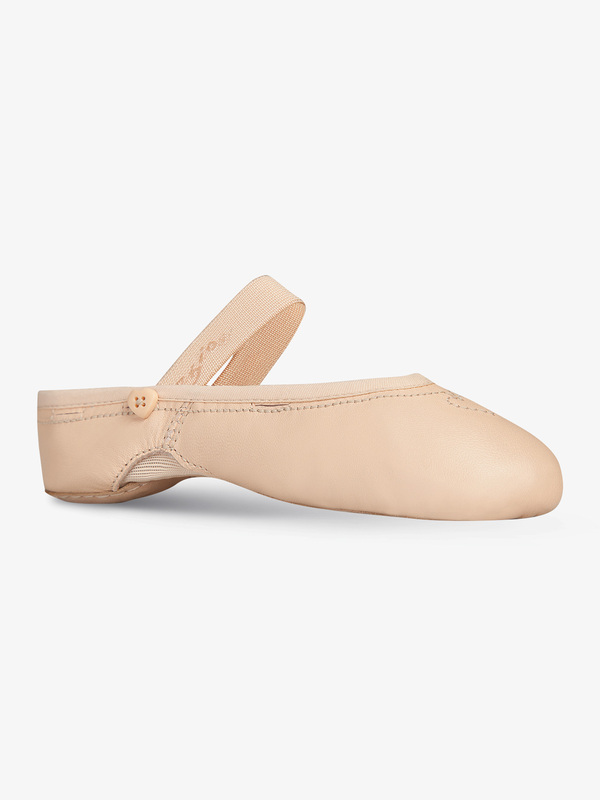 Capezio Adult Daisy Leather Full Sole Ballet Shoes 205: Capezio's Daisy-inch is a perfect choice for the beginner. 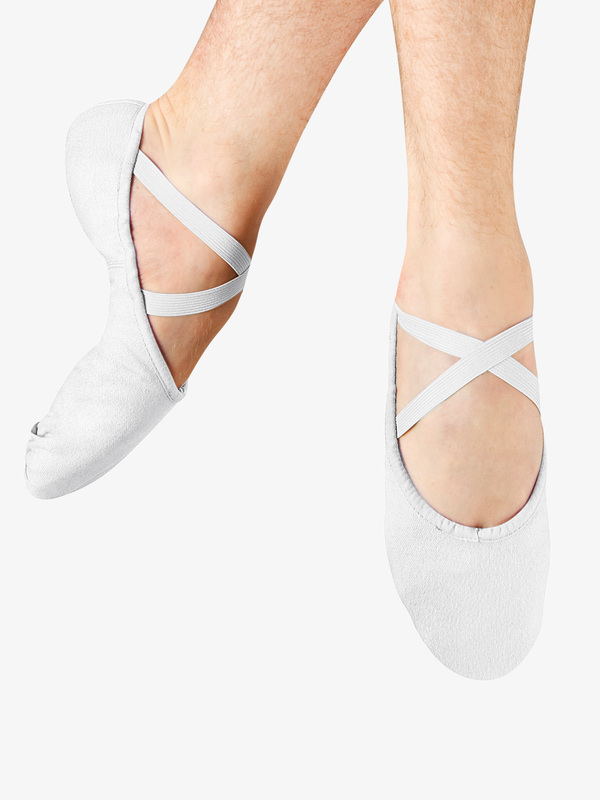 This full sole all-leather upper ballet shoe features an all over dainty cotton daisy print lining, anchored drawstring, along with an inside student ID tag. The Daisy offers functions and superior fit at an excellent price. Pre-sewn single elastic included. Black shoe features a no-print lining. 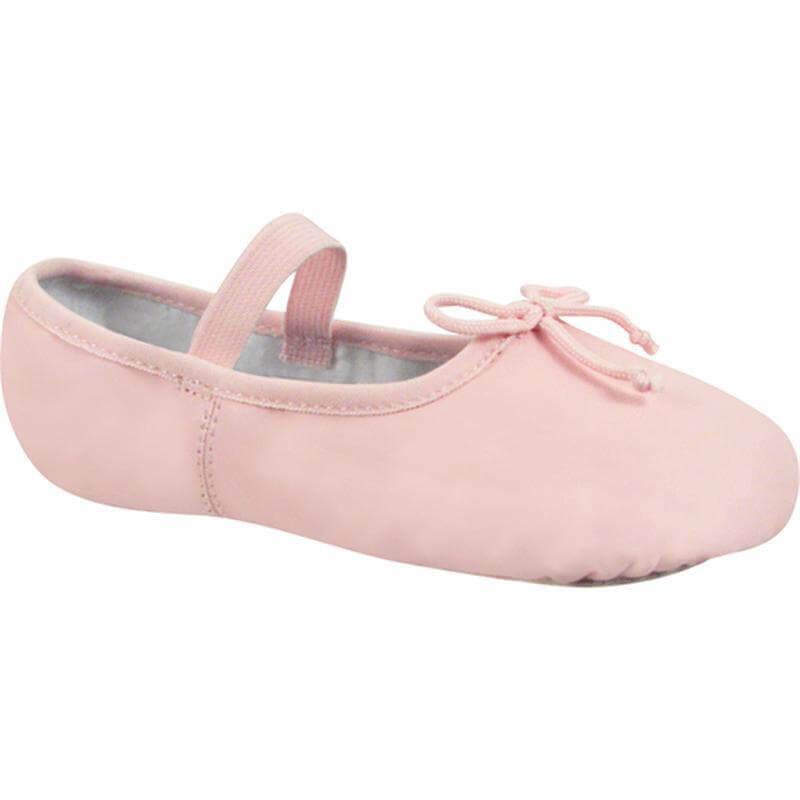 Capezio Child Daisy Leather Full Sole Ballet Shoes 205C: Capezio's Daisy-inch is a perfect choice for the beginner. 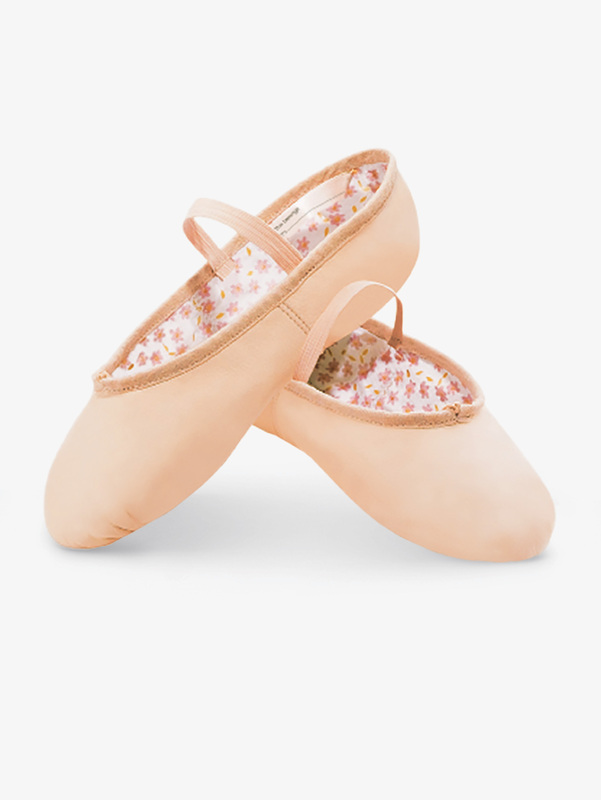 This full sole all-leather upper ballet shoe features an all over dainty cotton daisy print lining, anchored drawstring, along with an inside student ID tag. 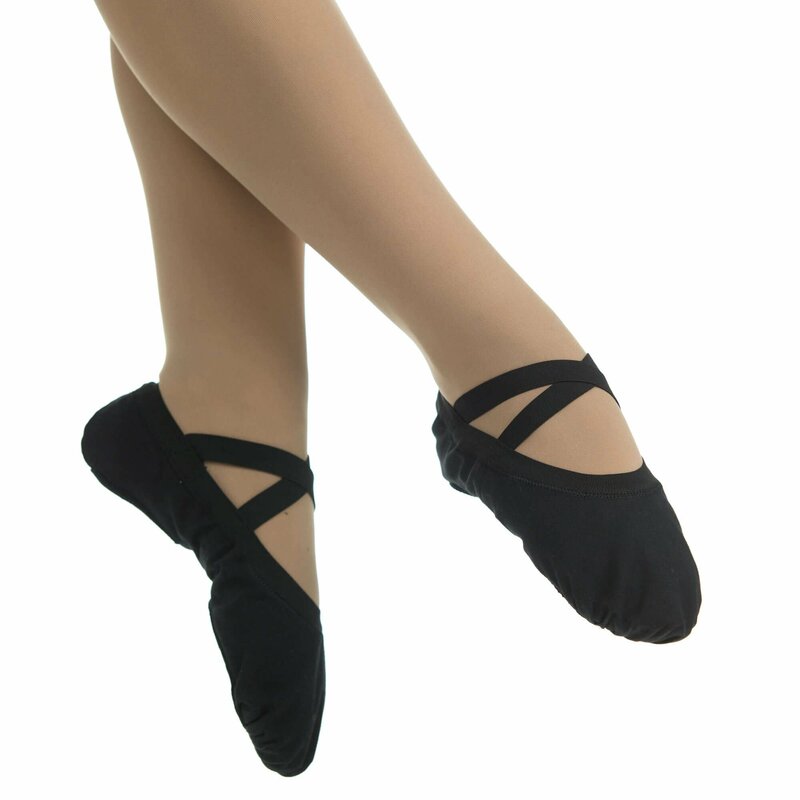 The Daisy offers functions and superior fit at an excellent price.Pre-sewn single elastic included.Black shoe features a no-print lining. 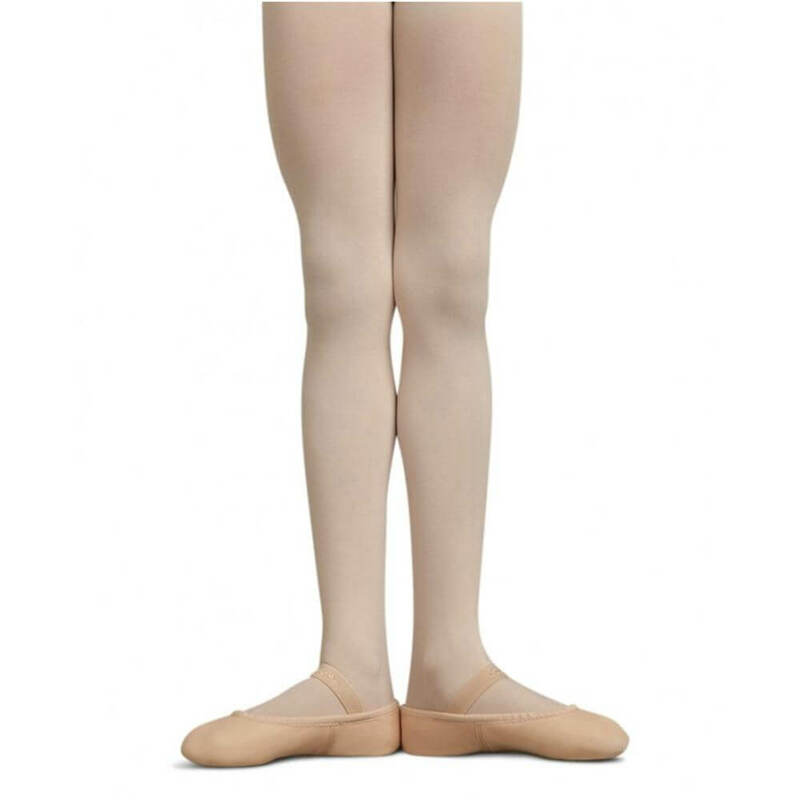 Capezio Girls Lily Full Sole Leather Ballet Shoes 212C: Meet your new go-to ballet slipper. 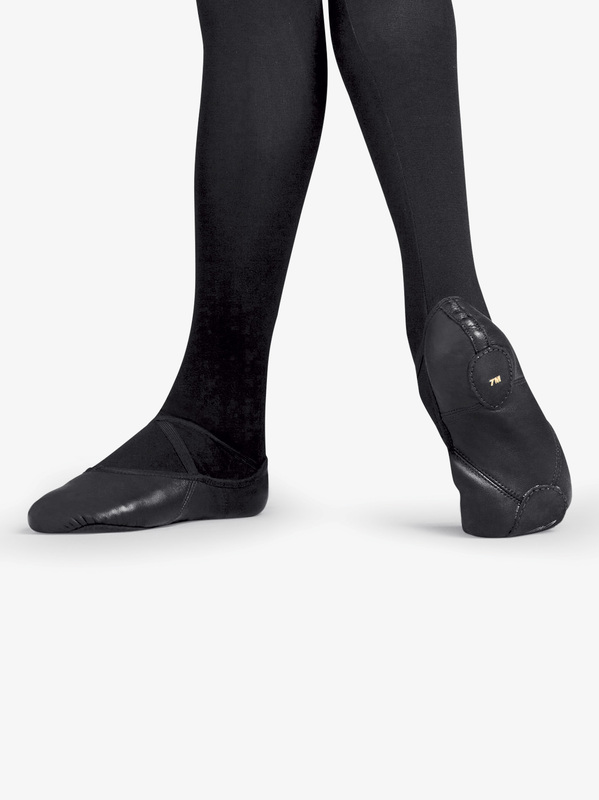 Capezio's Lily-inch ballet slipper features soft leather, a full sole, and a suede footbed. Straps are pre-attached, saving you the hassle of having to sew them on yourself! 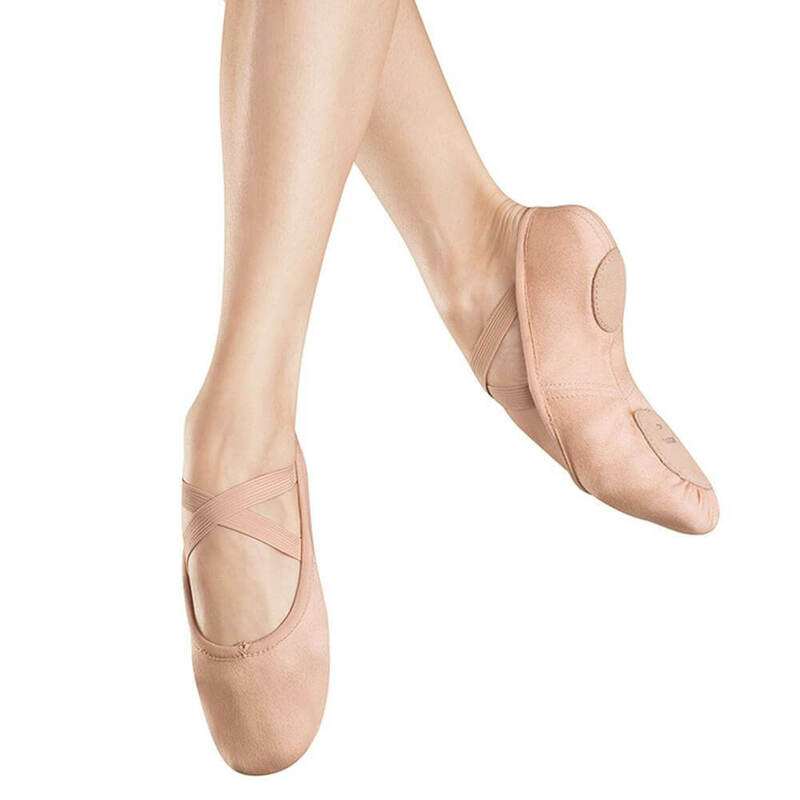 Capezio Womens Lily Full Sole Leather Ballet Shoes 212W: Meet your new go-to ballet slipper. 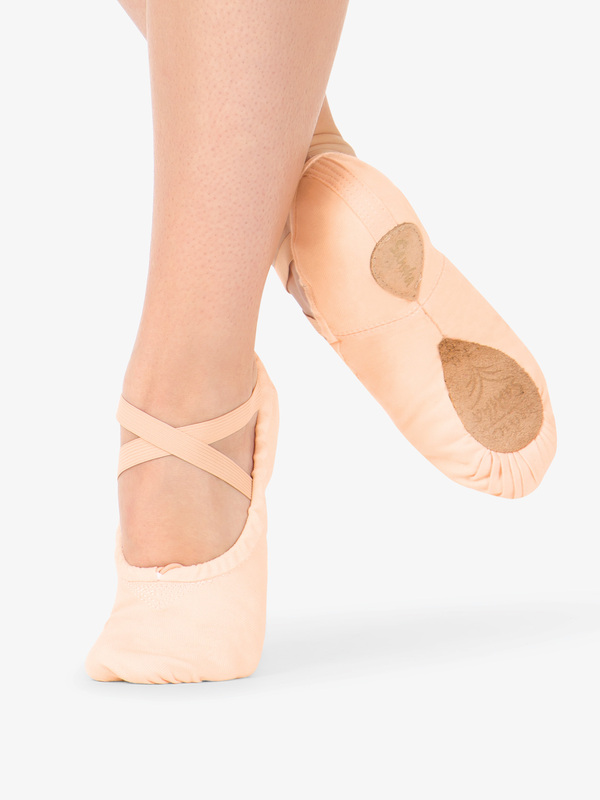 Capezio's Lily-inch ballet slipper features soft leather, a full sole, and a suede footbed. Straps are pre-attached, saving you the hassle of having to sew them on yourself! 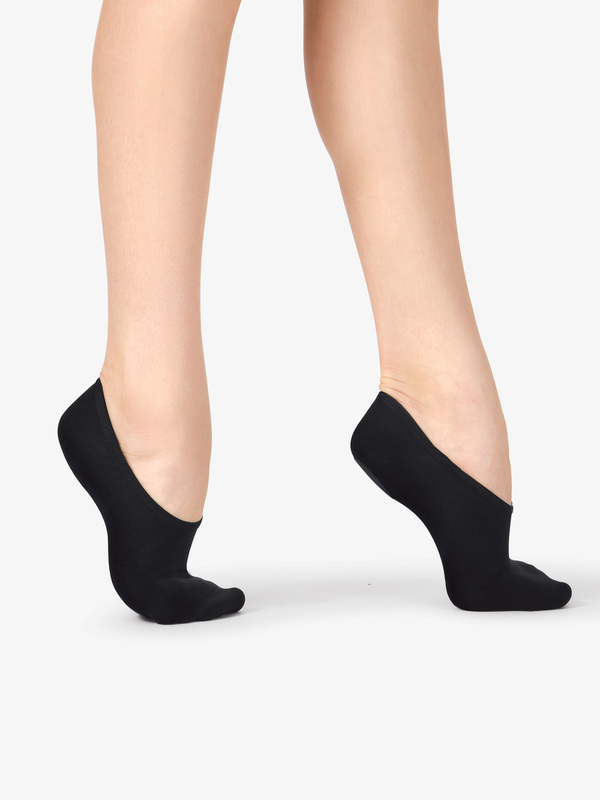 Capezio Adult Arch Support H21U: Help reduce over-stretching en pointe and support your arch when dancing barefoot with Capezio's silicone arch band. 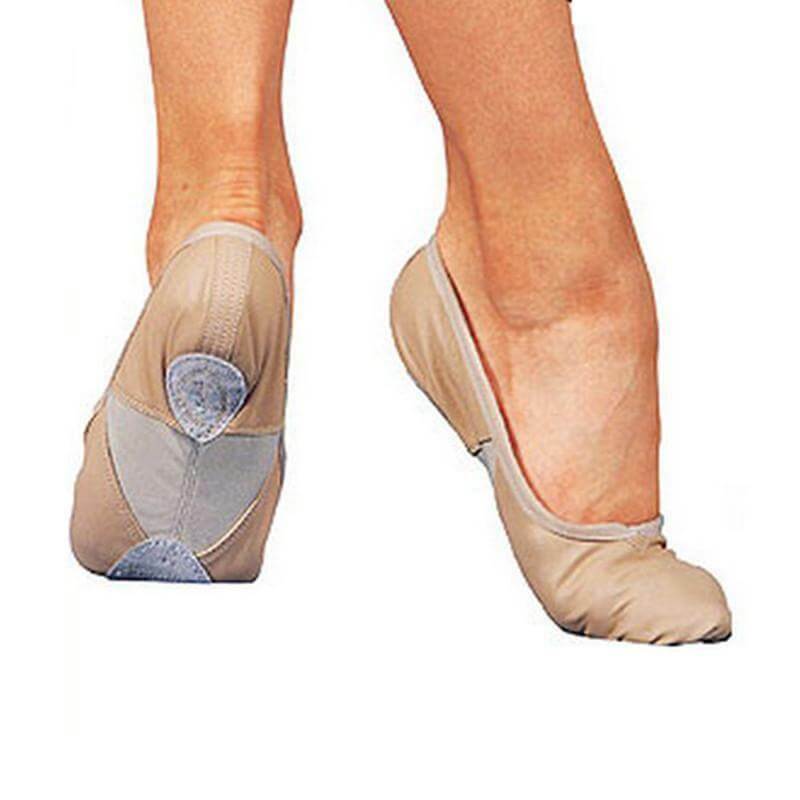 Additionally helps with securing footwear and can be worn on bare feet or with ballet shoes, pointe shoes, or any split sole dance footwear. 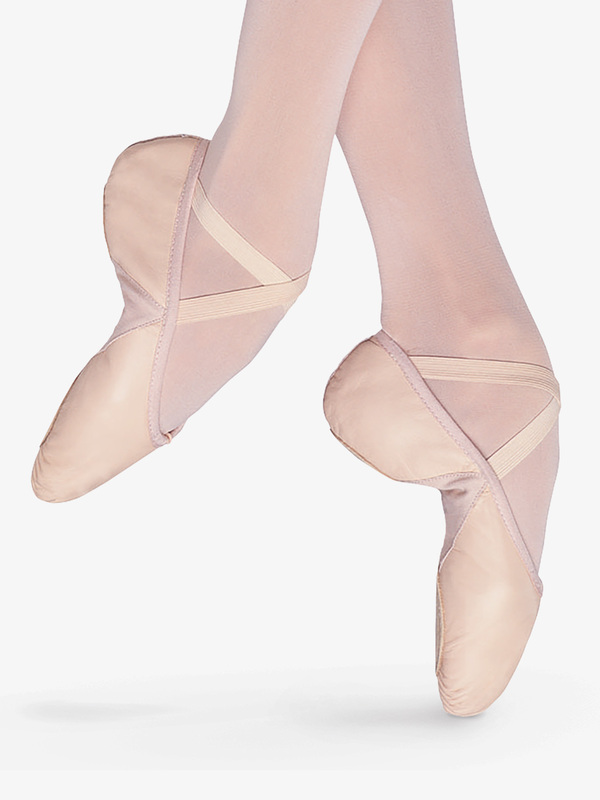 Capezio recommends wearing for 30 minutes per session and slowly increase wear time to a maximum of 2 hours. Muscle soreness may occur with beginning use but will resolve as the arch is broken in. 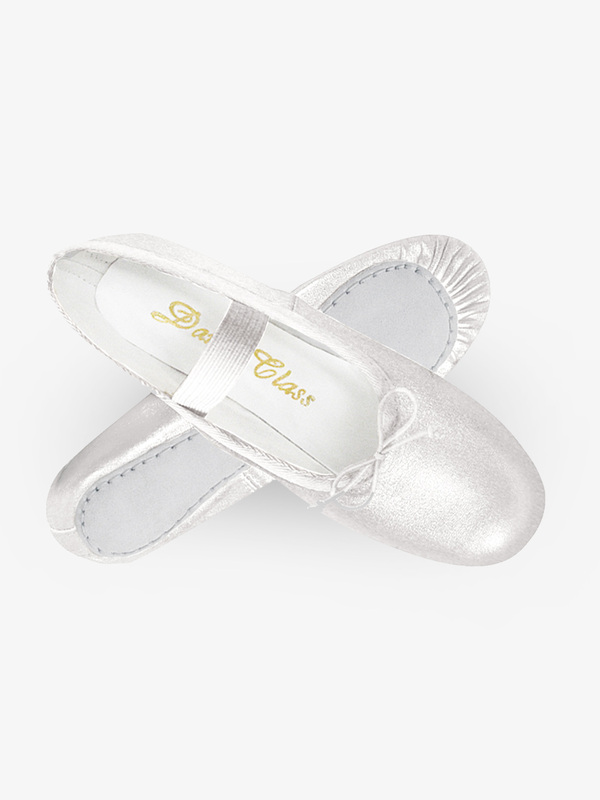 Dance Class Child Gold/Silver Leather Full Sole Ballet Shoes B901: Beautiful gold and silver pleated full sole ballet shoes in ultra soft leather! Designed and constructed for beauty as well as maximum performance and durability. Great for performance and special occasion wear. 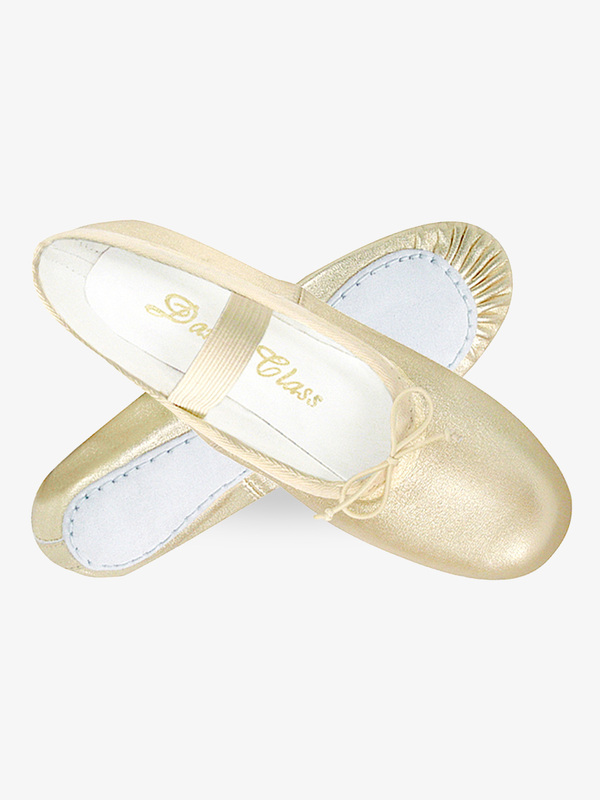 Dance Class Adult Gold/Silver Leather Full Sole Ballet Shoes DCB902: Beautiful gold and silver pleated full sole ballet shoes in ultra soft leather! Designed and constructed for beauty as well as maximum performance and durability. Great for performance and special occasion wear. 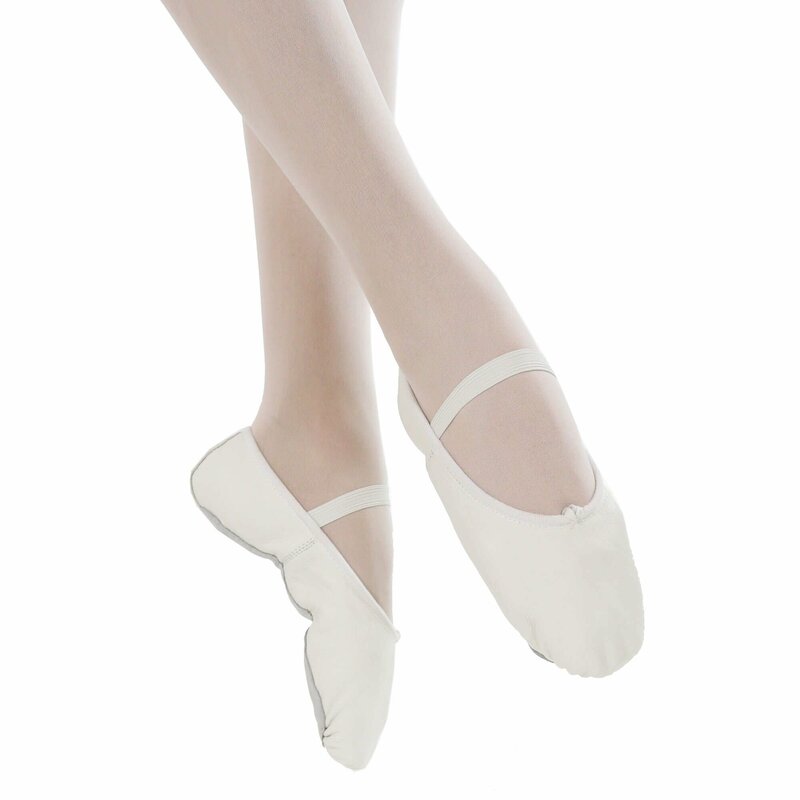 Sansha Adult #1 Pro Canvas Split-Sole Ballet Shoes S1C: Sansha's Pro-inch original canvas split-sole ballet shoe. The sole is fully hand stitched and thread does not appear on the outside of the shoe, so it will not wear out. This also means the sole is flush with the upper, so there is nothing to catch on the floor. Perfect for men and women! Un-sewn crisscross elastics included. 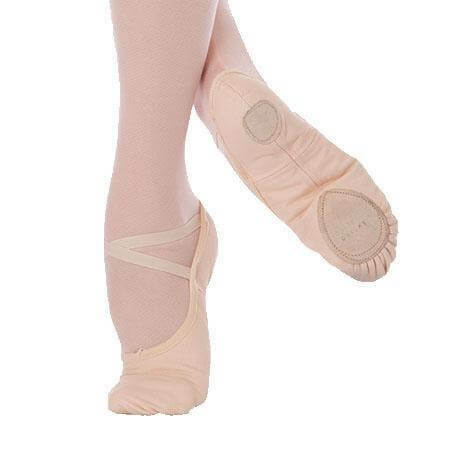 Sansha Adult Unisex #1Pro Leather Split-Sole Ballet Shoes S1L: Sansha's #1 Pro-inch leather split-sole ballet shoe features a fully hand stitched sole that does not expose thread for better durability. The sole is flush with upper, so there is nothing to catch on the floor. 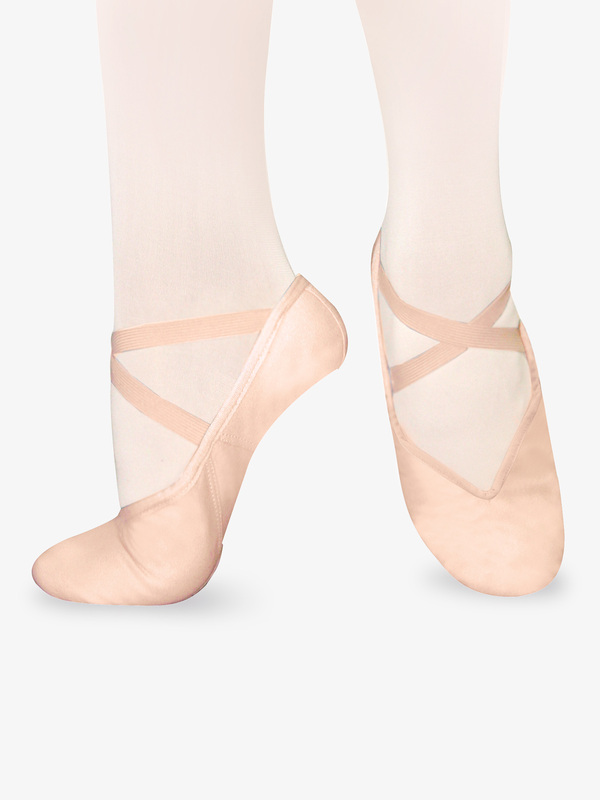 Criss-cross elastics attached at heel. 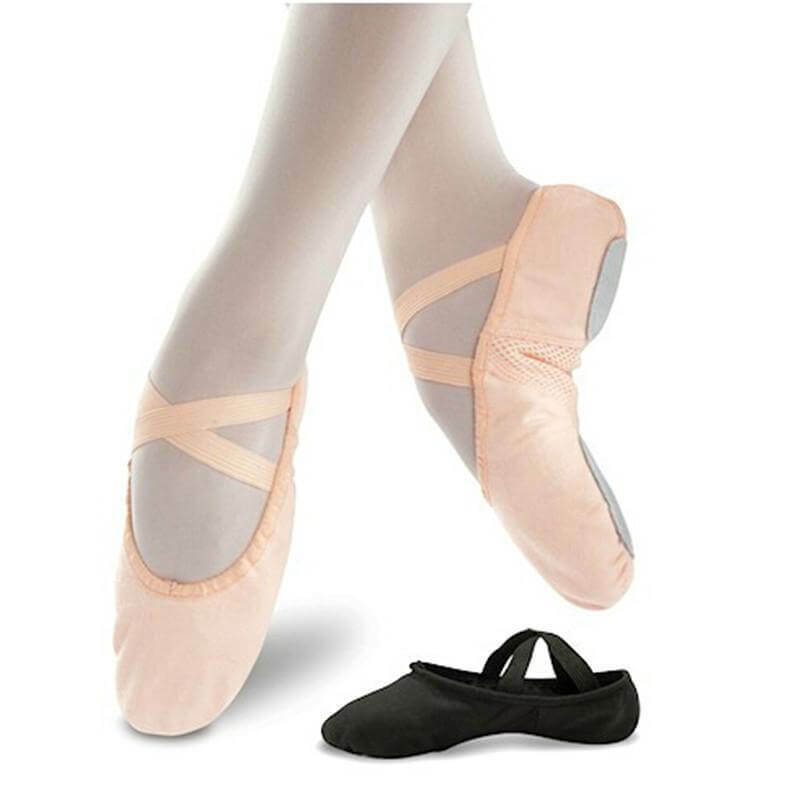 Sansha Adult Entrechat Canvas Split-Sole Ballet Shoes S8C: The Entrechat canvas ballet shoe features a canvas upper, long-lasting leather split sole, double strength sole stitching, foam protection heel padding, and attached elastics. 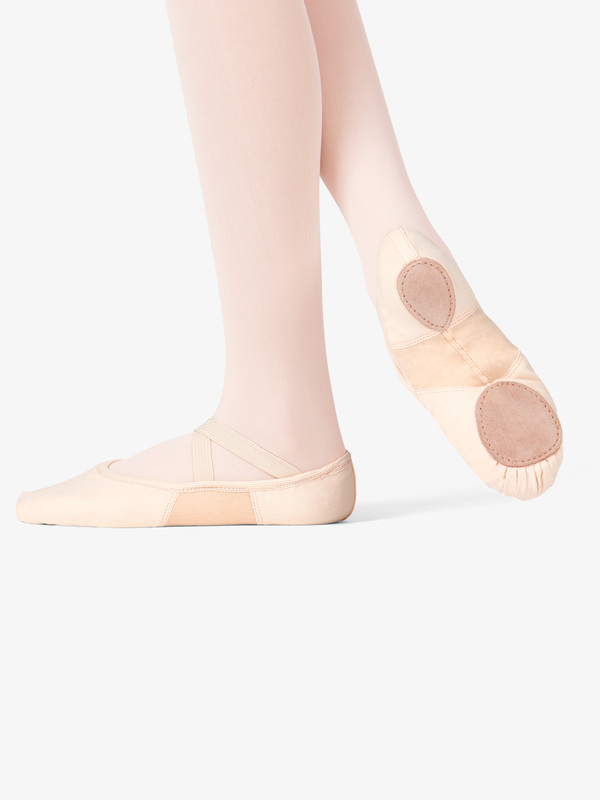 Sansha Adult Tendu Canvas Split-Sole Ballet Shoes S9C: The Tendu canvas ballet shoe features a canvas upper, a long-lasting leather split sole and a flattering V-shaped vamp with drawstrings for a snug fit that stays put. 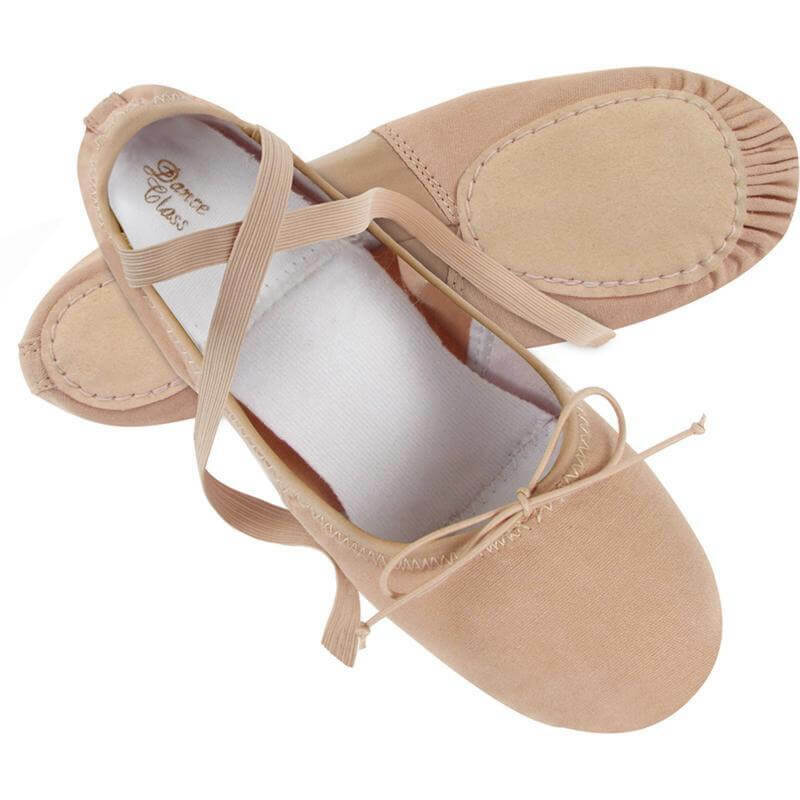 So Danca Girls Leather Full Sole Ballet Shoes BA90C: This full sole ballet shoe by So Danca is made of soft leather and includes a single pre-sewn elastic and a loose cotton lining. 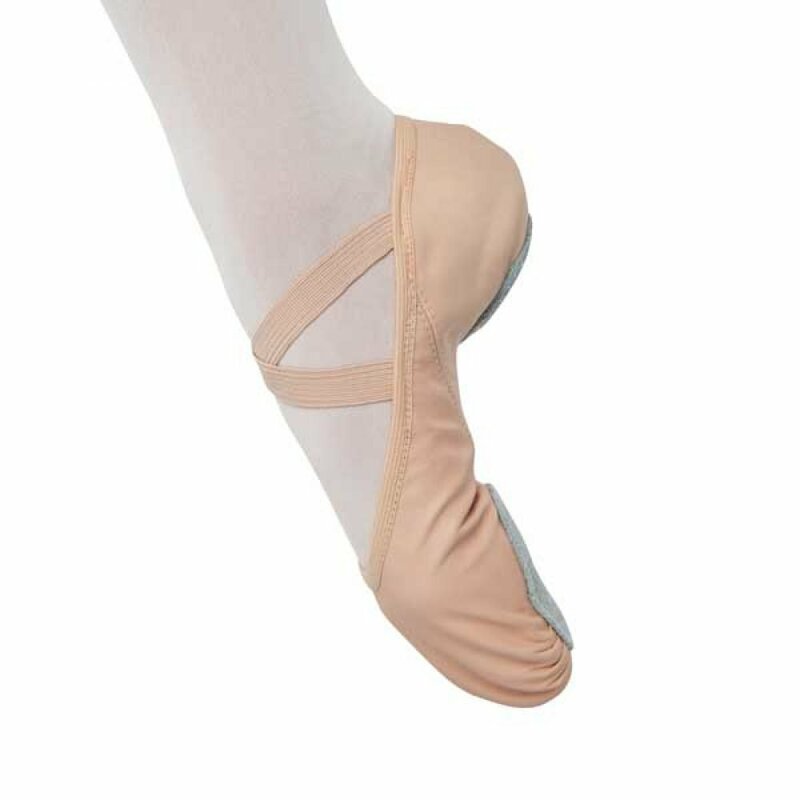 So Danca Womens Bliss Stretch Canvas Split-Sole Ballet Shoes SD16: So Danca's #1 selling ballet slipper! 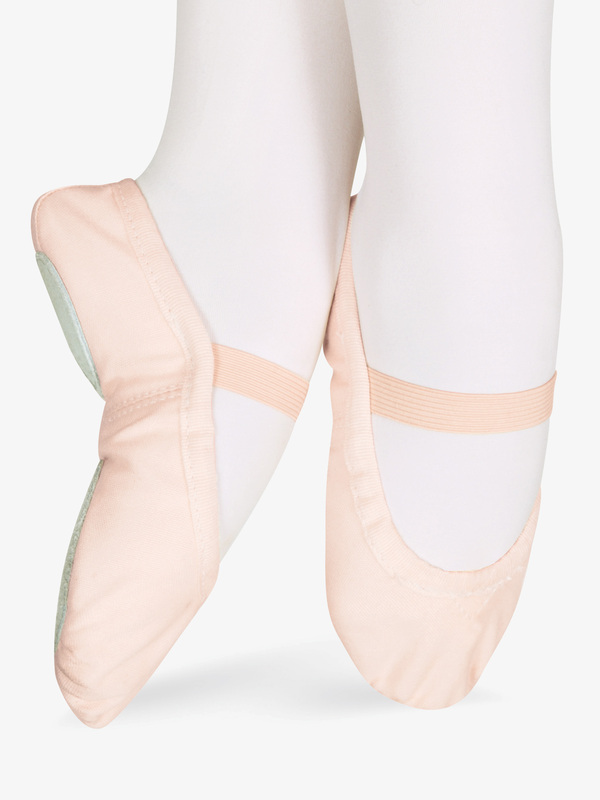 Beautifully made Bliss-inch ballet shoes feature a stretch canvas fabric that adheres perfectly to the arch without gaping on the sides, a split sole, and elastic binding for added support. 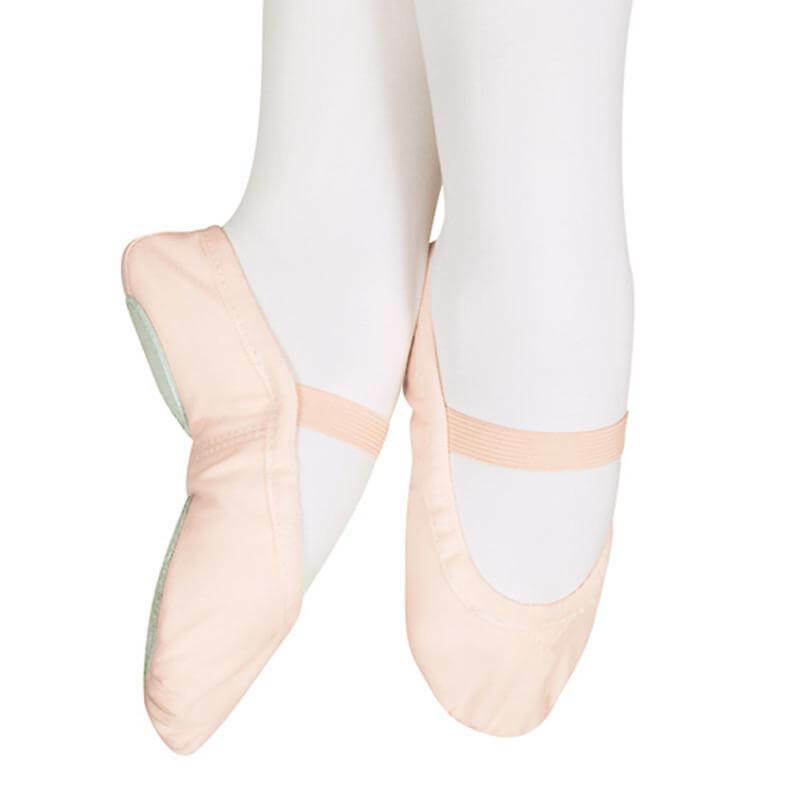 So Danca Girls Bliss Stretch Canvas Split-Sole Ballet Shoes SD16C: So Danca's #1 selling ballet slipper! 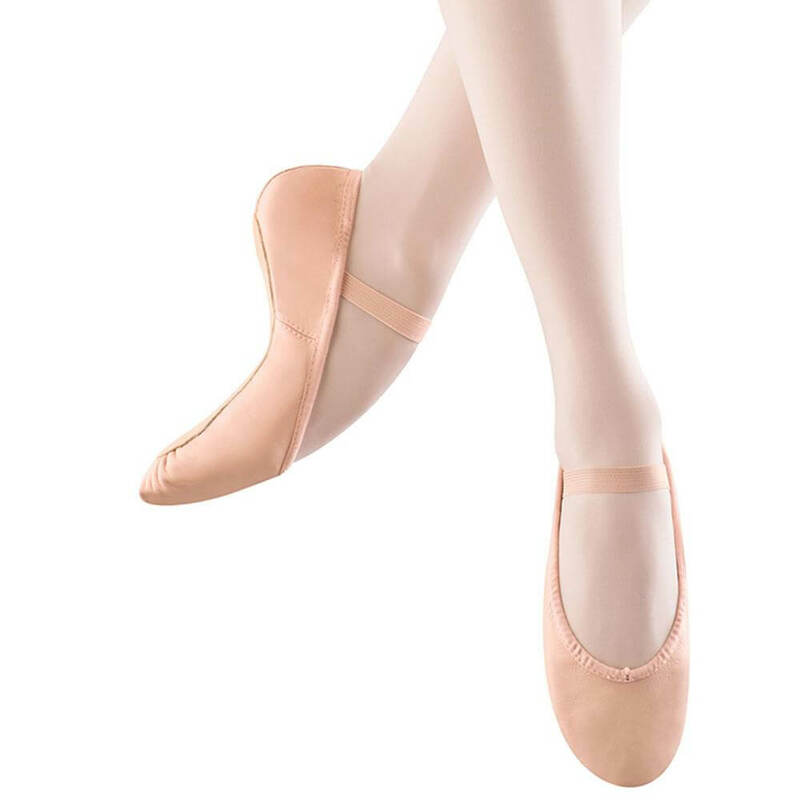 Beautifully made Bliss-inch ballet shoes feature a stretch canvas fabric that adheres perfectly to the arch without gaping on the sides, a split sole, and elastic binding for added support. 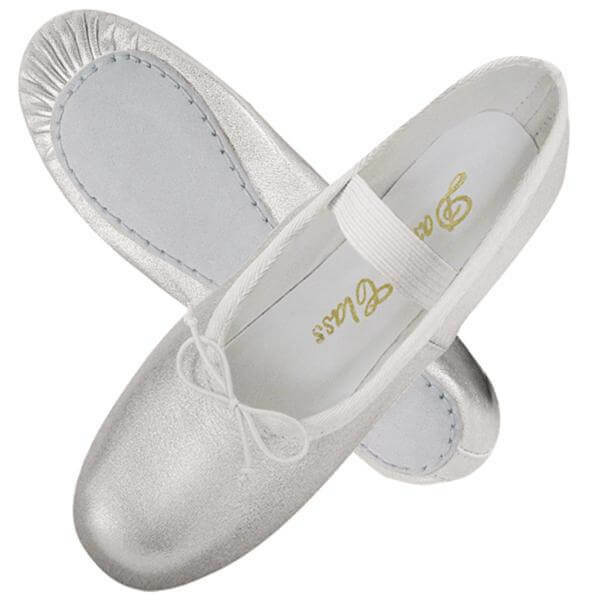 Bloch Girls Glitterdust Full Sole Ballet Shoes S0225GG: The sparkly Glitterdust ballet shoe features a non-leather glitter upper, ultra comfortable soft cotton lining with pink bunny prints, an elastic drawstring, and full leather sole. 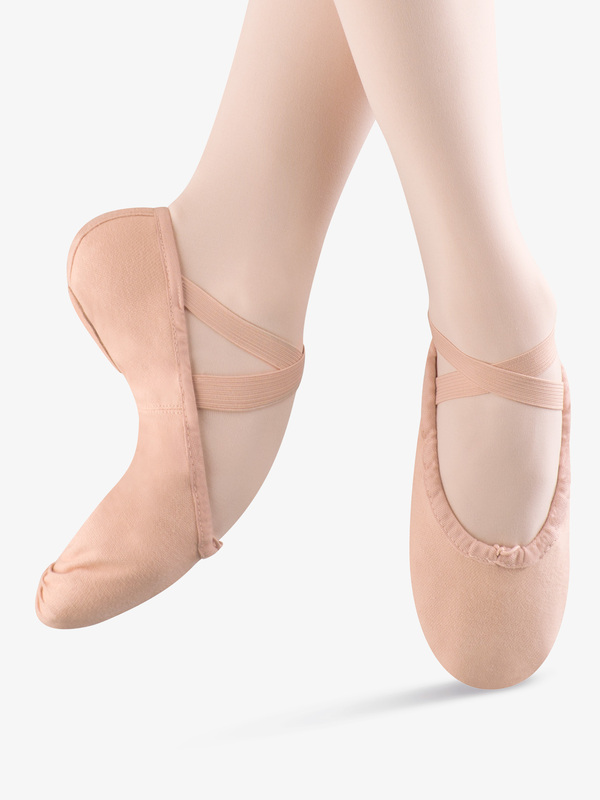 Each shoe has a space inside to write the ballerina's name and comes in a mesh drawstring pouch. 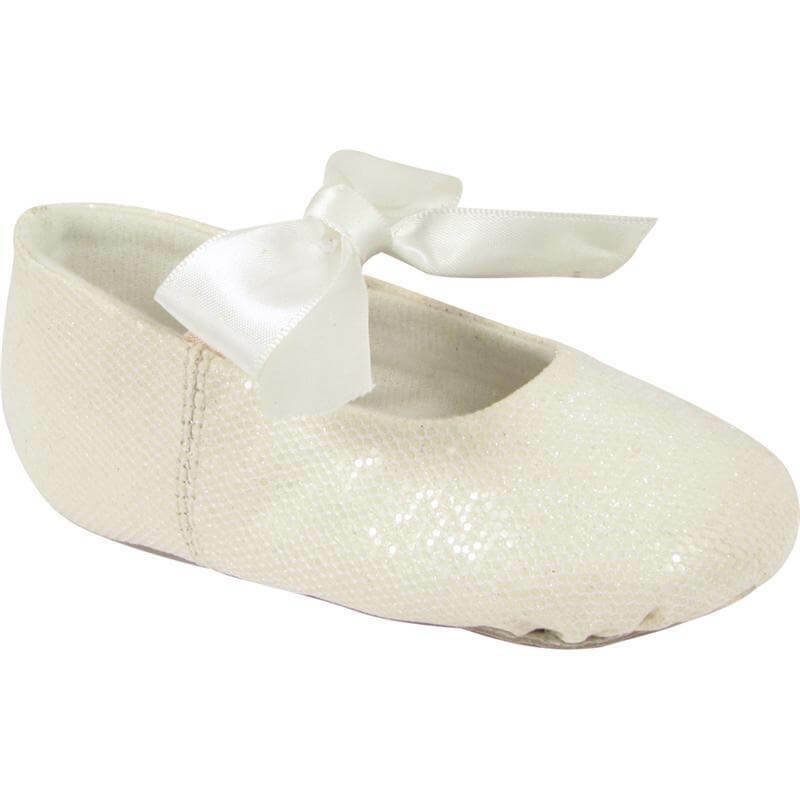 Bloch Child and Toddler Glitterdust Full Sole Ballet Shoes S0225TG: The sparkly Glitterdust toddler ballet shoe features a non-leather glitter upper, ultra comfortable soft cotton lining with pink bunny prints, an elastic drawstring, and full leather sole. 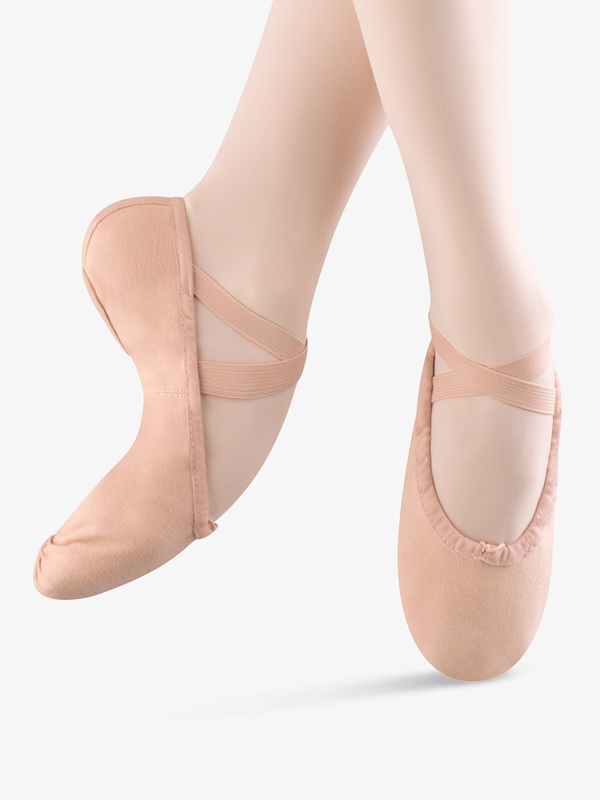 Each shoe has a space inside to write the ballerina's name and comes in a mesh drawstring pouch. Bloch Girls Belle Leather Full Sole Ballet Slippers S0227G: She'll be the Belle in class or on stage with these new snug-fit full sole ballet shoes from Bloch. 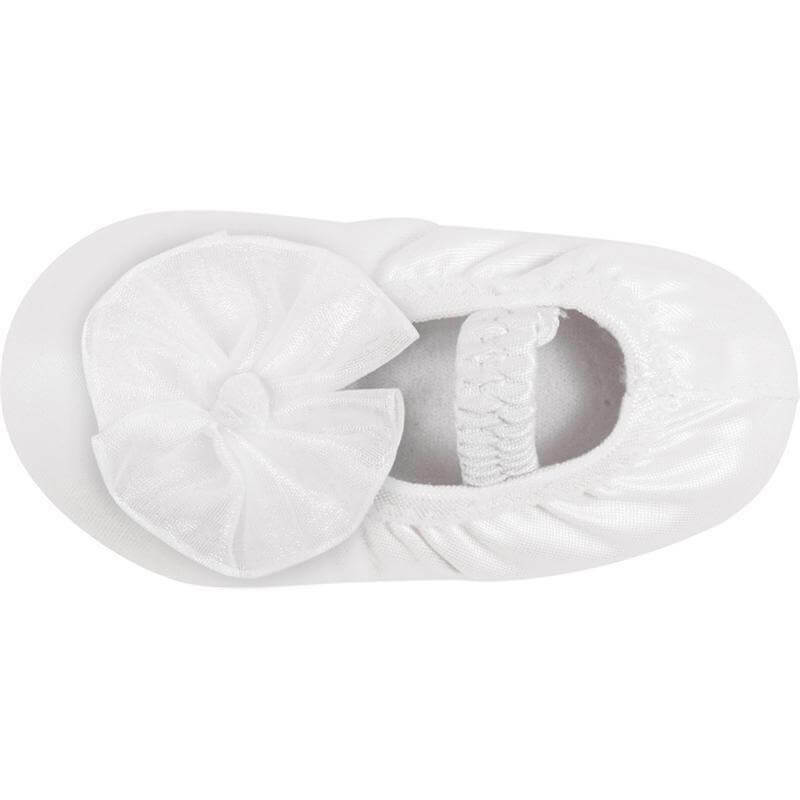 Made just for girls, Belle comes in both medium and wide widths that accommodate growing feet. And with a stretch binding, pesky drawstrings aren't there for little hands to get distracted with. 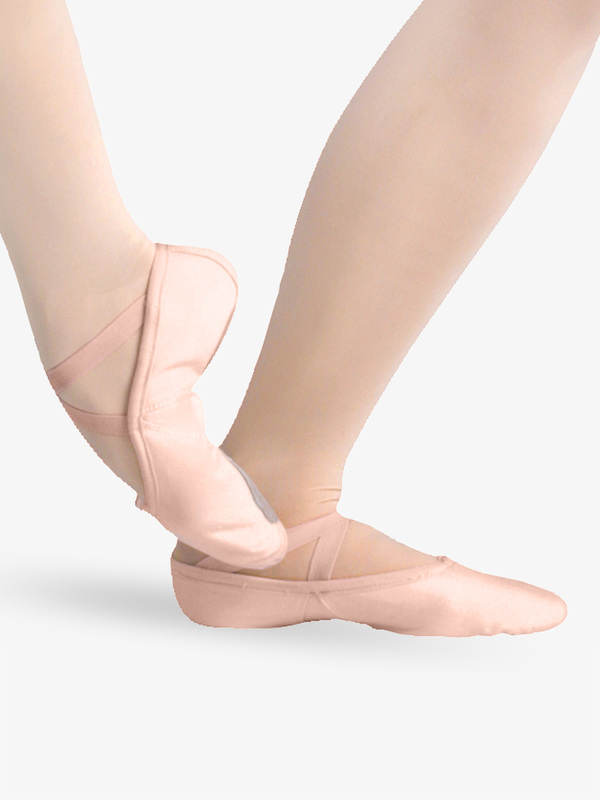 And with a full sole design, little feet will learn how to point and arch with ease! 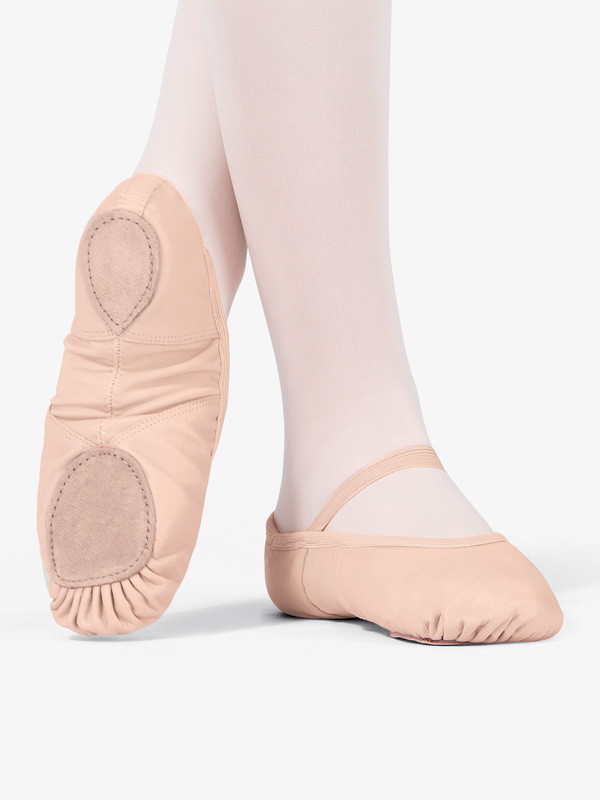 Bloch Adult Dansoft Leather Split-Sole Ballet Slippers S0258L: Bloch's split-sole version of their classic ballet slipper, the Dansoft, is ideal for the beginning dancer. Comes with pre-sewn elastics. 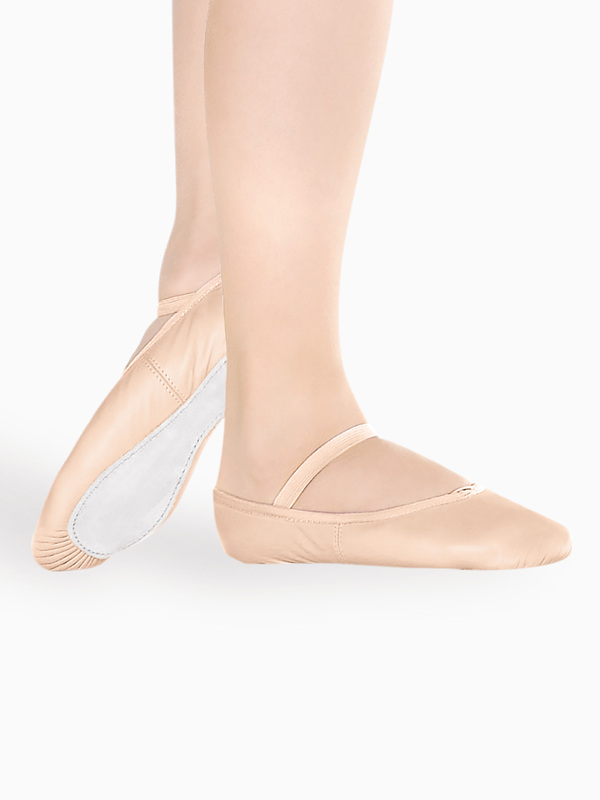 Bloch Adult Pro-Arch Canvas Split-Sole Ballet Shoes S0271L: Bloch's Pro-Arch-inch split-sole ballet shoe features a soft and durable square canvas upper combined with fine mesh inserts that hug the foot. Elastic binding encircles the top line of the shoe to create a continuous and clean line. The forefoot outsole pad creates a flatter platform to pivot on, eliminating bulk in the arch and providing maximum metatarsal protection. 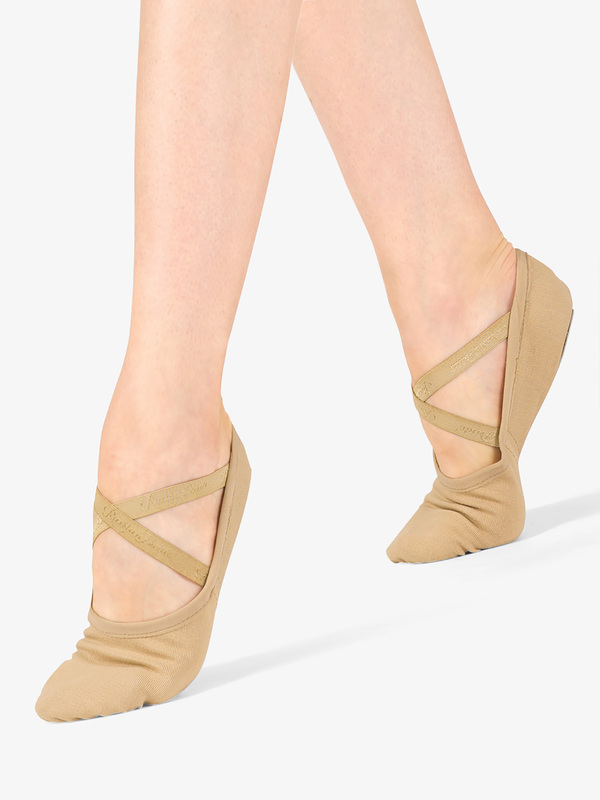 Criss-cross elastics attached at heel. 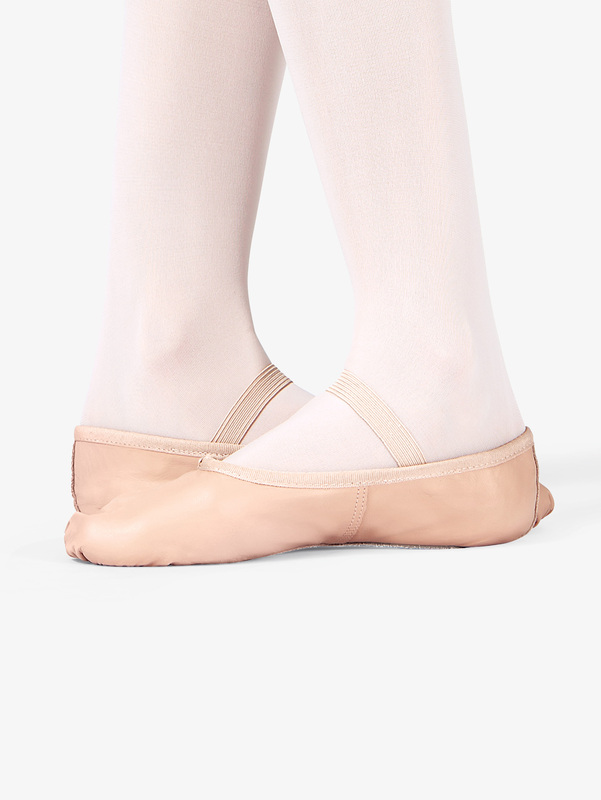 Capezio Girls Hanami Canvas Split Sole Ballet Slipper 2037C: The unique Hanami split sole canvas slipper features an innovative 4-way stretch canvas upper, absorbent lining, suede sole, and streamlined fitting designed to reflect the contours of the foot. 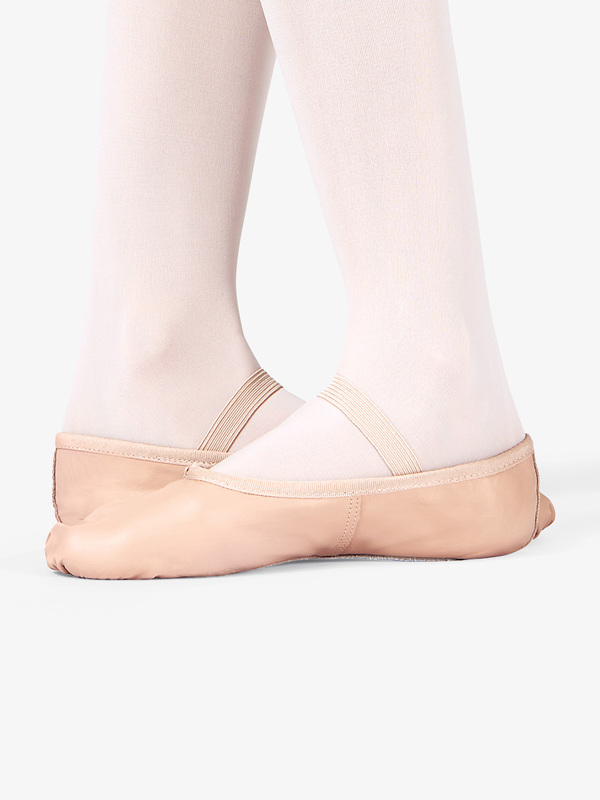 Capezio Adult Hanami Canvas Split Sole Ballet Slipper 2037W: The unique Hanami split sole canvas slipper features an innovative 4-way stretch canvas upper, absorbent lining, suede sole, and streamlined fitting designed to reflect the contours of the foot. So Danca Womens Brit Split Sole Ballet Shoes SD60: Elegant Brit-inch leather ballet shoes features a split sole and an elastic casing and a band across the foot to provide easy entry and secure hold. 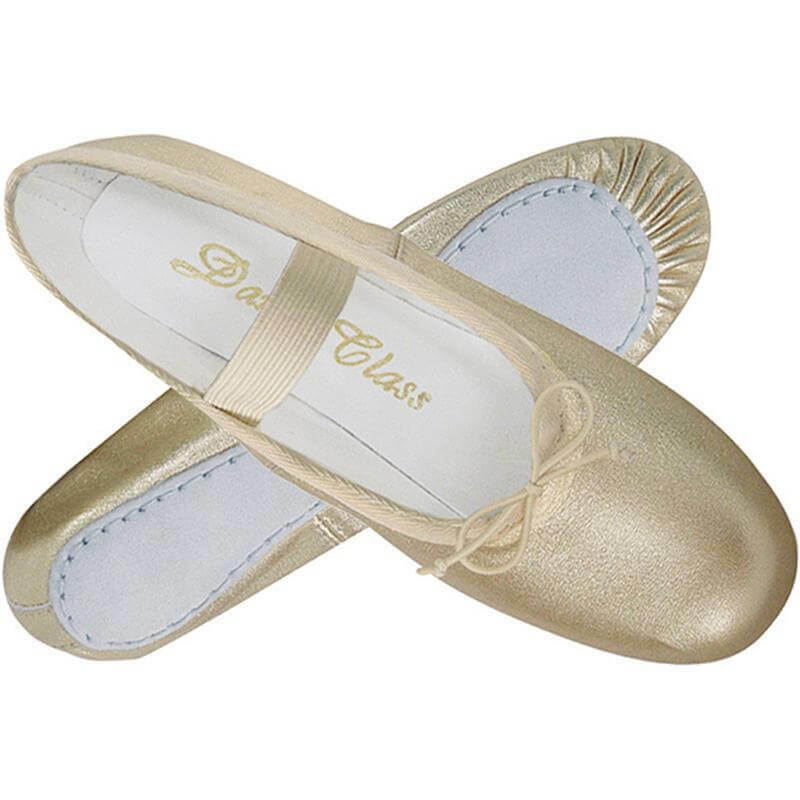 So Danca Girls Brit Split Sole Ballet Shoes SD60S: Elegant Brit-inch leather ballet shoes features an elastic casing and a band across the foot to provide easy entry and secure hold. 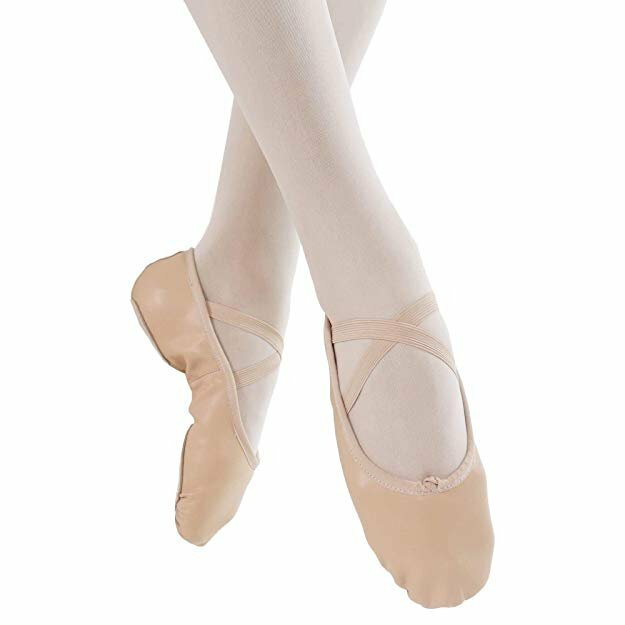 Theatricals Adult Economy Leather Full Sole Ballet Shoes T1000: This full sole ballet shoe is constructed with a comfortable, yet durable leather. Features include a cotton lining, a cotton drawstring, a suede sock liner, and an attached elastic strap. 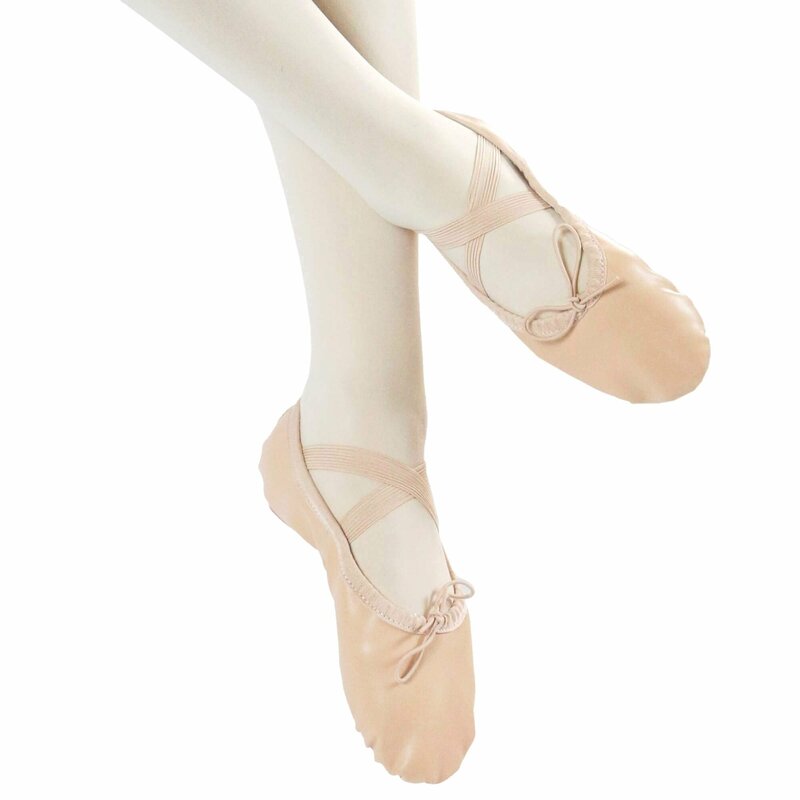 Theatricals Child Economy Leather Full Sole Ballet Shoes T1000C: This full sole ballet shoe is constructed with a comfortable, yet durable leather. Features include a cotton lining, a cotton drawstring, a suede sock liner, and an attached elastic strap. 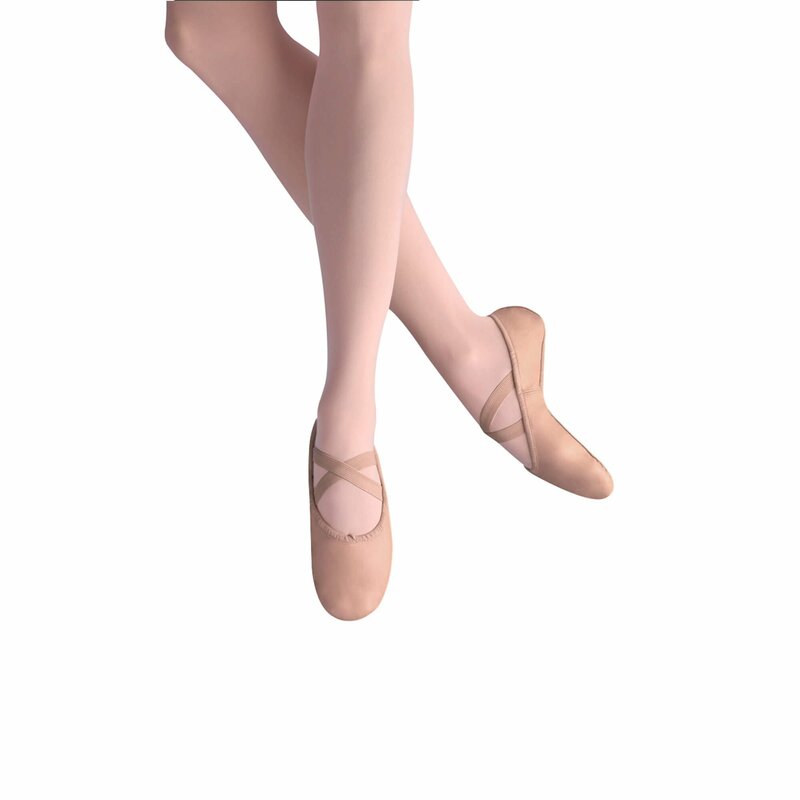 Theatricals Girls Princess Full Sole Leather Ballet Shoes T1015C: The Princess-inch ballet shoe is an all-leather shoe that's perfect for dance class or dress up! 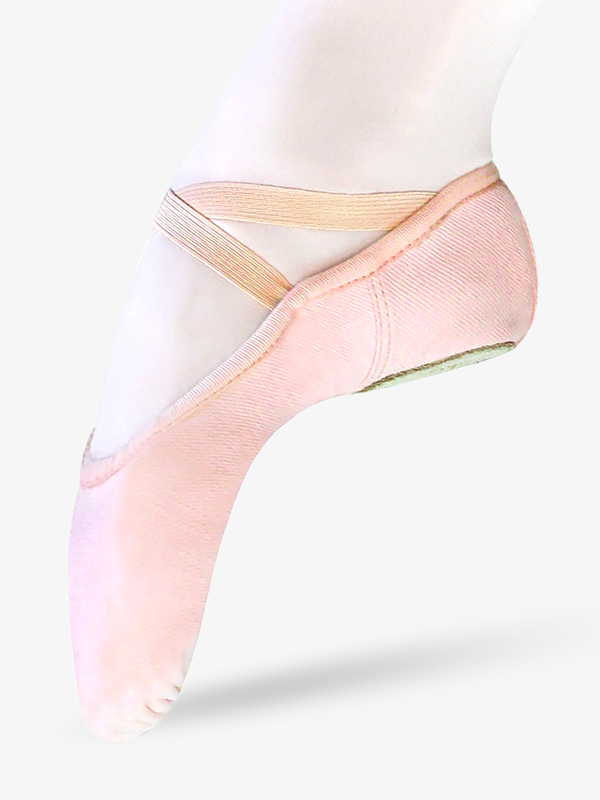 The brighter Princess pink color is feminine and makes your daughter feel like she's a prima ballerina. Made from a soft, comfortable leather and printed in the inner liner with dainty crowns. Shoe also features a cotton binding and drawstring. 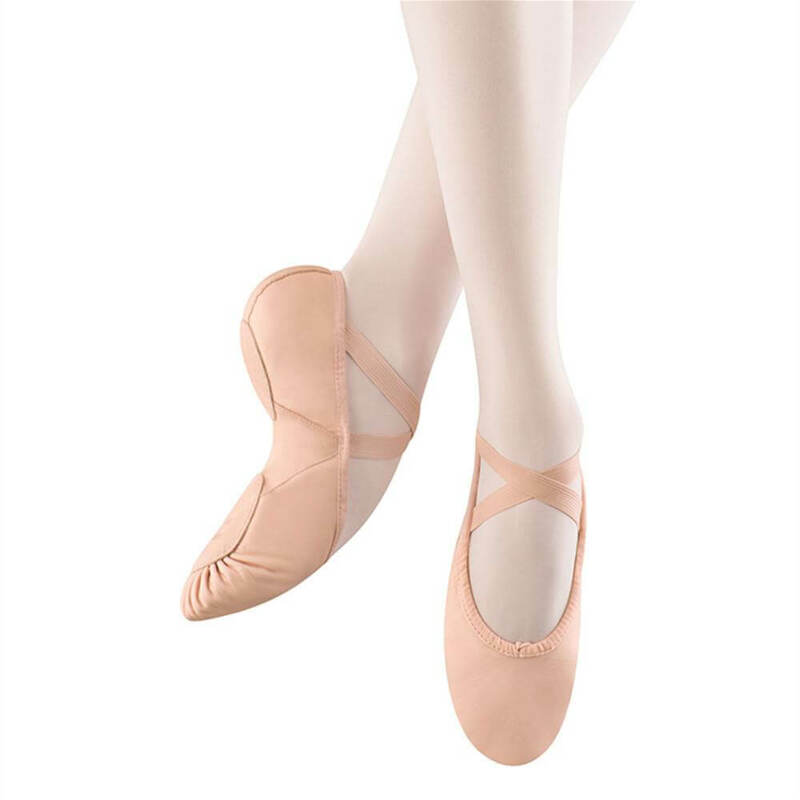 Theatricals Adult Premium Leather Full Sole Ballet Shoes T2000: This advanced full sole ballet shoe is constructed of lightweight, super soft, durable leather. Features include a cotton lining, a cotton drawstring, a suede sock liner, and an attached elastic strap. 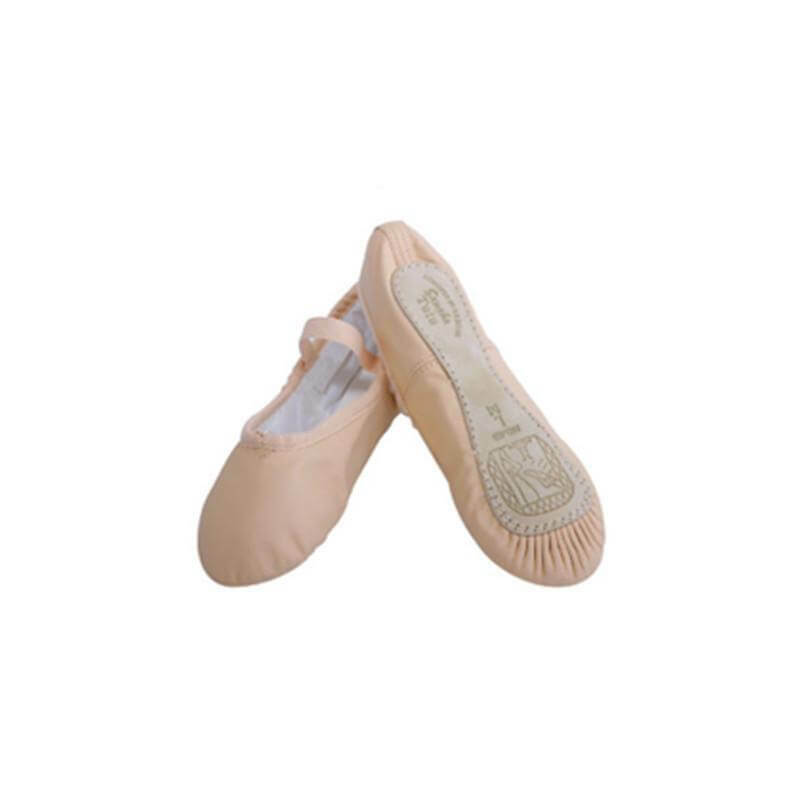 Theatricals Child Premium Leather Full Sole Ballet Shoes T2000C: This advanced full sole ballet shoe is constructed of lightweight, super soft, durable leather. Features include a cotton lining, a cotton drawstring, a suede sock liner, and an attached elastic strap. 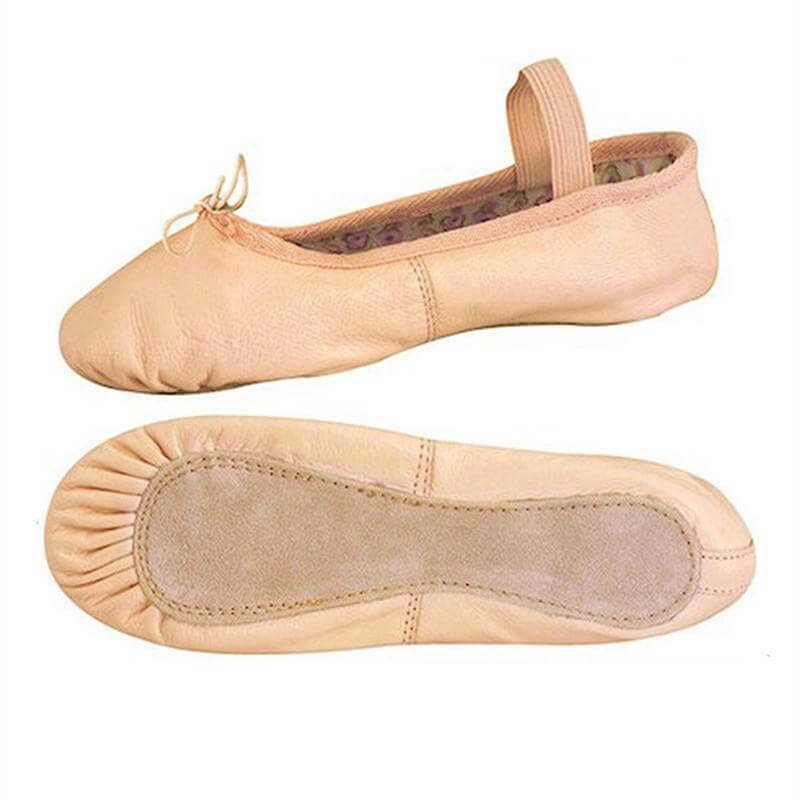 Theatricals Adult Leather Split-Sole Ballet Shoes T2700: This split-sole ballet shoe is made from a lightweight, soft, leather upper and features an elastic drawstring, a cotton lining, a suede sock lining, and an attached elastic. Ultra flexible, comfortable, and durable. 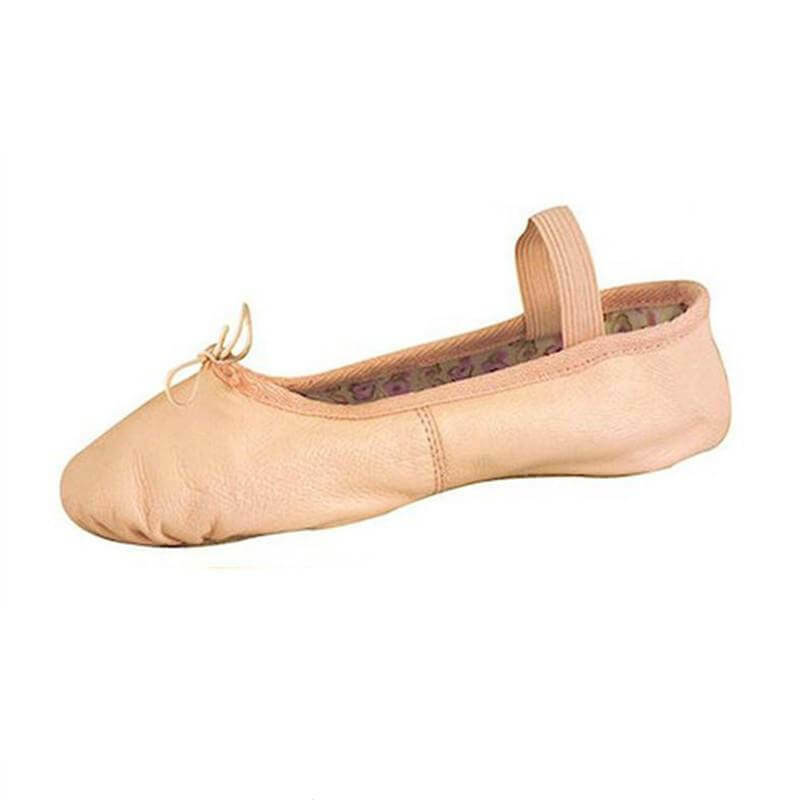 Theatricals Child Leather Split-Sole Ballet Shoes T2700C: This split-sole ballet shoe is made from a lightweight, soft, leather upper and features an elastic drawstring, a cotton lining, a suede sock lining, and an attached elastic. Ultra flexible, comfortable, and durable. 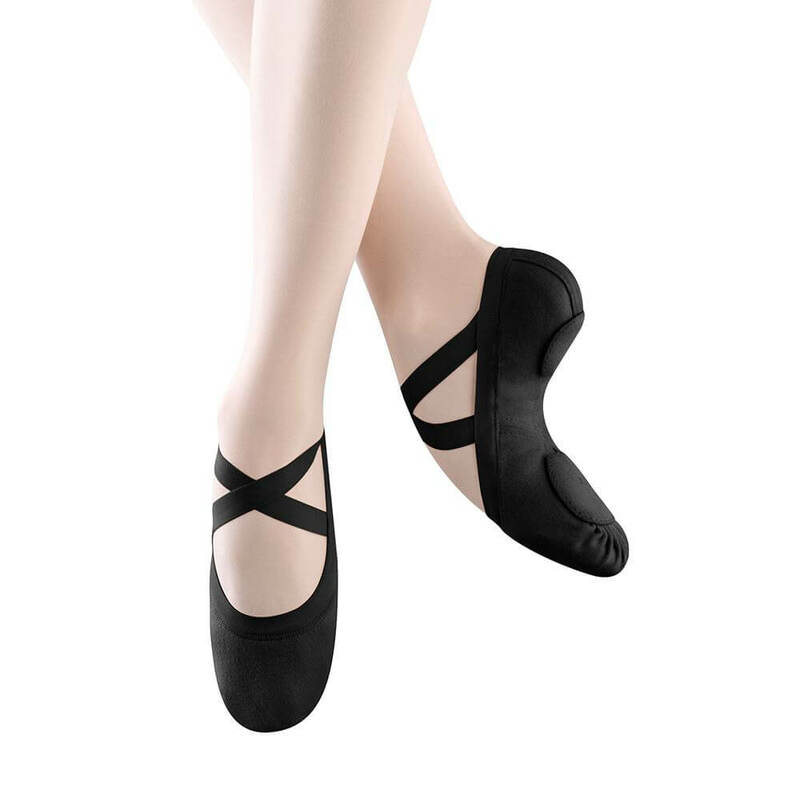 Theatricals Adult Neoprene Arch Leather Split-Sole Ballet Shoes T2800: Split-sole, ultra soft, leather upper with neoprene insert ballet shoe features a single elastic over the instep and elasticized binding for a snug comfortable fit. Elasticized binding eliminates the need for a drawstring. Never worry about stopping class to tie a shoe again! 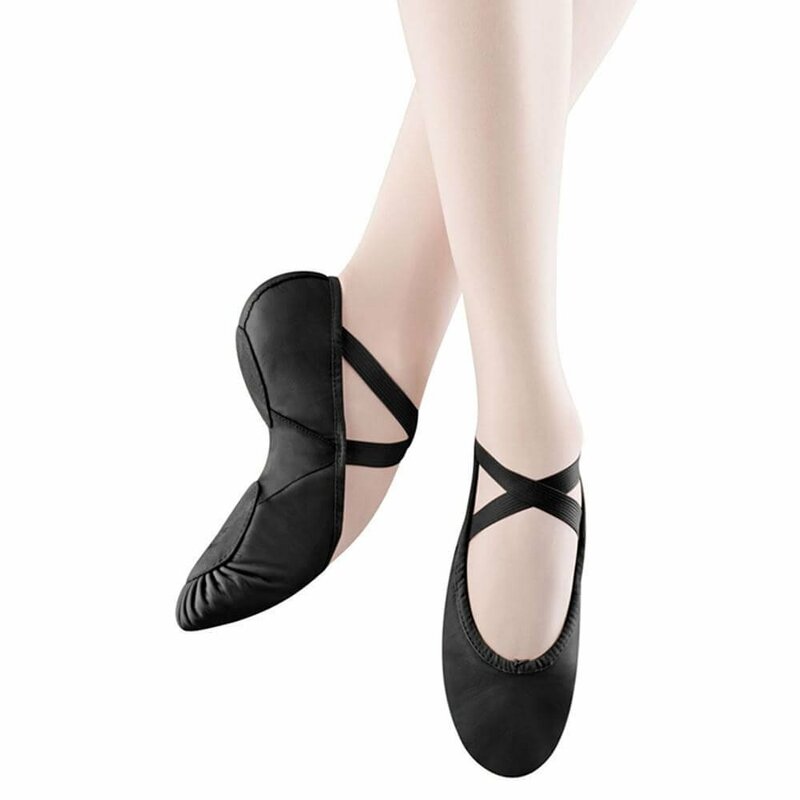 Theatricals Child Neoprene Arch Leather Split-Sole Ballet Shoes T2800C: Split-sole, ultra soft, leather upper with neoprene insert ballet shoe features a single elastic over the instep and elasticized binding for a snug comfortable fit. Elasticized binding eliminates the need for a drawstring. Never worry about stopping class to tie a shoe again! 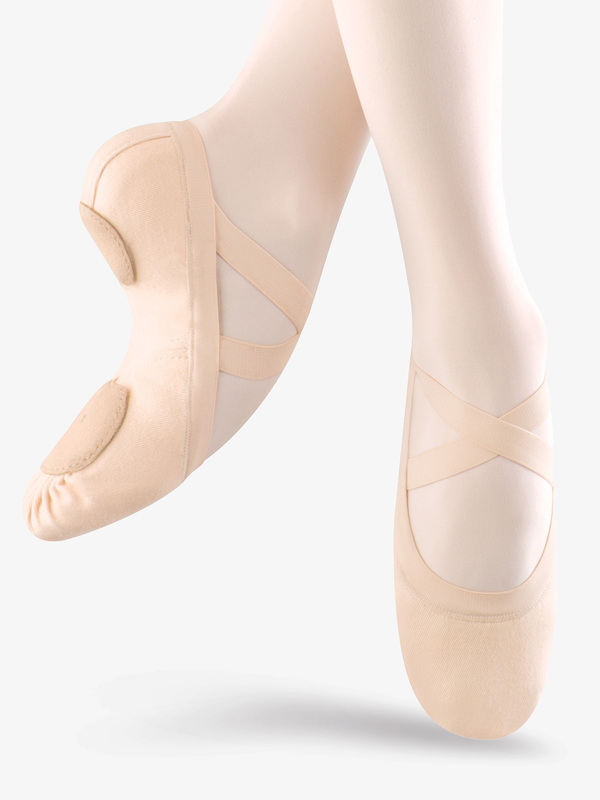 Bloch Child Pump Canvas Split-Sole Ballet Shoes S0277G: Bloch's child Pump-inch split-sole canvas ballet shoe has a heel seam cushion and a breakthrough technique that reduces underfoot lumps. 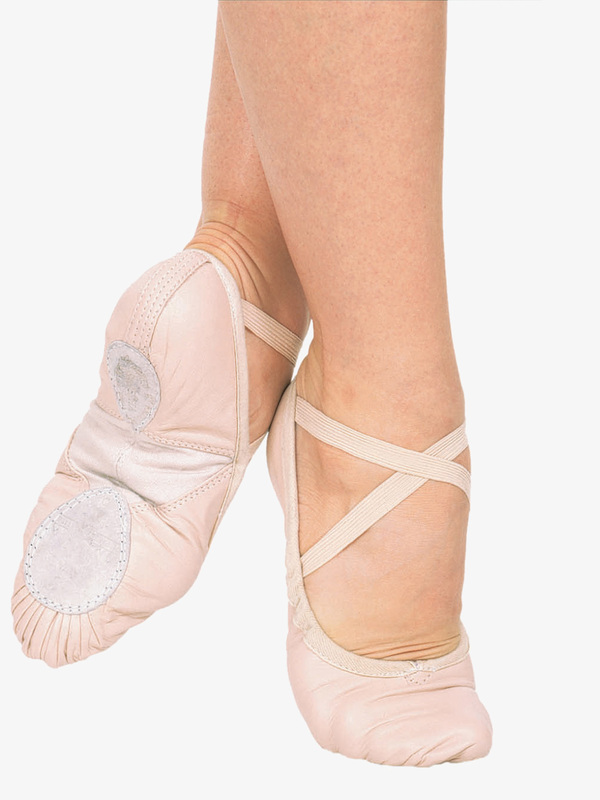 Criss-cross elastics attached at heel. 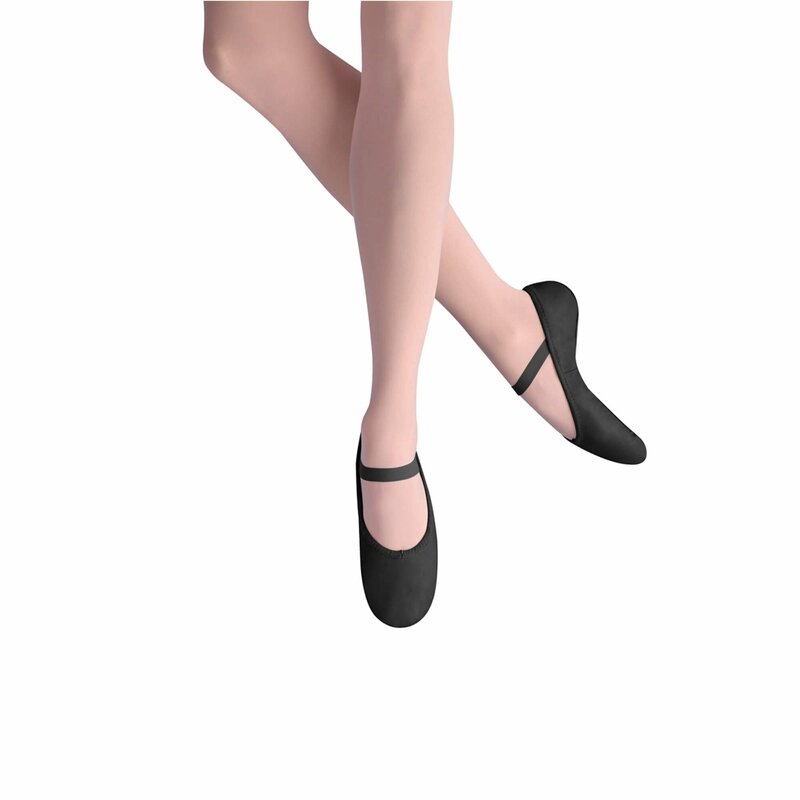 Bloch Womens Pump Canvas Split-Sole Ballet Shoes S0277L: Bloch's Pump-inch split-sole canvas ballet shoe features a new last and upper, a heel seam cushion and a breakthrough technique reducing underfoot lumps. 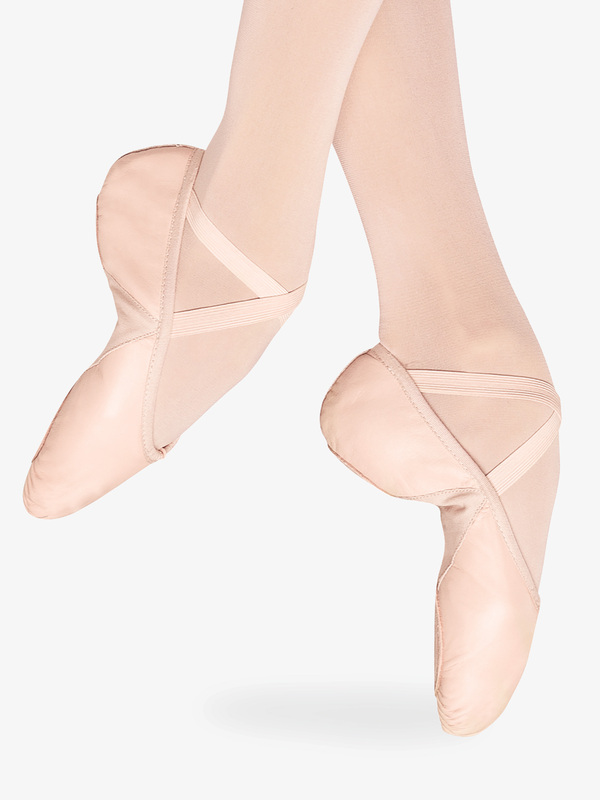 Criss-cross elastics attached at heel. Bloch Mens Pump Canvas Split Sole Ballet Shoes S0277M: The Pump-inch ballet shoe is a Bloch favorite, and soon to be yours as well! 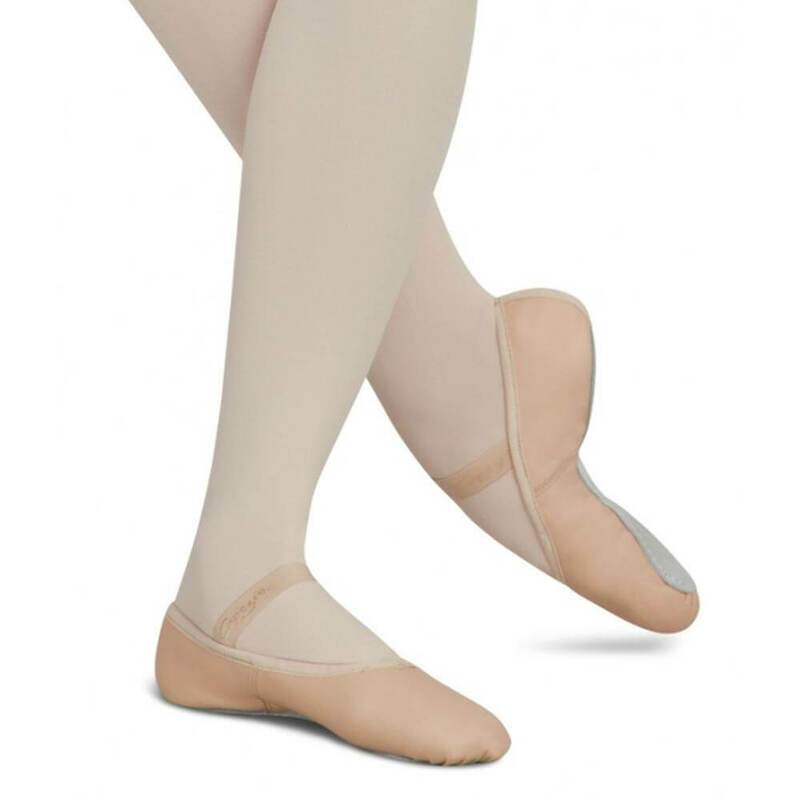 Shoes feature a arch-hugging canvas construction that is soft, durable, and reduces bunching under the foot when pointing, a heel seam cushion for smooth lines and comfort, and teardrop shaped pads at the toe and heel to promote extra flexibility for the foot. 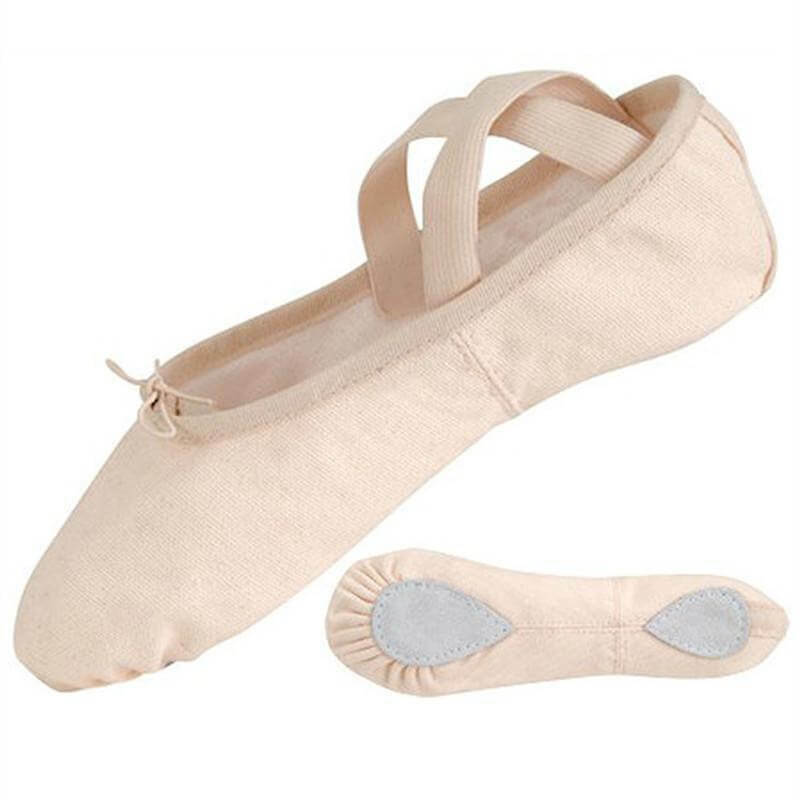 Bloch Child Zenith Stretch Canvas Split-Sole Ballet Shoes S0282G: The world's first 4-way stretch canvas ballet shoe! The unique streamlined design combined with the ground breaking Ultimate Stretch canvas contours to the foot providing comfort and support while allowing for greater definition of the arch and point of the foot. Features include elasticized binding and a split-sole suede outsole. 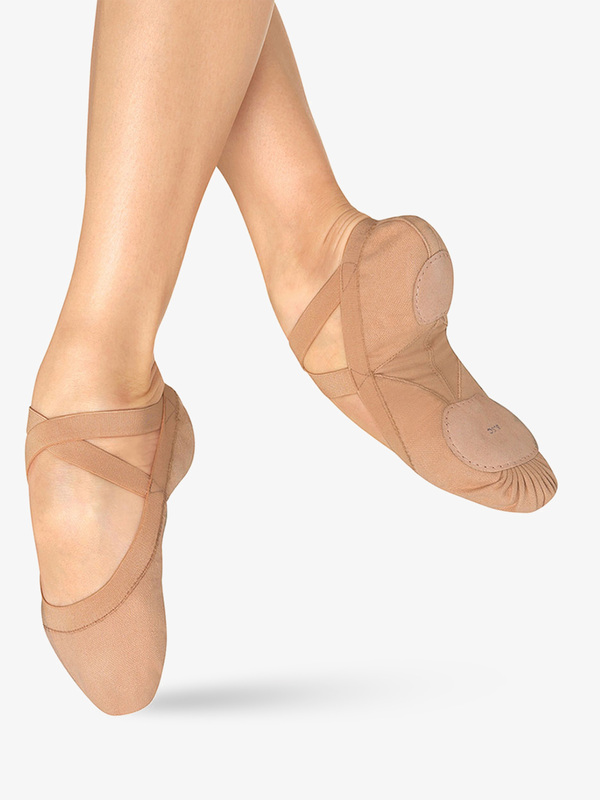 Bloch Girls Performa Stretch Canvas Ballet Shoes S0284G: Give the performance of your life with the support of the Performa-inch shoe - featuring a lightweight stretch canvas that adheres to the arch beautifully, a toe shape designed specifically for ultimate balance, a shock absorbing heel cushion, pre-sewn crossed elastic straps, and generous front and rear leather split sole pads. 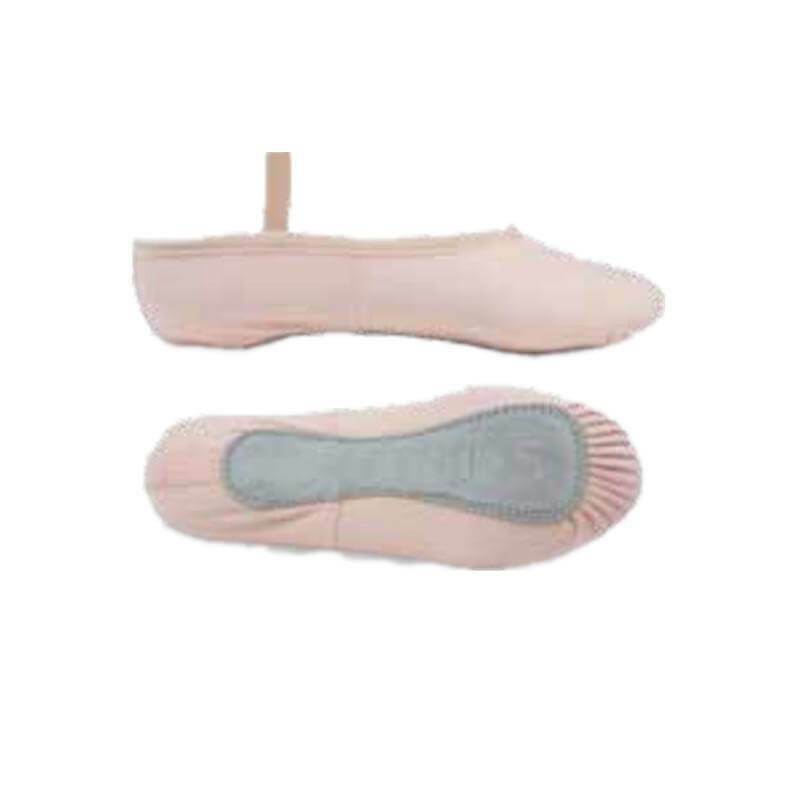 Bloch Womens Performa Stretch Canvas Ballet Shoes S0284L: Give the performance of your life with the support of the Performa-inch shoe - featuring a lightweight stretch canvas that adheres to the arch beautifully, a toe shape designed specifically for ultimate balance, a shock absorbing heel cushion, pre-sewn crossed elastic straps, and generous front and rear leather split sole pads. 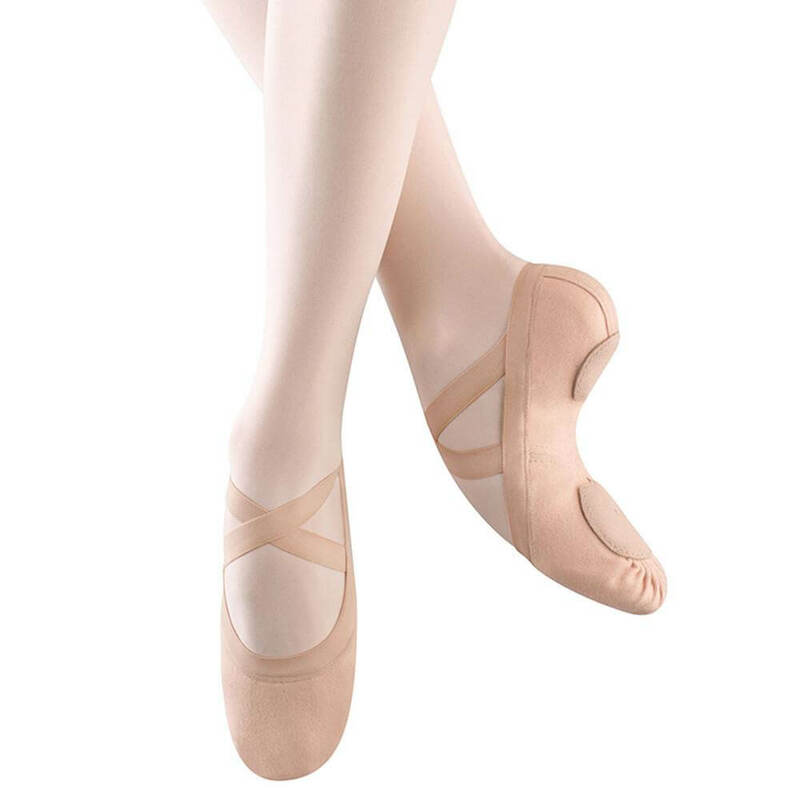 Bloch Adult Pro Elastic Canvas Split-Sole Ballet Shoes S0621L: The Pro Elastic-inch by Bloch features a canvas upper with an elastic piece that replaces the binding and drawstring. 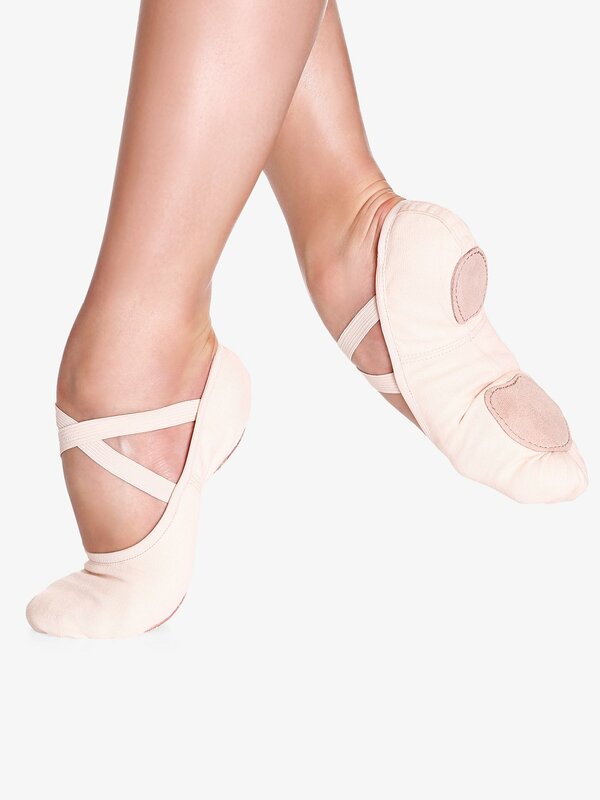 The elastic contours the foot in a full range of movement, and evenly distributes tension around the foot relieving pressure on the Achilles tendon. Pre-sewn crossed instep elastics. 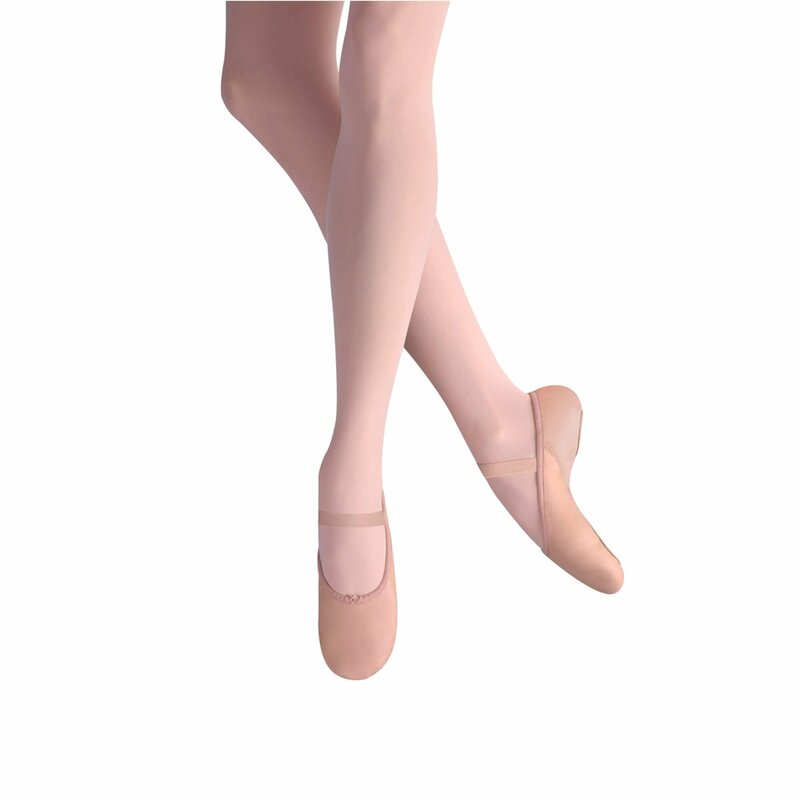 Bloch Girls Synchrony Ballet Shoes S0625G: Dancers who love Bloch's Zenith ballet shoe will love the Synchrony split sole ballet slipper! 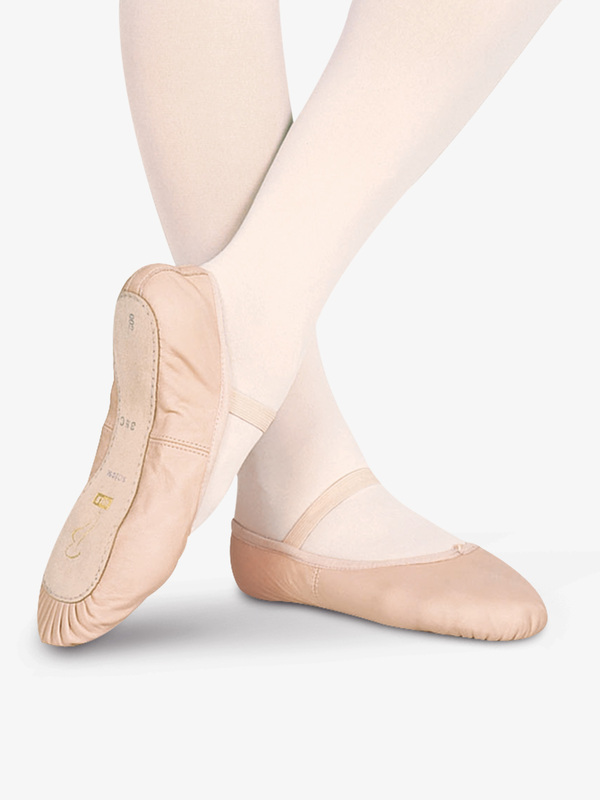 Features include an ultimate stretch canvas, a wider toe, wider outsole shape, wide elastic around the top line and crossed elastic at the instep. 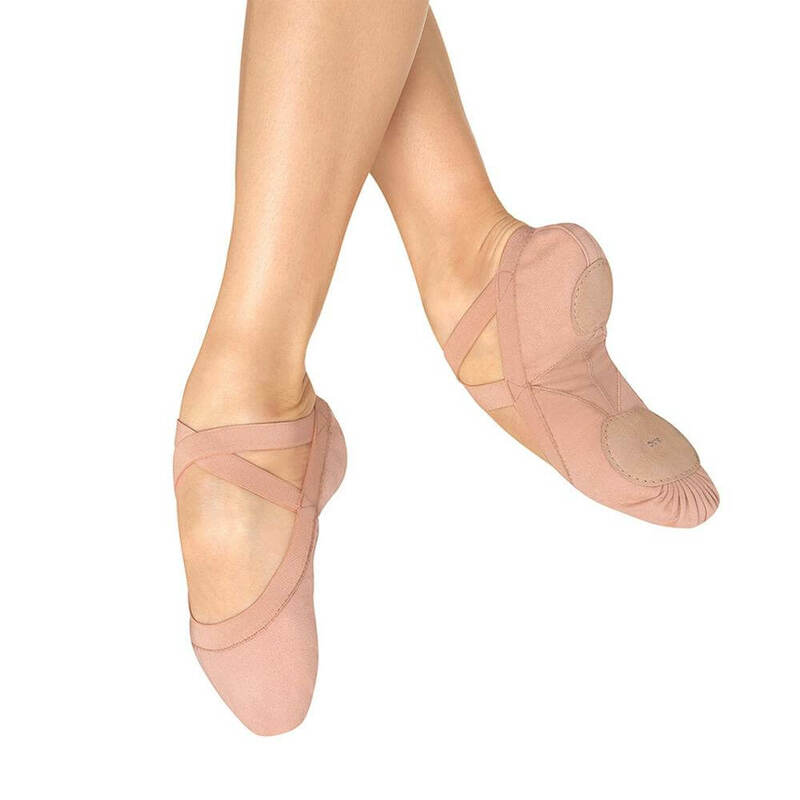 Bloch Adult Synchrony Split Sole Ballet Shoes S0625L: Dancers who love Bloch's Zenith ballet shoe will love the Synchrony split sole ballet shoe! 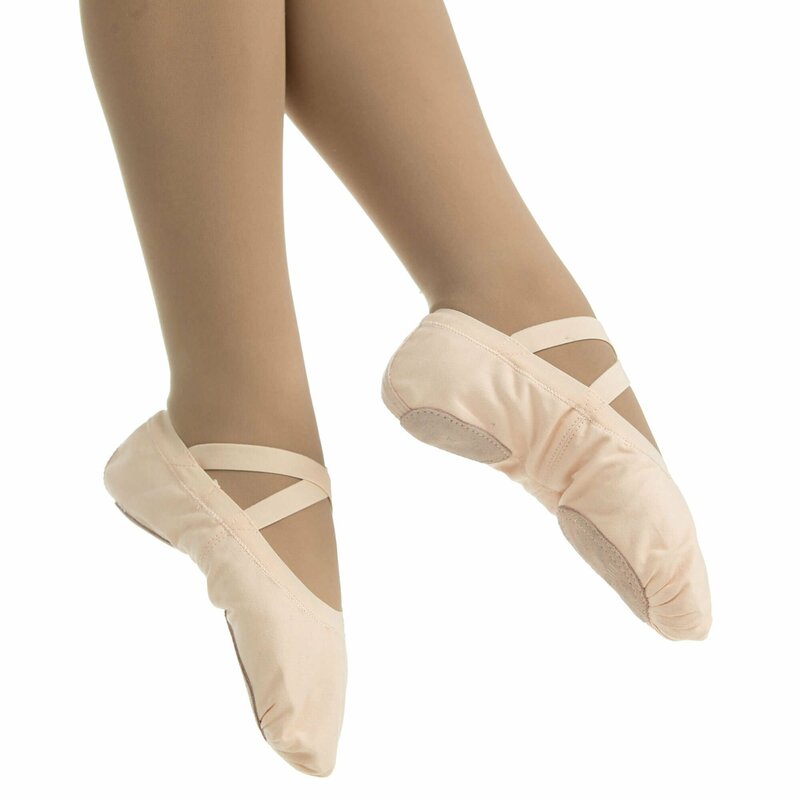 Features include an ultimate stretch canvas, a wider toe, wider outsole shape, wide elastic around the top line and crossed elastic at the instep. 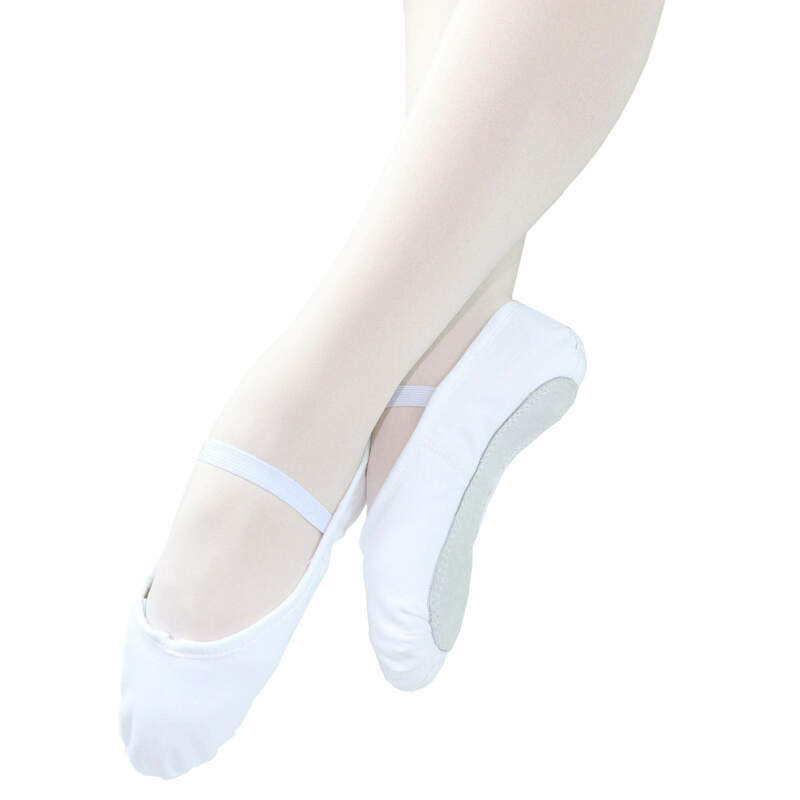 Body Wrappers Adult TotalSTRETCH Canvas Split-Sole Ballet Shoes 246A: The TotalStretch canvas ballet shoe is made from an antibacterial and wicking stretch canvas on a curved shoe to create a left and right shoe. There is an anatomically correct deep cut inner top-line sole arch design for flattering arches. The bungie memory, soft coated lingerie elastic draw string is bound by an elastic binding for an optimum and non-abrasive hold. It snugs the slipper to your foot so no straps are required. Features a split suede leather sole and heel patch, with a spongy leather sole for comfort. 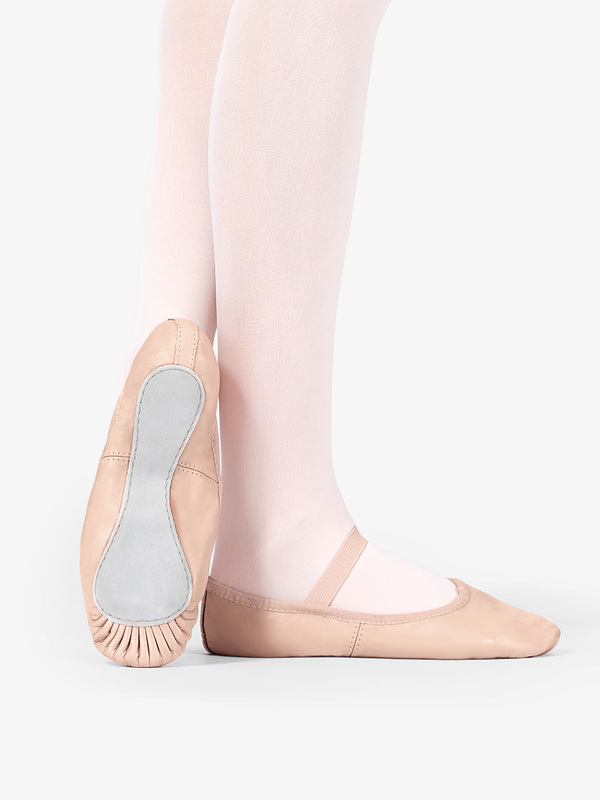 The short front sole and long pleats allow room for toes and arch enhancement. The strong canvas supports and protects muscles with a secure fit. Pre-sewn attached elastics. 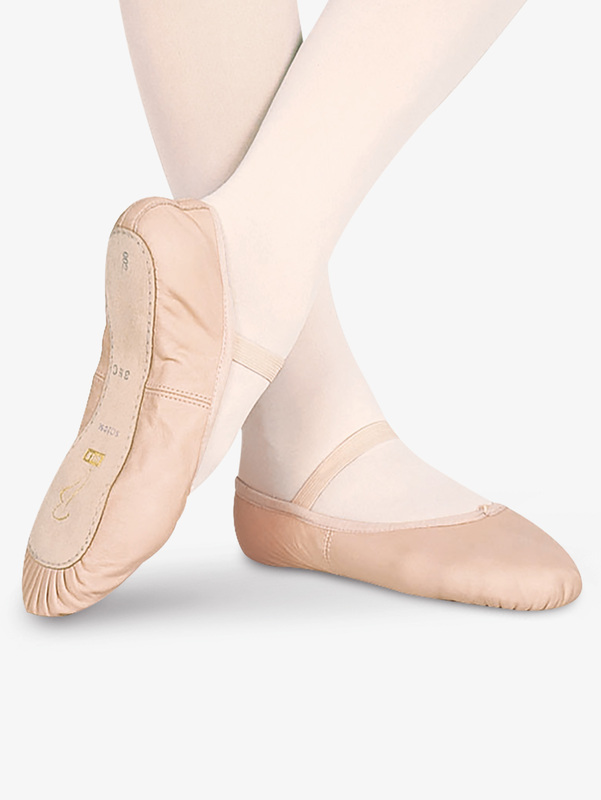 Capezio Mens Romeo Leather Split-Sole Ballet Slippers 2020: Capezio's Romeo-inch split-sole leather ballet slipper with elastic drawstring. Elastics pre-sewn at sides of heel. 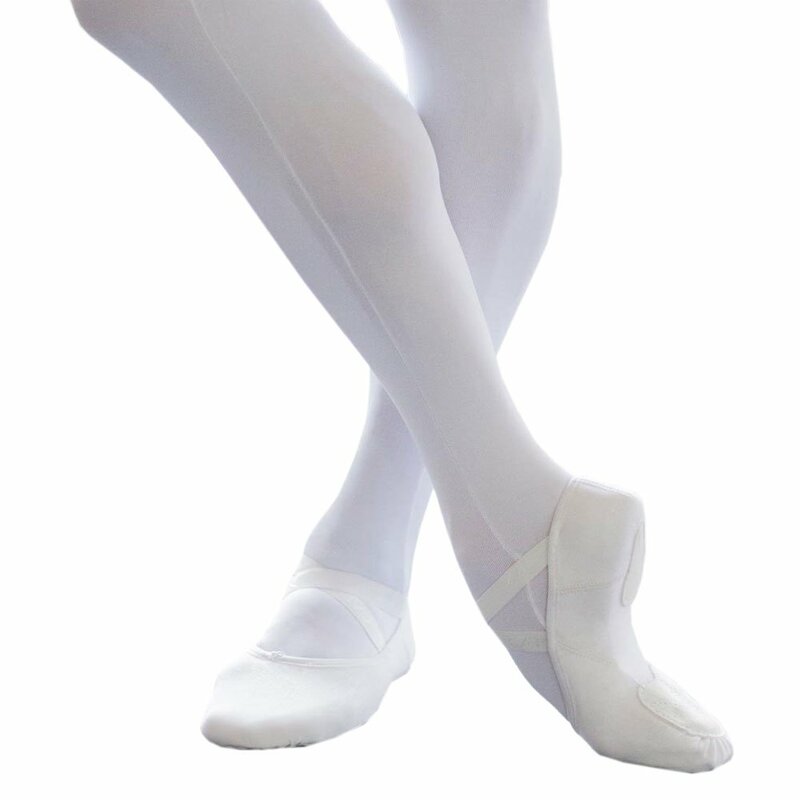 Capezio Mens Romeo Canvas Split-Sole Ballet Shoes 2021: This ballet shoe is constructed of soft and durable lightweight canvas. Features contoured suede sole patches and a moisture absorbent, brushed polyester/cotton lining. Patented seamless, sculpted arch shaped on a mens last. Bar-tacked elastic drawstring and pre-attached elastic at the heel. 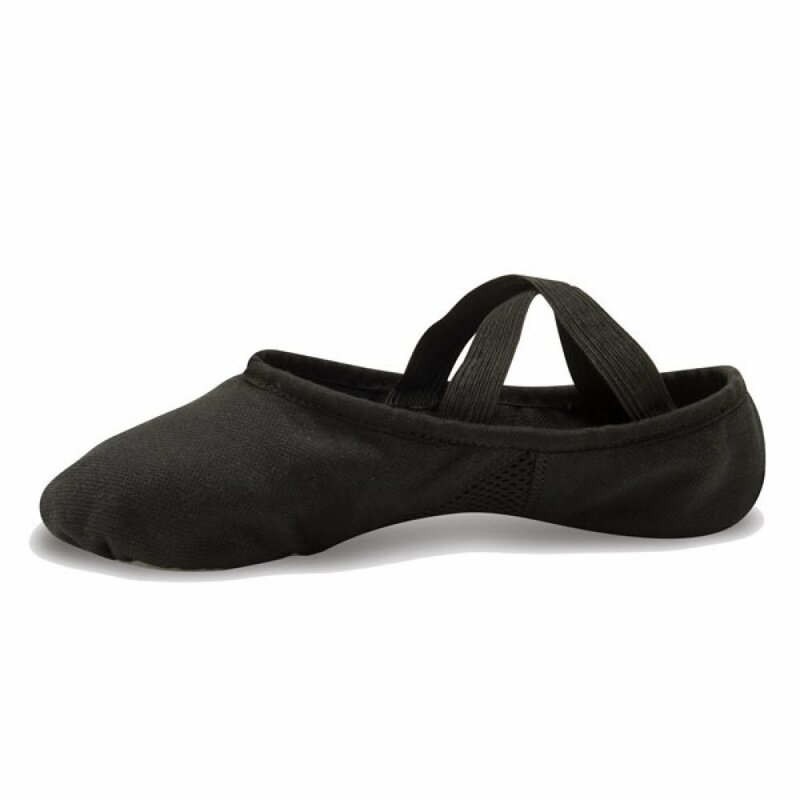 Capezio Mens Canvas Split Sole Ballet Slipper 2022M: Capezio's ballet slipper features a comfortable stretch canvas and a seamless arch that moves with the foot. 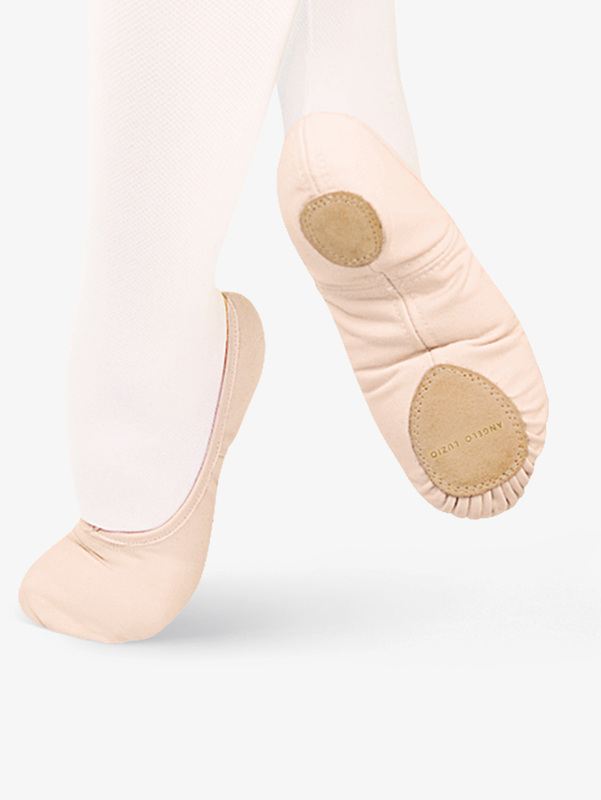 Capezio Child Love Ballet Leather Ballet Shoes 2035C: Capezio's Love Ballet-inch Shoe features growth pocket technology that accommodates up to a 1/2 size of foot growth! Other features include a leather upper, elastic binding with no adjustment required, a suede sole and an adjustable instep strap with a heart shaped button on each end. 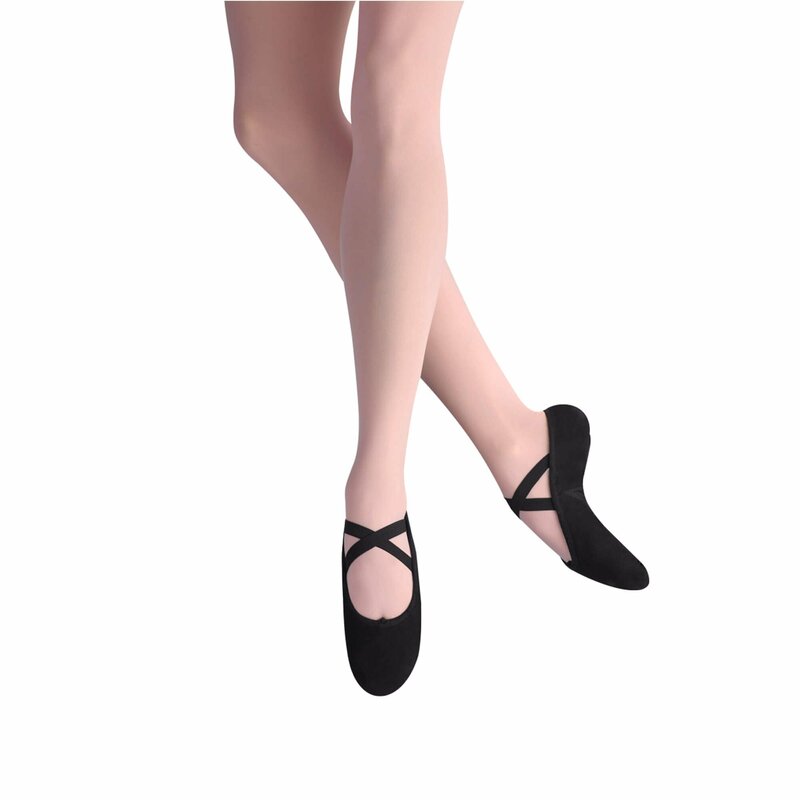 Theatricals Adult Canvas Split-Sole Ballet Shoes T2900: This split-sole ballet shoe features a lightweight, durable, soft canvas upper. An elastic drawstring, a cotton lining, and a suede sock lining make this shoe comfortable, and great fitting. 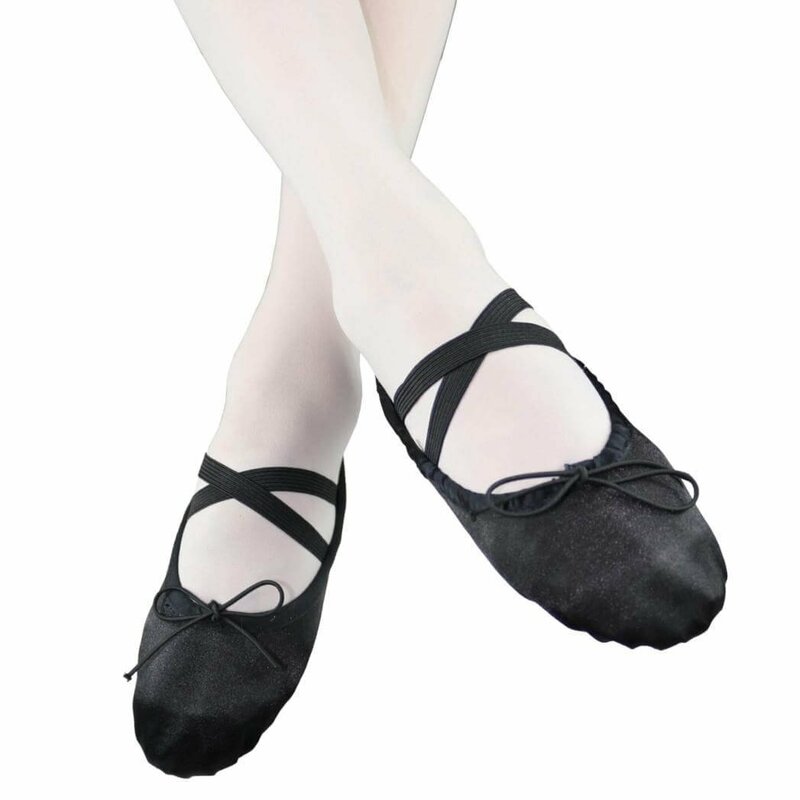 Theatricals Child Canvas Split-Sole Ballet Shoes T2900C: This split-sole ballet shoe features a lightweight, durable, soft canvas upper. An elastic drawstring, a cotton lining, and a suede sock lining make this shoe comfortable, and great fitting. 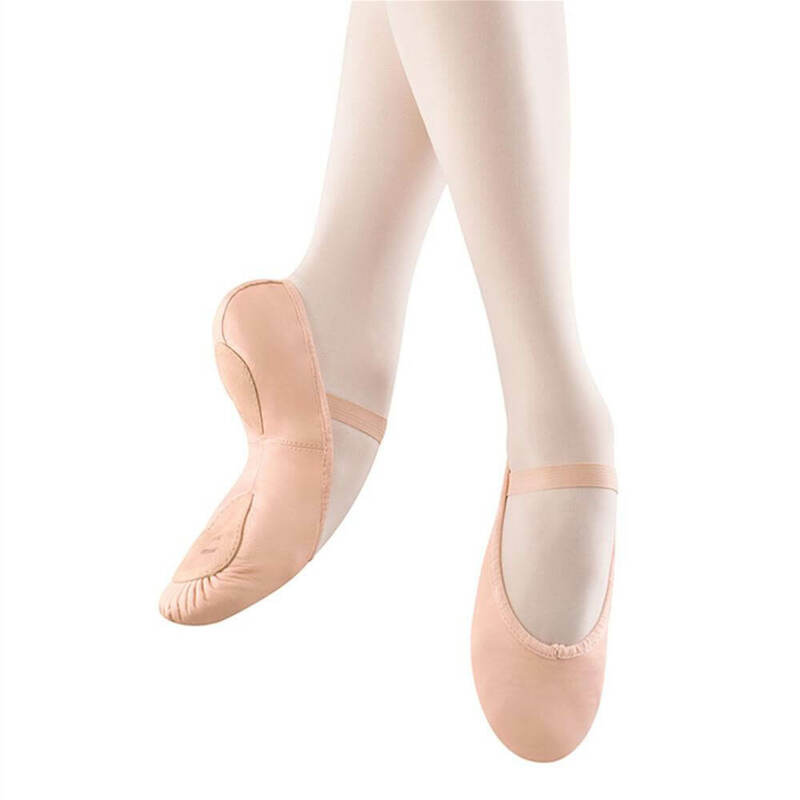 Theatricals Adult SofTouch Canvas Stretch Split-Sole Ballet Shoes T2915: Feel the floor in absolute comfort with our SofTouch-inch split sole canvas and spandex ballet shoe. 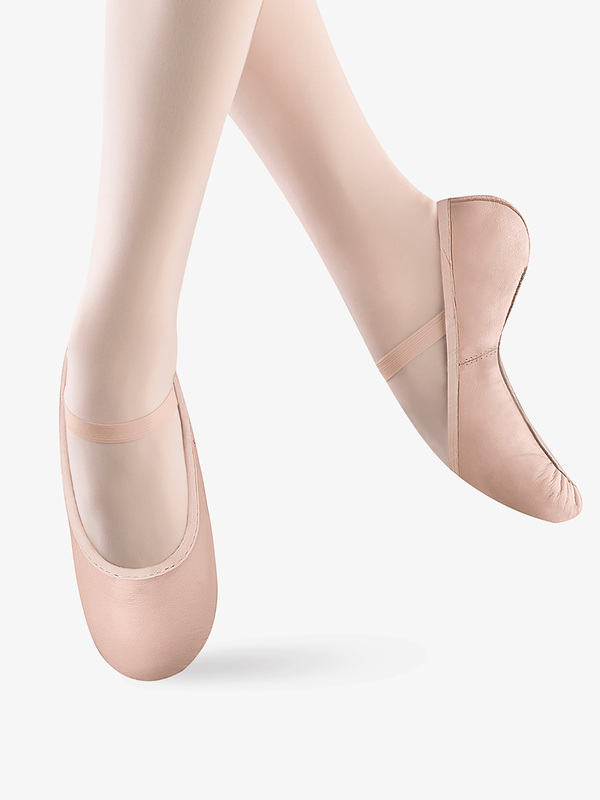 The soft stretch spandex insert between the heel and sole will hug your arch while you feel like you're dancing on air. Comes in full sizes only so that you can tailor your fit as snug as you please. 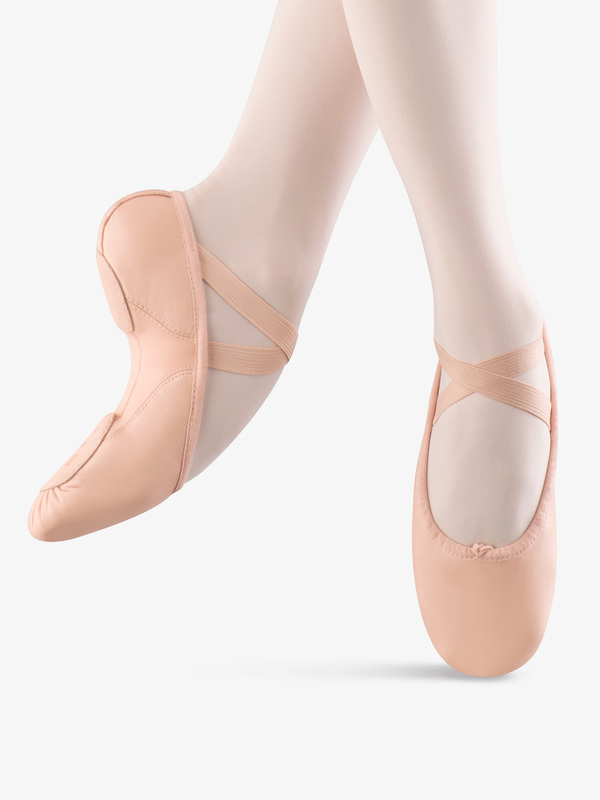 This premier canvas ballet shoe also has a split-sole leather construction, cotton lining, and a stretch binding that eliminates the need for a drawstring. Available in Pink and new Flesh color. Compare this shoe to the competition. A BEST VALUE Product. 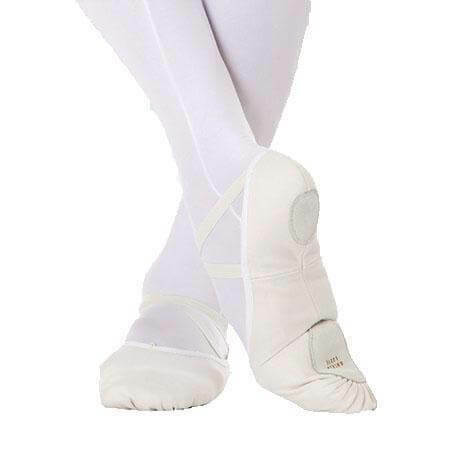 Theatricals Girls SofTouch Canvas Stretch Split-Sole Ballet Shoes T2915C: Feel the floor in absolute comfort with our SofTouch-inch split sole canvas and spandex ballet shoe. 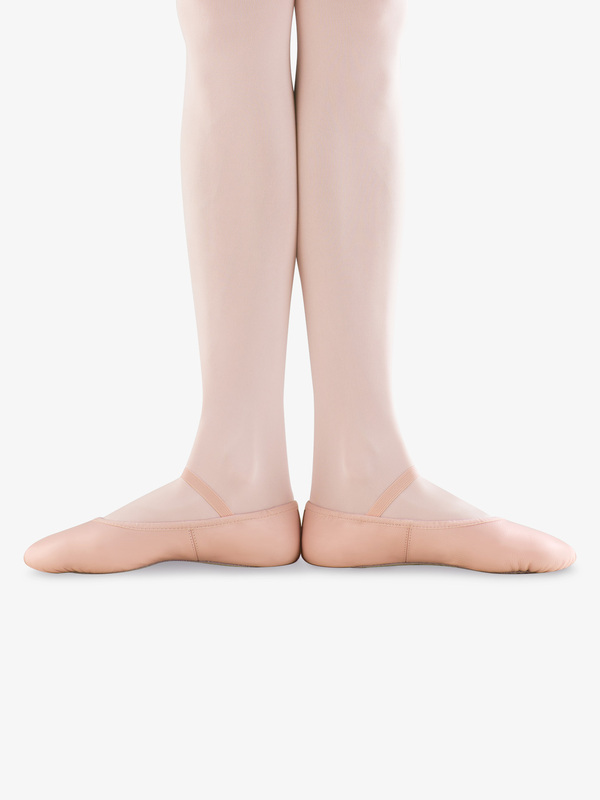 The soft stretch spandex insert between the heel and sole will hug your arch while you feel like you're dancing on air. Comes in full sizes only so that you can tailor your fit as snug as you please. 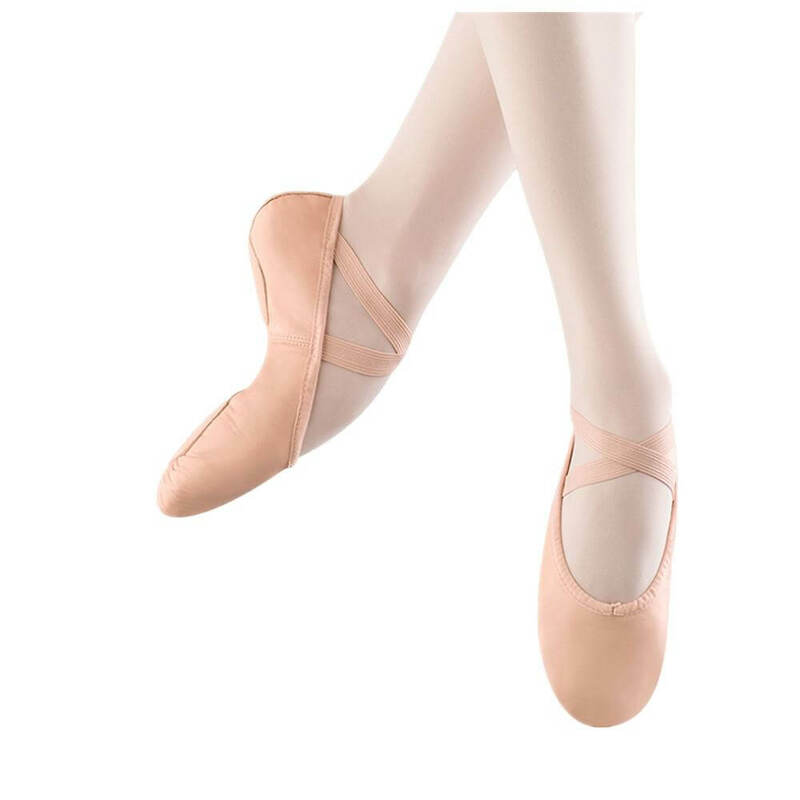 This premier canvas ballet shoe also has a split-sole leather construction, cotton lining, and a stretch binding that eliminates the need for a drawstring. Available in Pink and new Flesh color. Compare this shoe to the competition. A BEST VALUE Product. 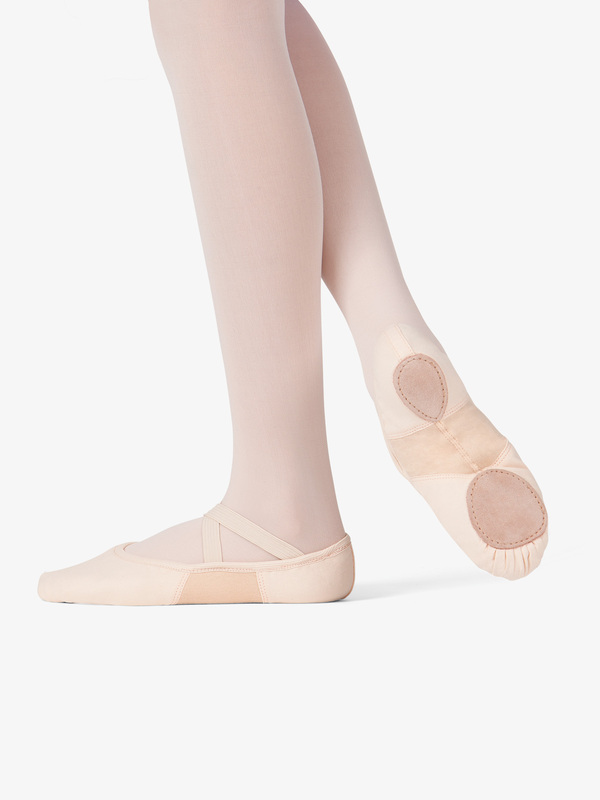 Capezio Adult Extend Seamless Barefoot Ballet Shoes H22U: Feel like you're dancing barefoot in these seamless ballet shoes. 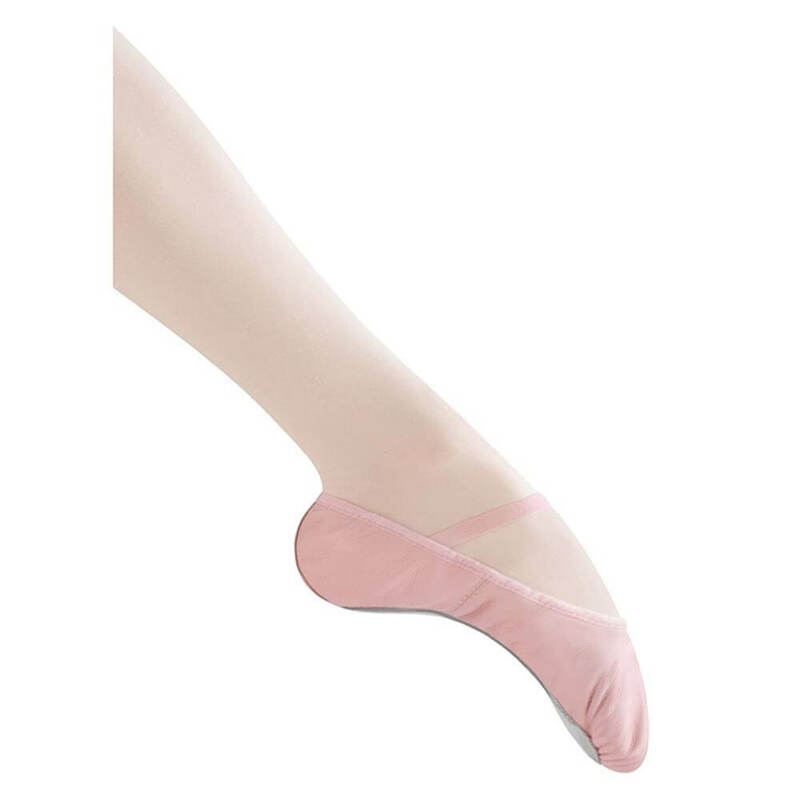 Extend-inch provides the softness of a sock and the support of a shoe with the stretch Nylon/Spandex material and the toe and heel pads that prevent slipping. Pair with the Arch-inch elastic band for extended support every time. 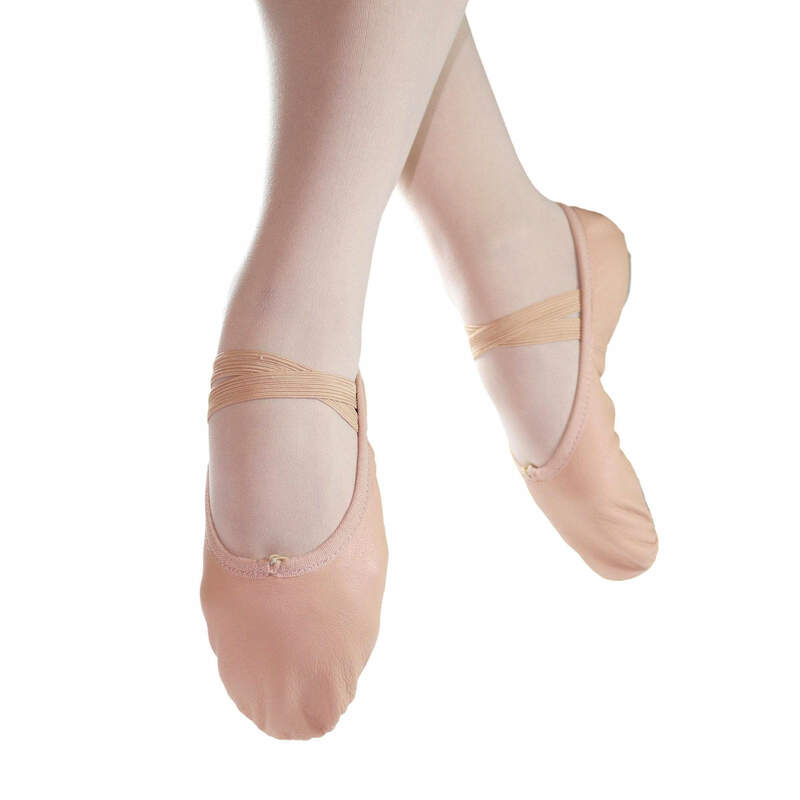 More ballet slippers and shoes at Discount Dance Supply and Danzia.